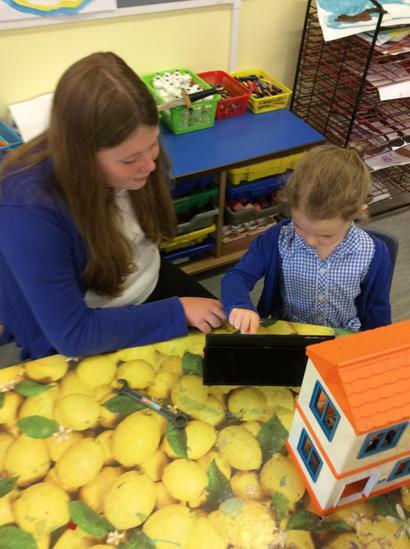 is the teacher and Miss Kidner and Mrs Dyble are Inclusion assistants. 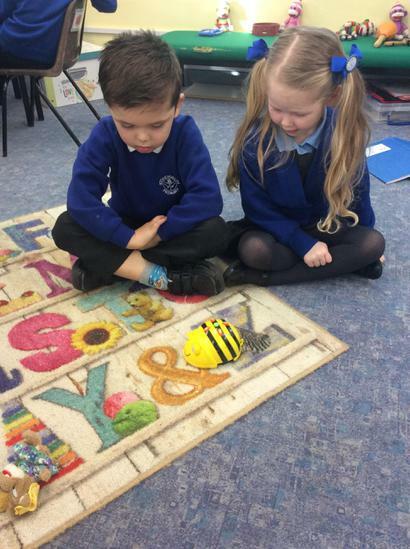 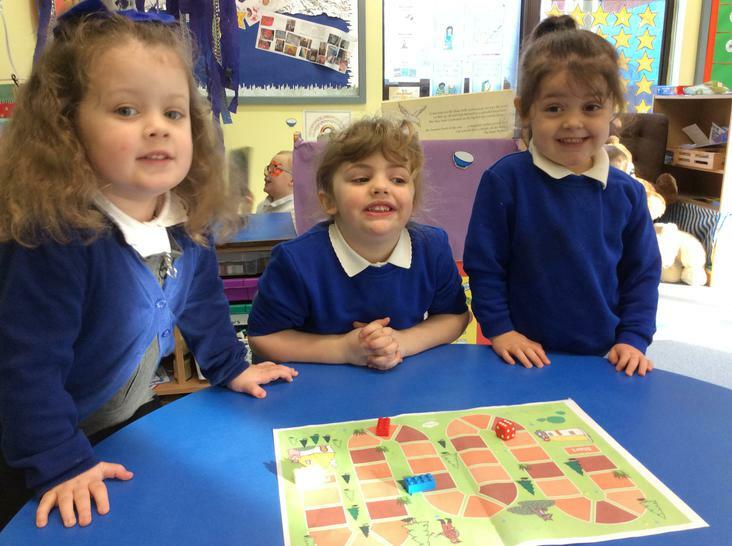 learn through exciting play and interacting with each other. 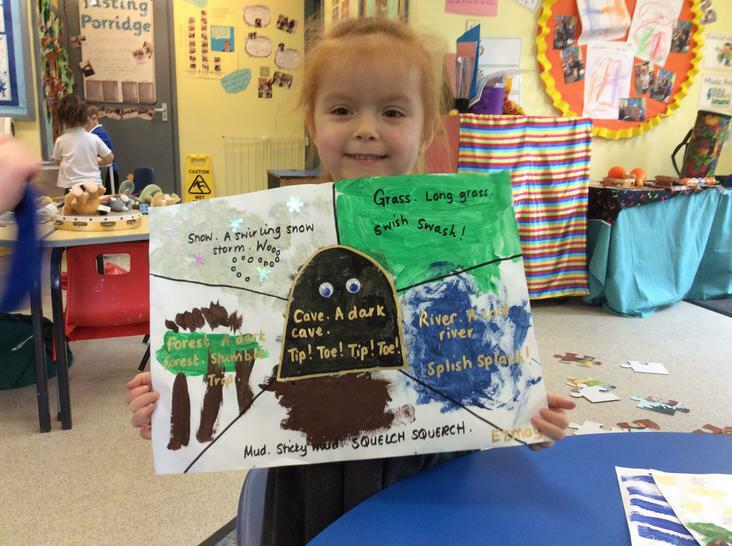 These are our learning themes in Early Years this Year! 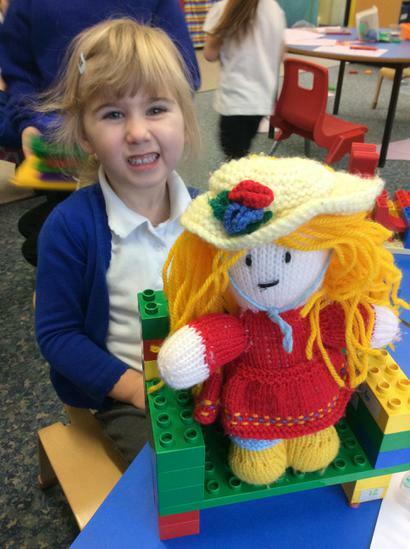 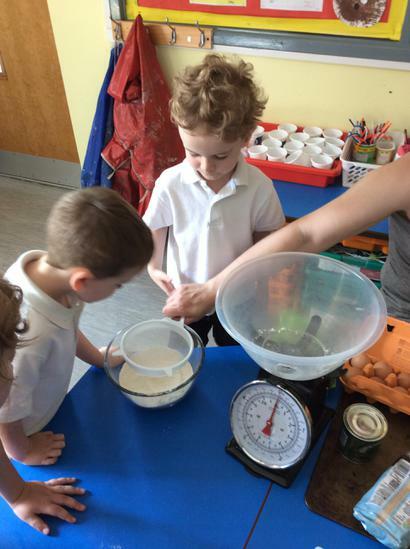 This half term the children will be learning about: growing, E - Safety, recipes and baking, summer time and Kitty Lacey. 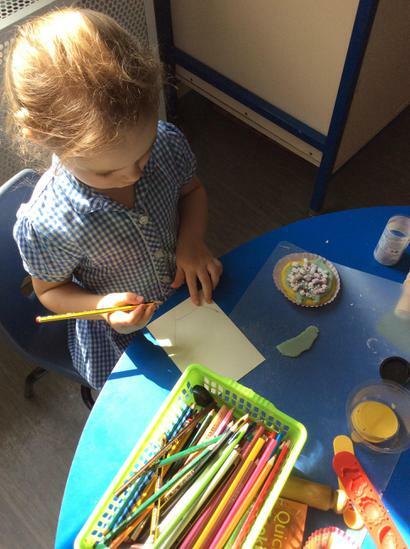 W/B 26/6/17 - This week the children in Nursery and Reception have enjoyed learning all about summer. 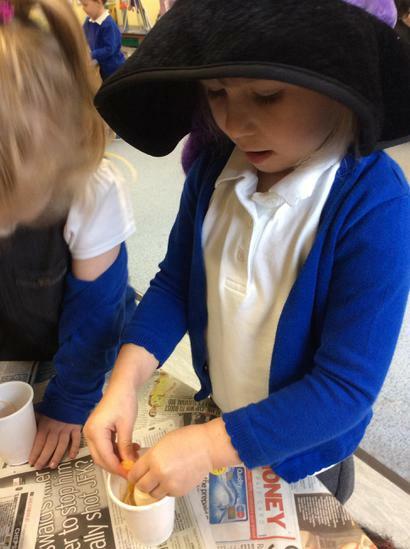 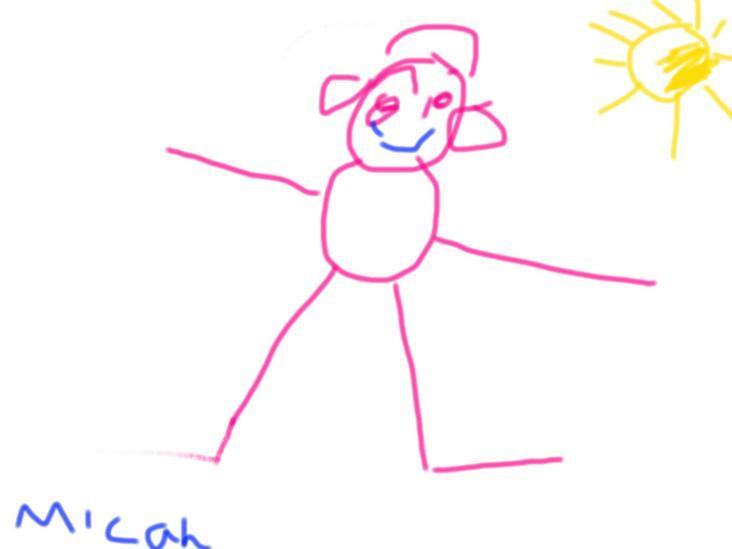 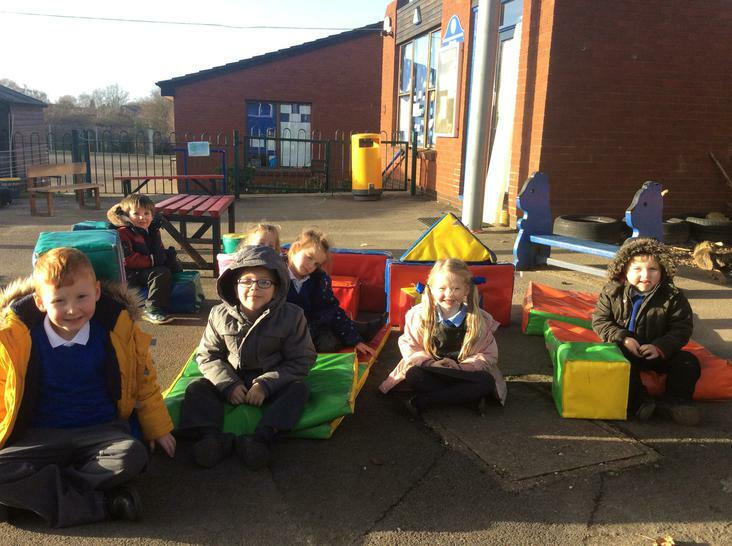 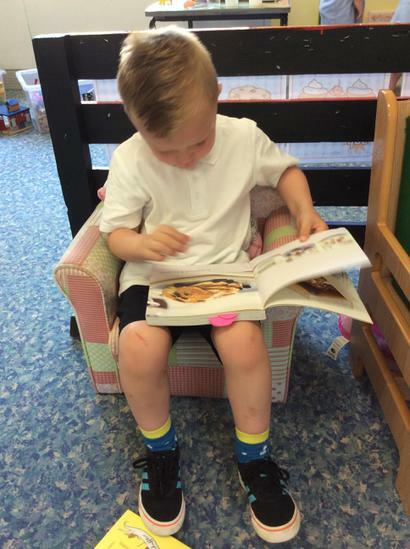 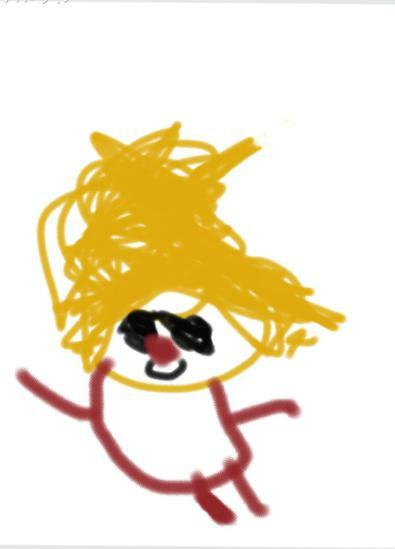 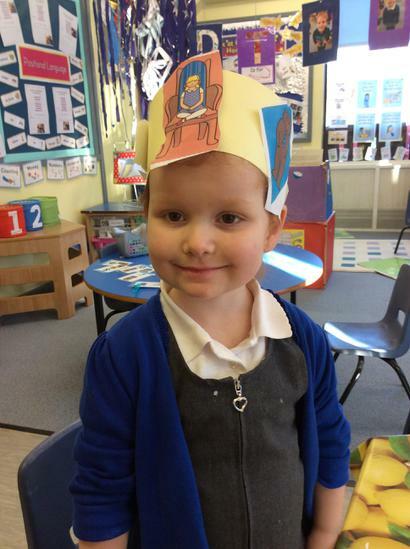 In Nursery the children looked at a non-fiction book on how to stay safe in the sun, role played what they needed to do before going out in the sun and made sun safety posters. 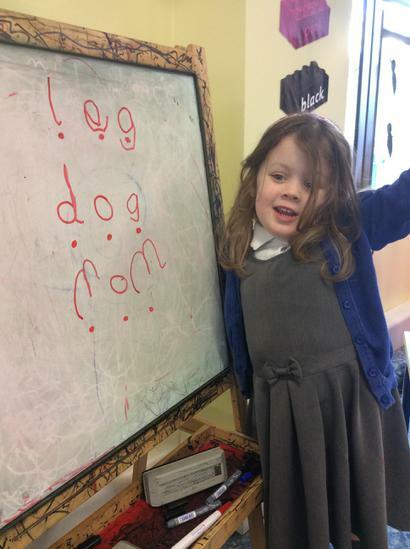 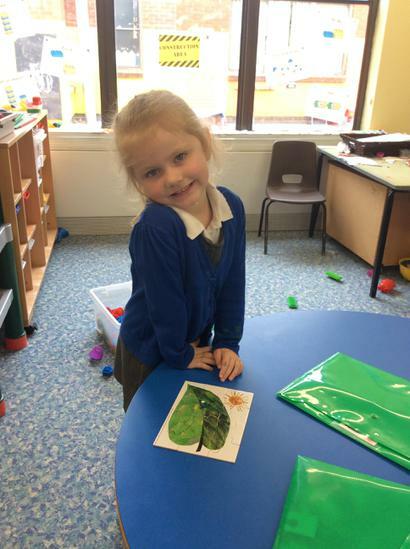 Reception children wrote facts about summer and acrostic poems in literacy. 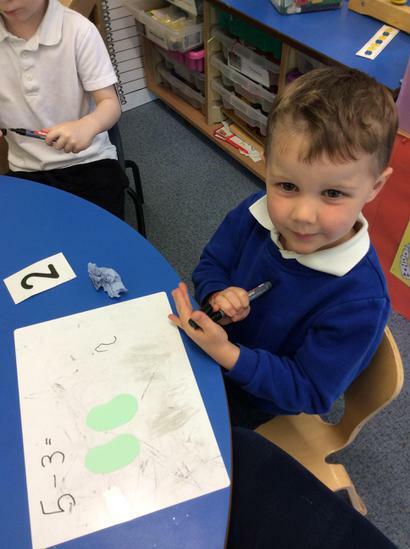 In Maths - addition, subtraction and division using ice cream cones. 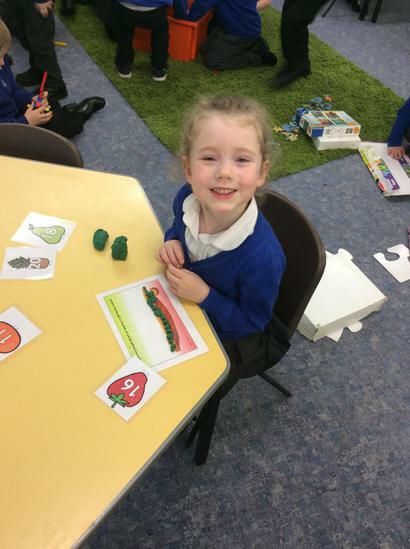 Within in both areas their independent learning was focused around summer time. 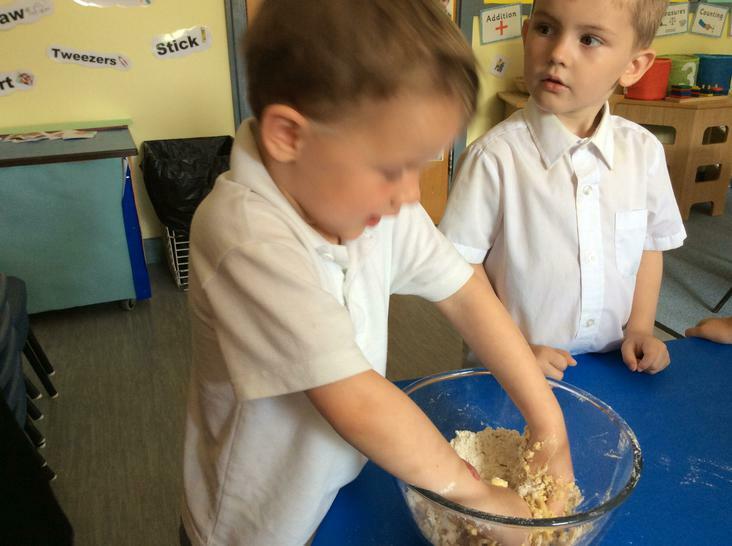 W/B 19/6/17 - The children in Reception and Nursery have enjoyed learning all about recipes and baking. 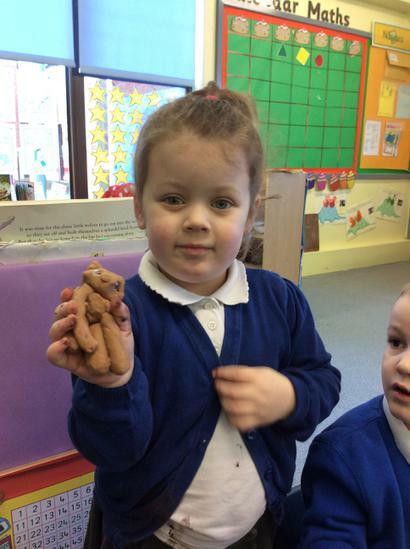 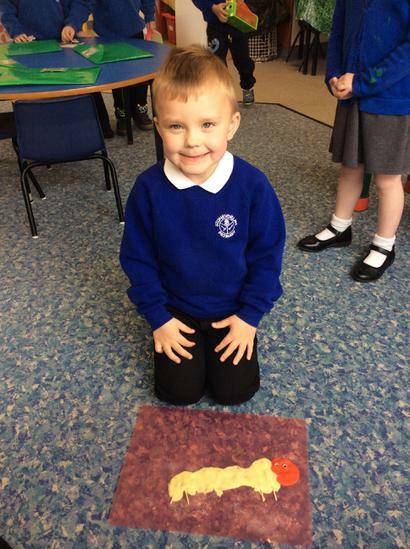 Nursery have made gingerbread men (following on from the story) and cheese straws. 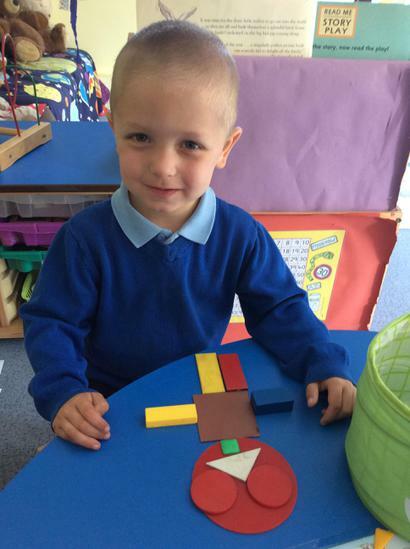 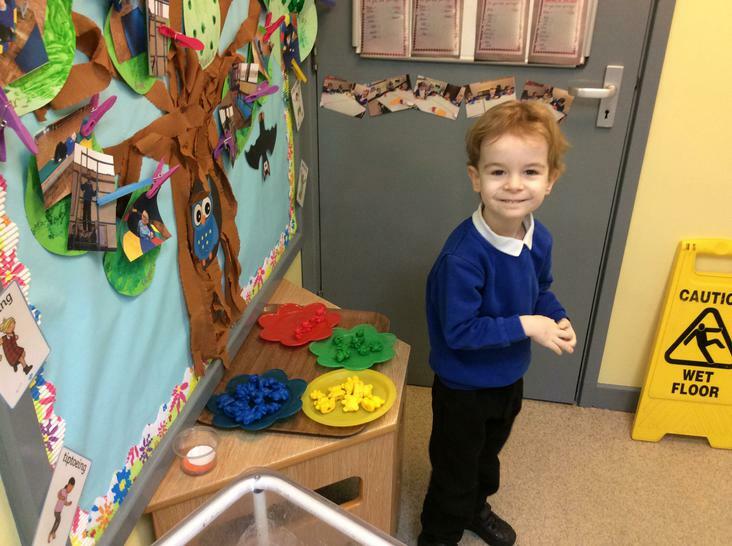 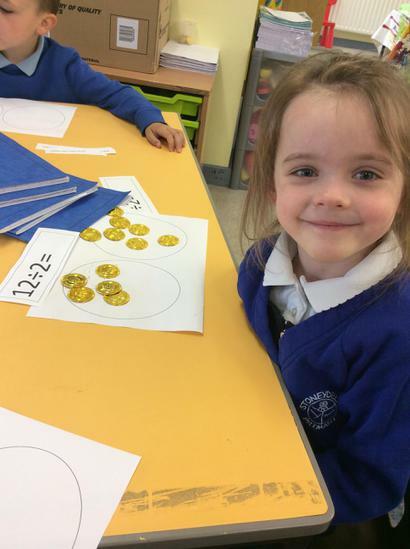 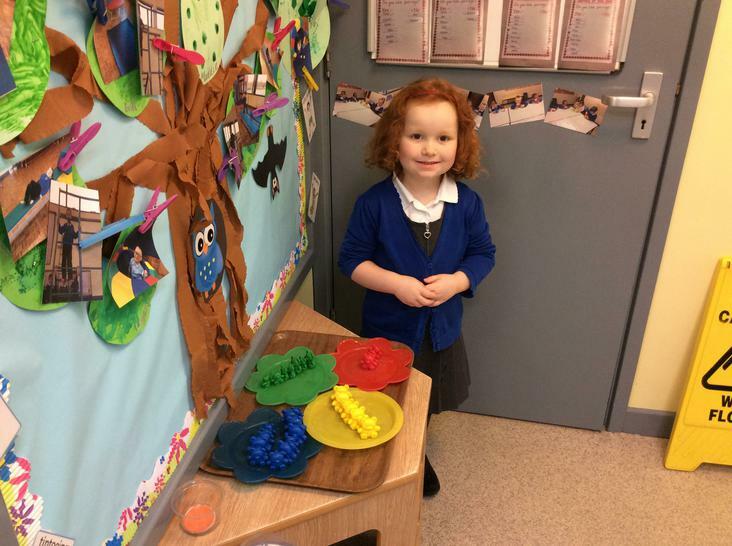 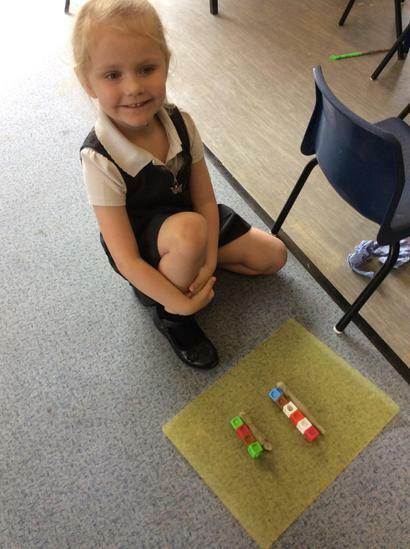 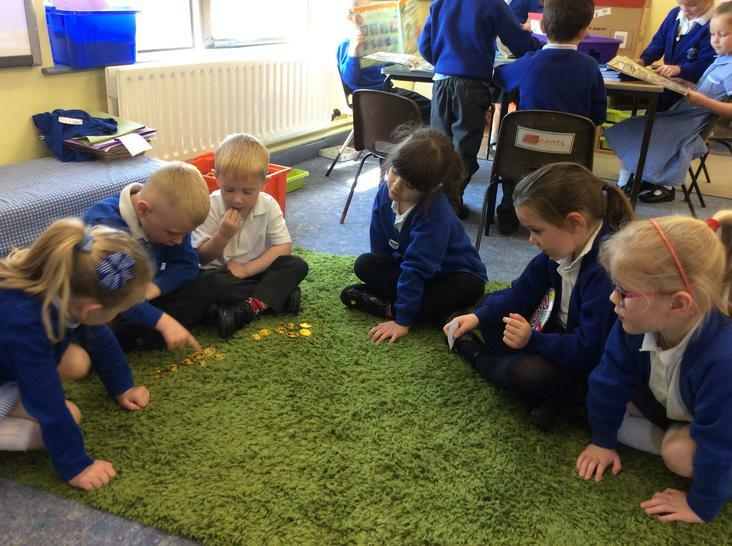 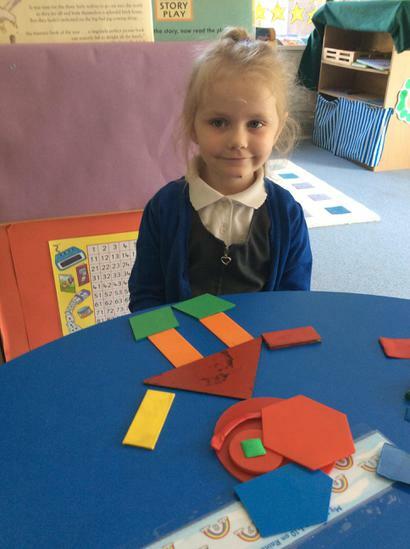 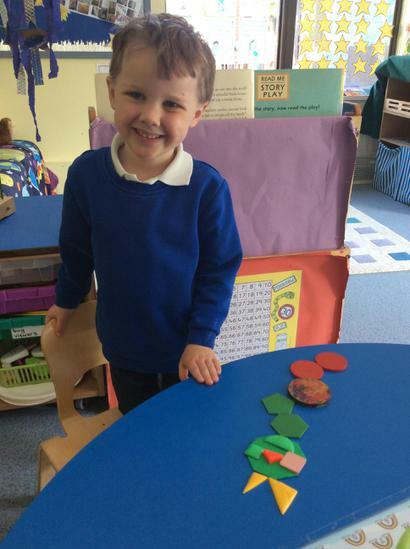 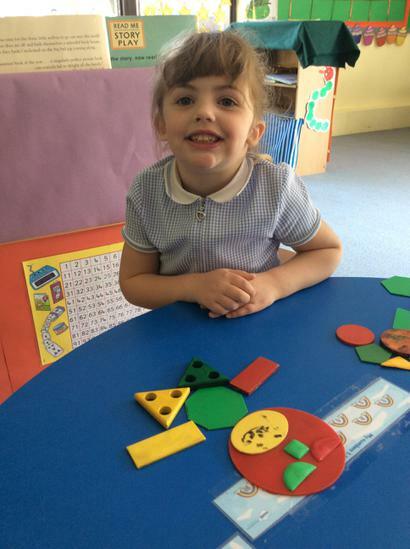 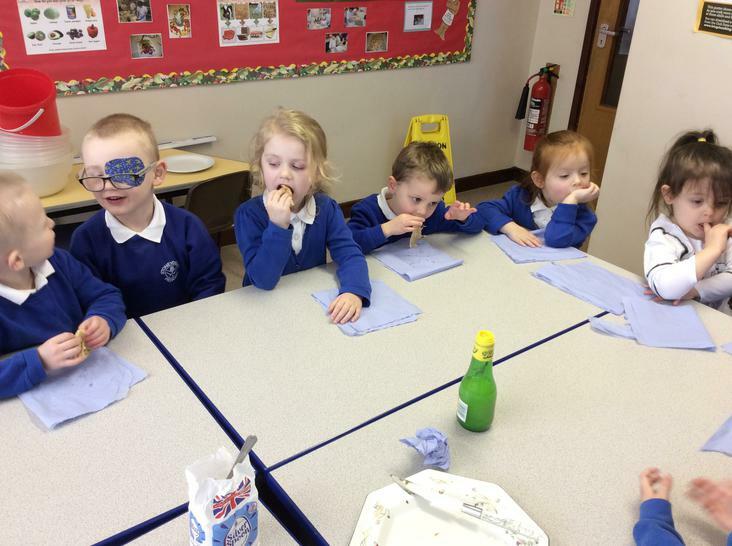 Reception have made Numicon biscuits and pizzas. 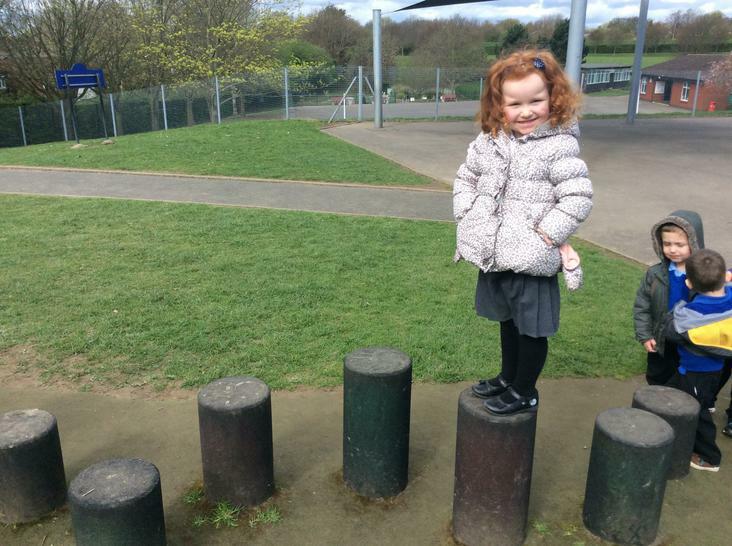 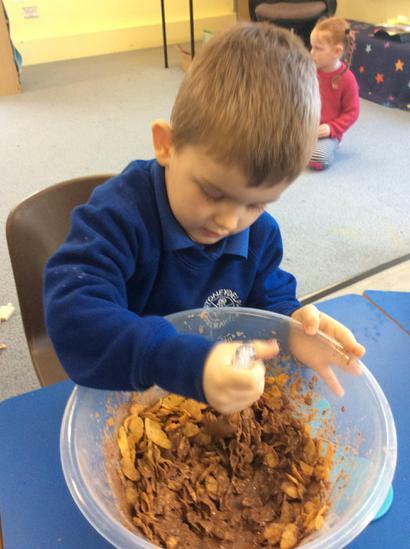 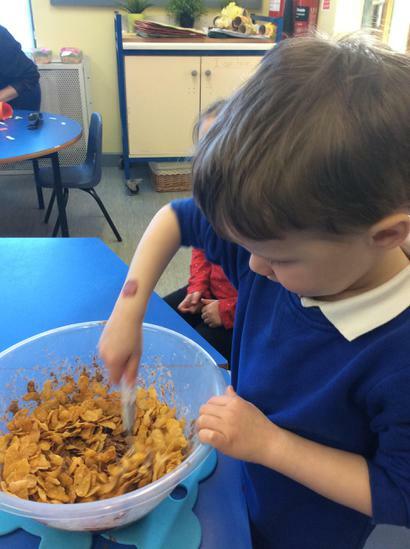 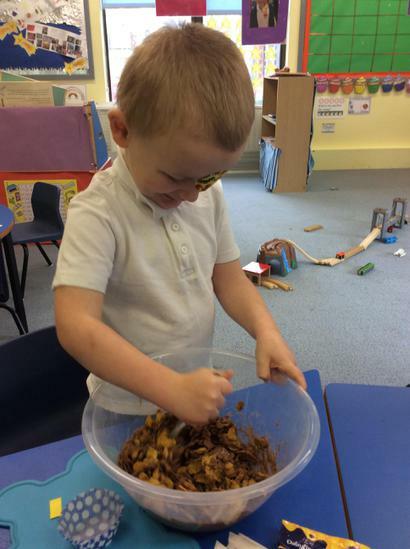 All the children have been given many opportunities to write out recipes, pretend to make cakes in the role play area, use cooking utensils with different foods and many more planned activities. 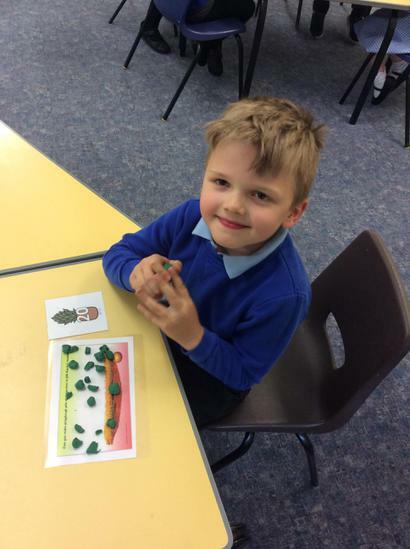 W/B 5/6/17 - The children in Nursery have been learning all about growing. 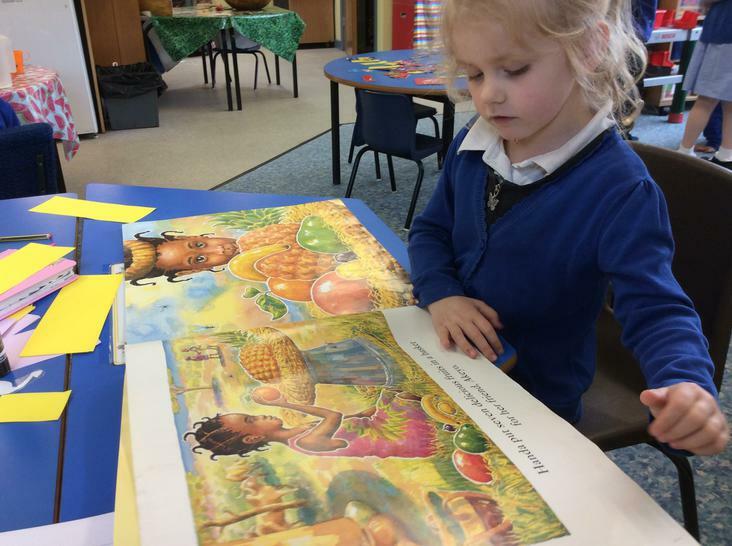 The story of Jack and the Beanstalk was read to the children and many activities have been around this story. 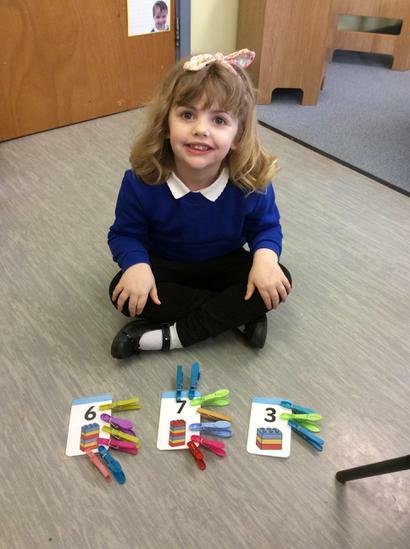 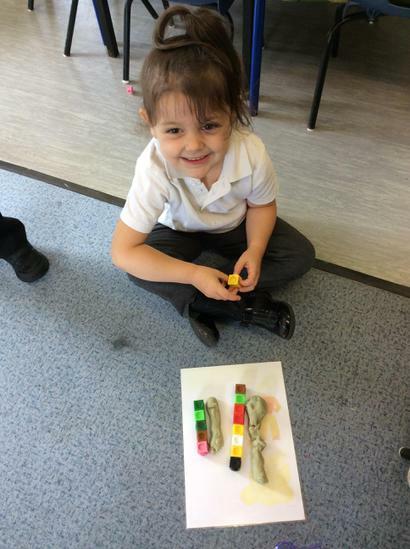 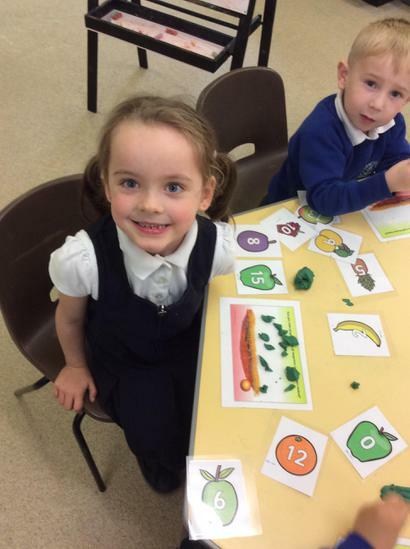 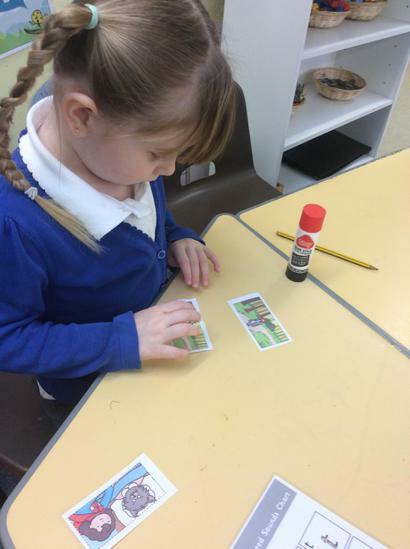 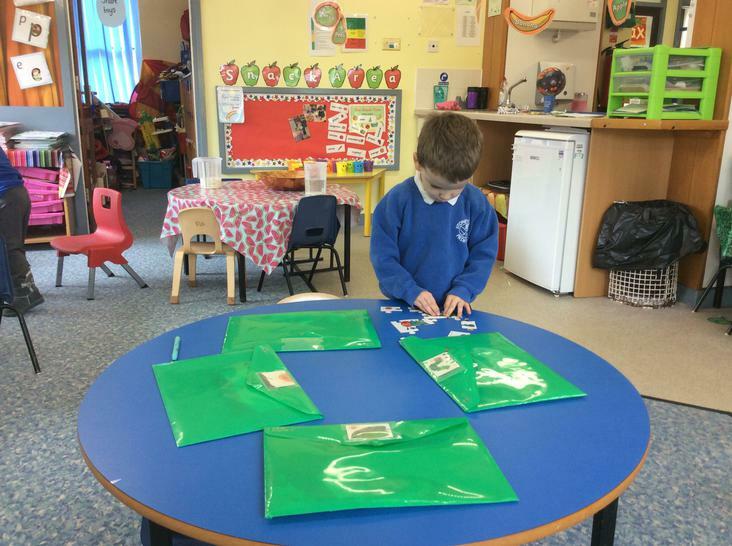 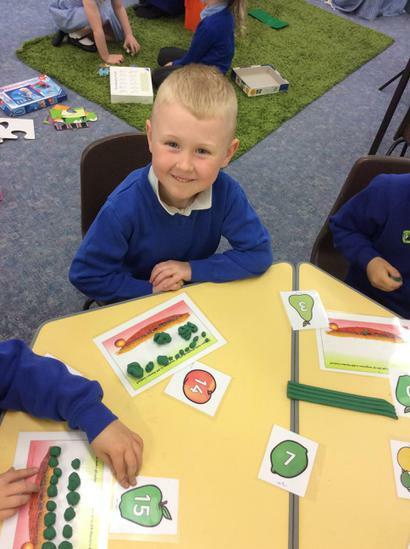 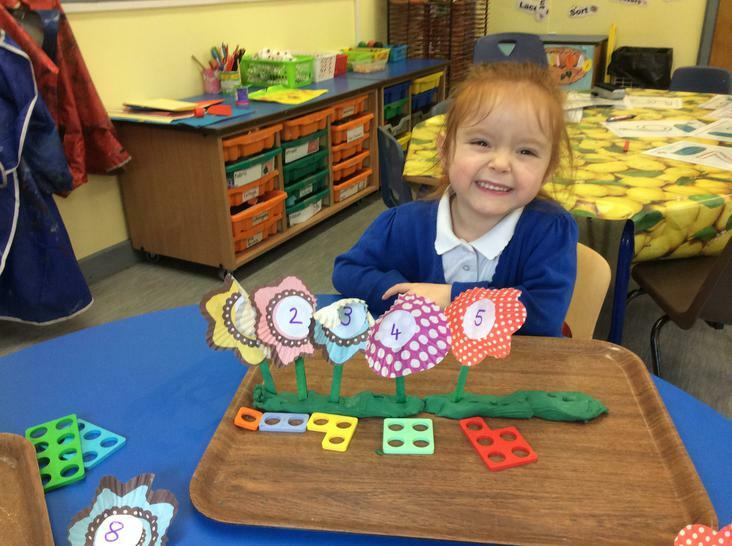 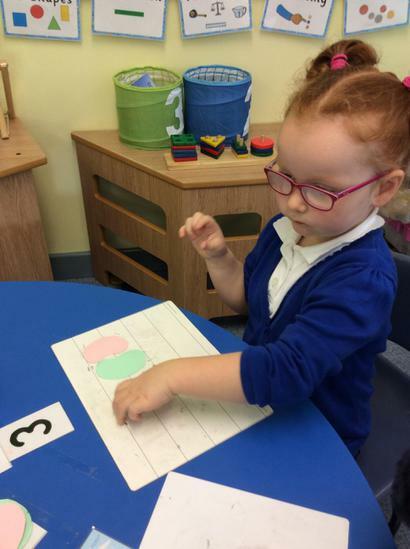 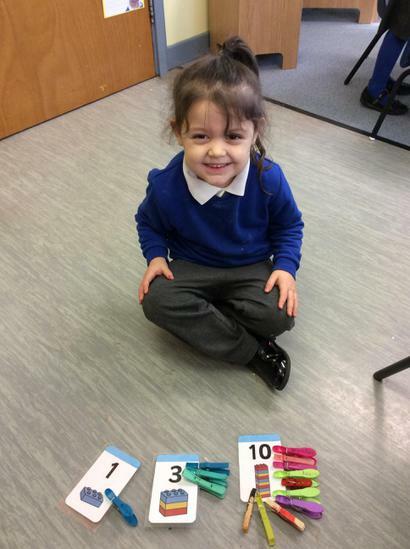 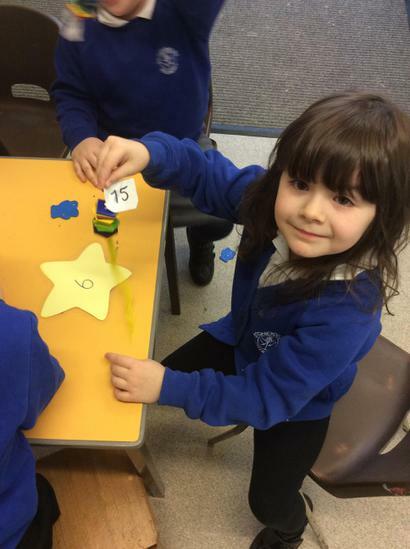 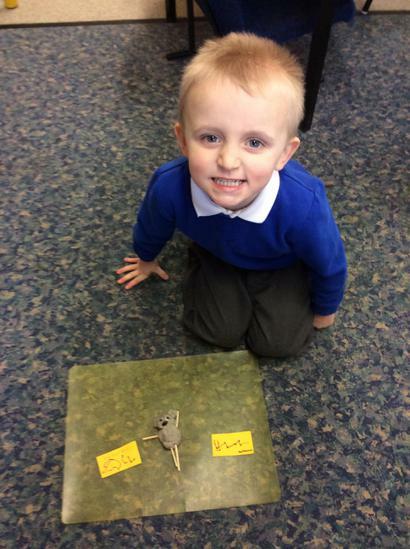 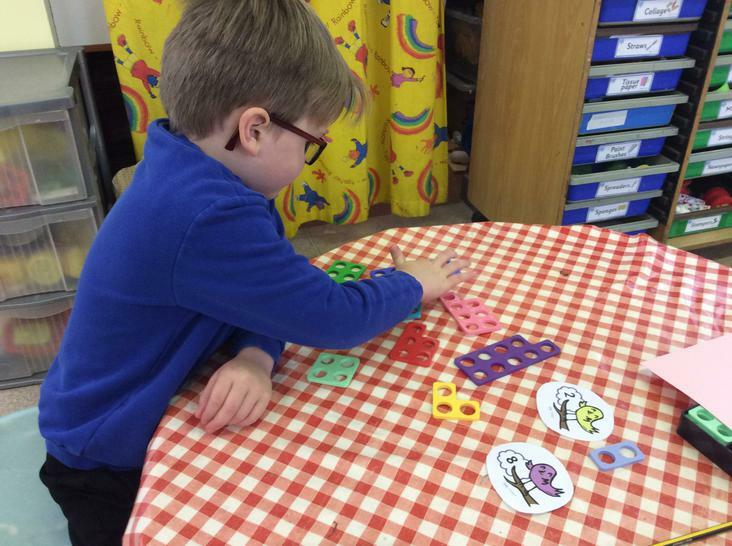 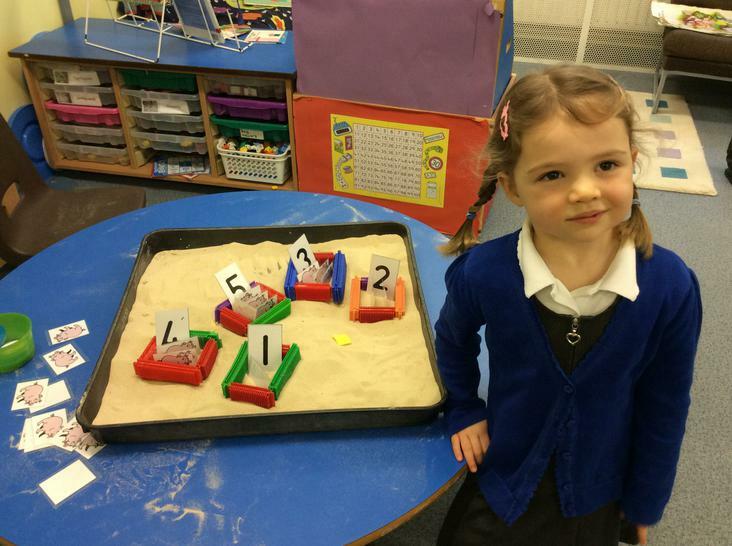 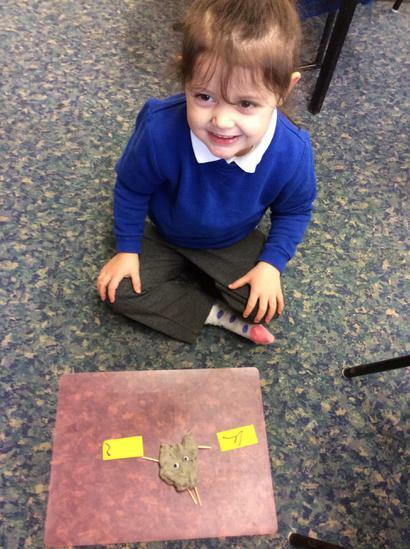 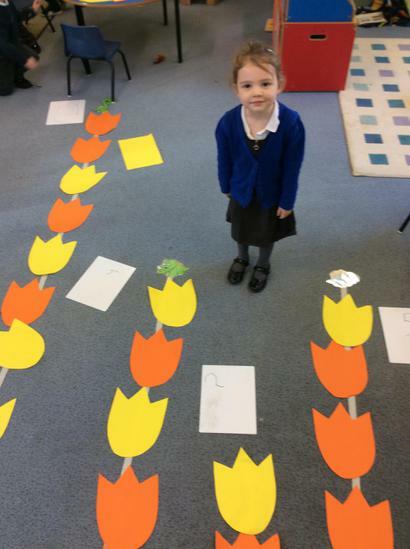 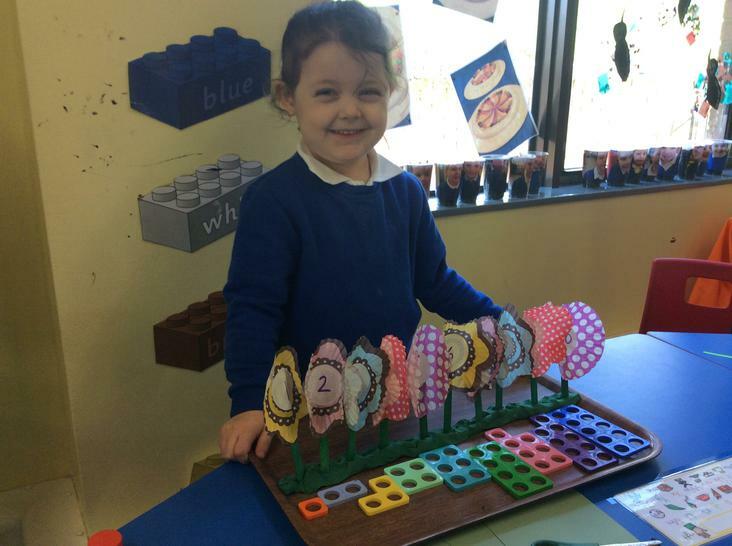 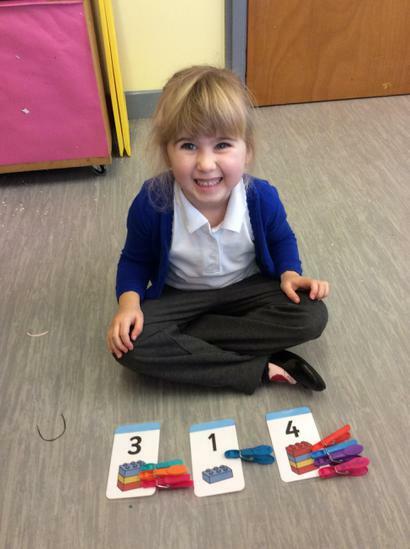 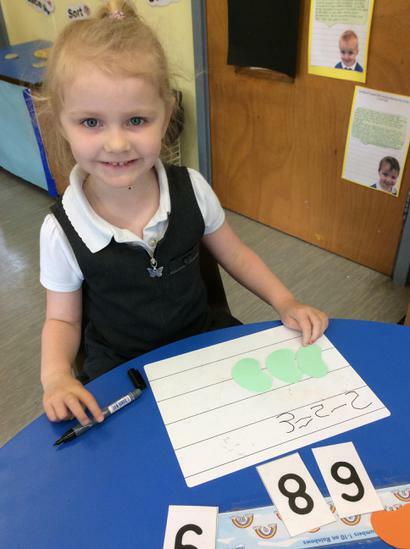 For example; counting, sharing and subtraction with beans, painting a picture from the story and planting beans. 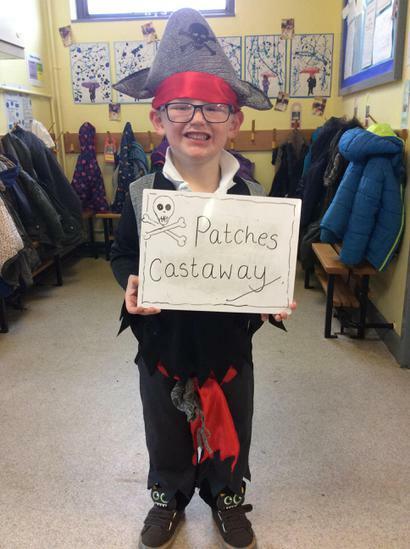 This half term the children will be learning about: Life cycles, Aliens/space (Reception), Pirates, Handa's Surprise and Disney. 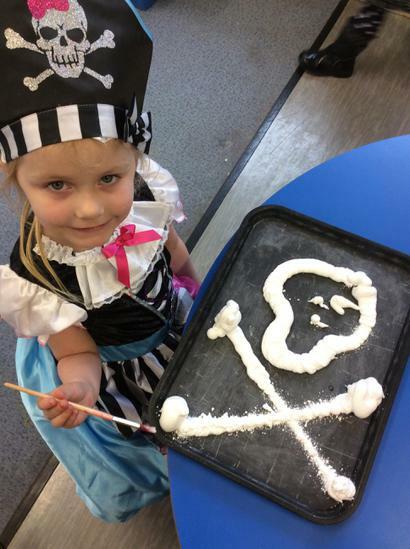 W/B 8/5/17 - This week the children in Nursery have been very busy learning all about Pirates. 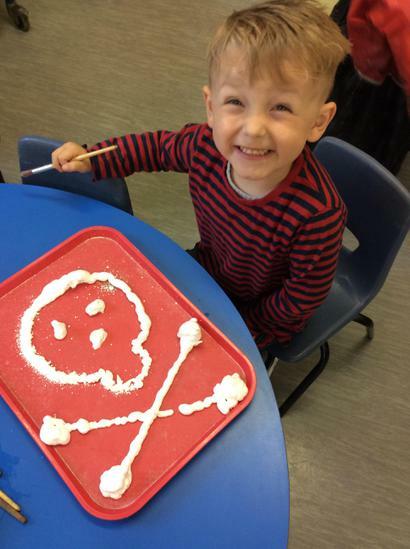 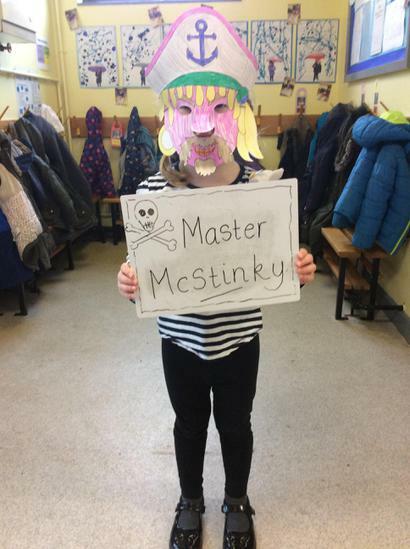 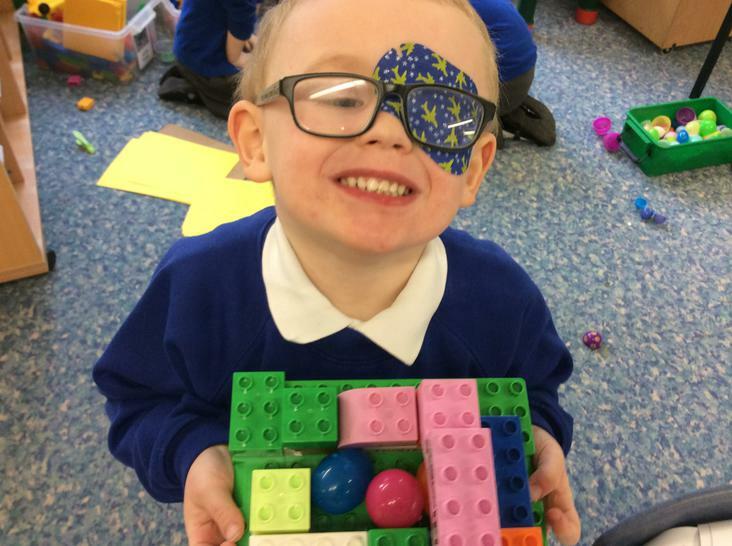 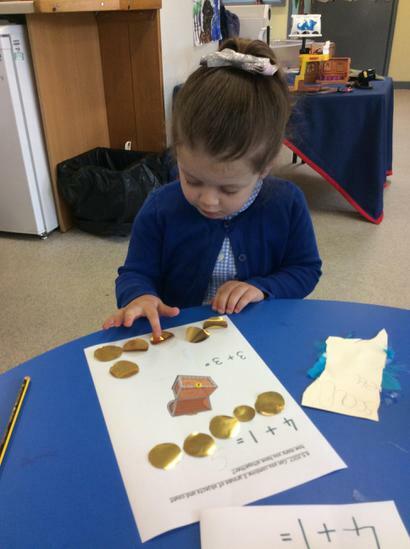 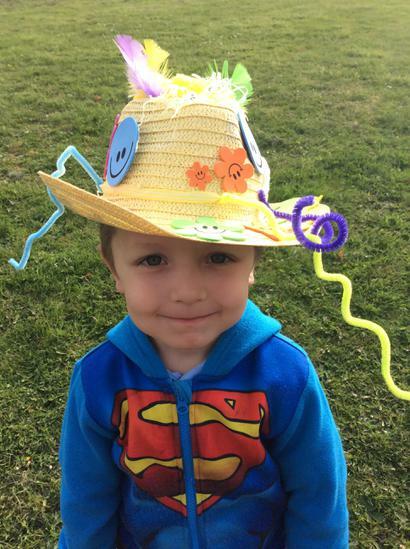 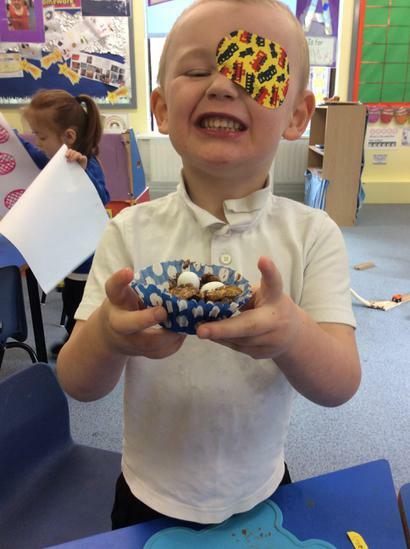 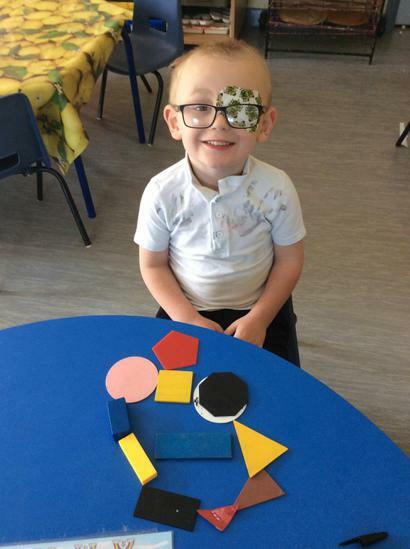 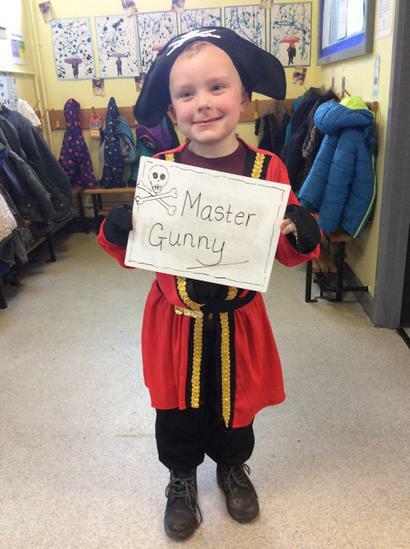 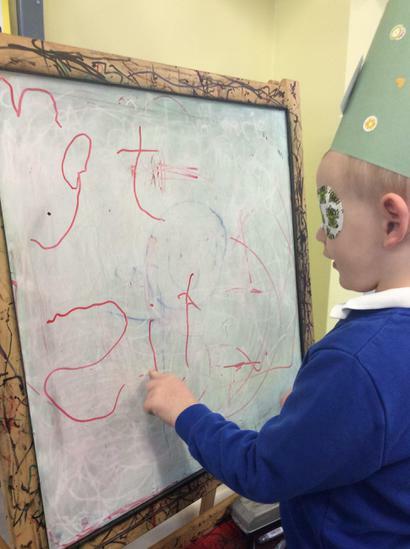 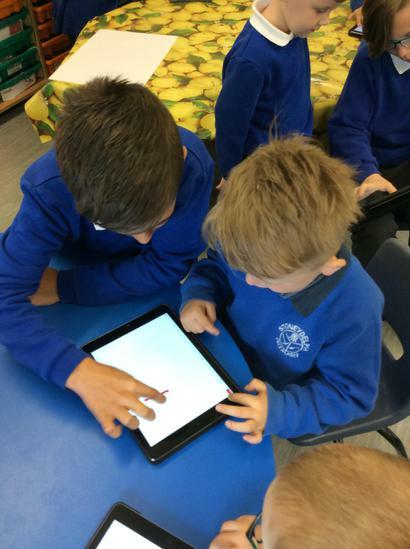 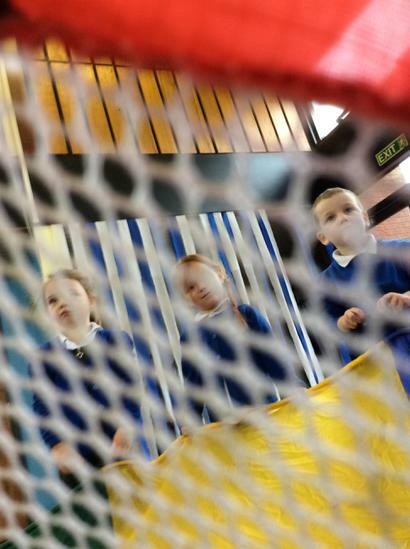 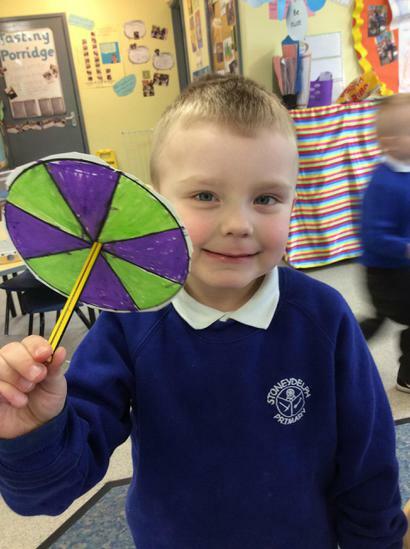 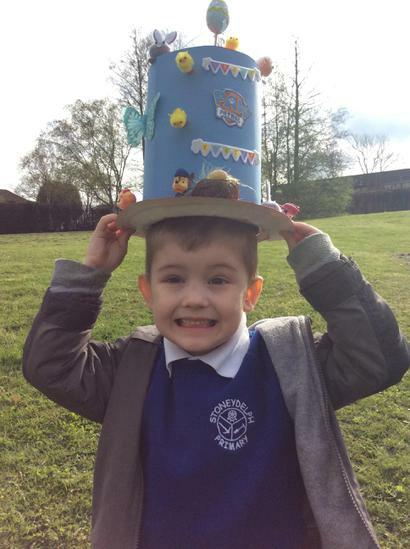 They have really enjoyed all the planned activities for example: counting treasure, writing a message in a bottle, paper plate Pirate faces, iPad drawings of a Pirates and many more activities. 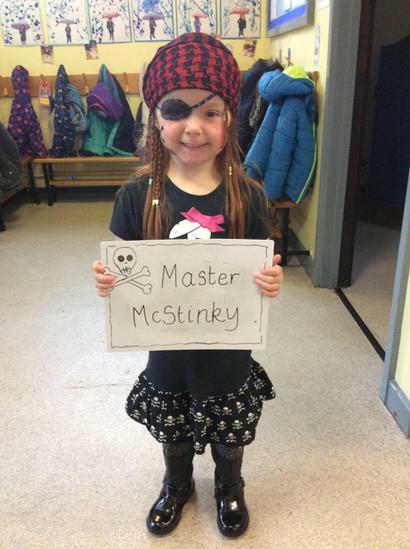 Friday was very exciting to, as the children became real Pirates Aha!!! 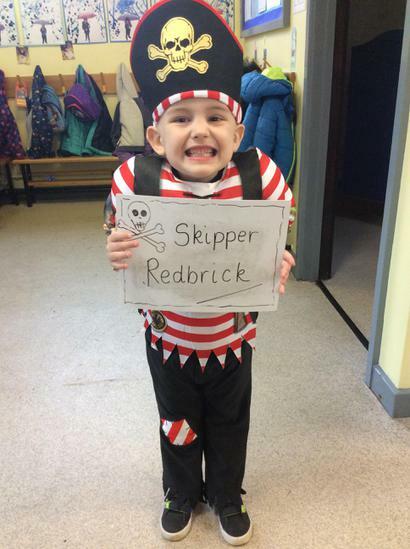 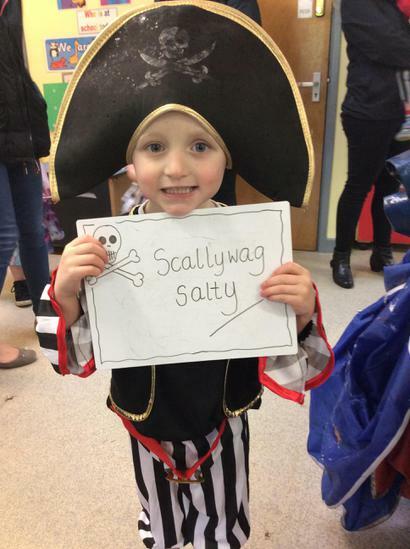 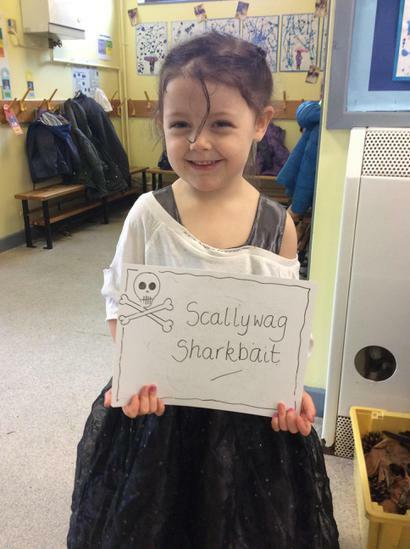 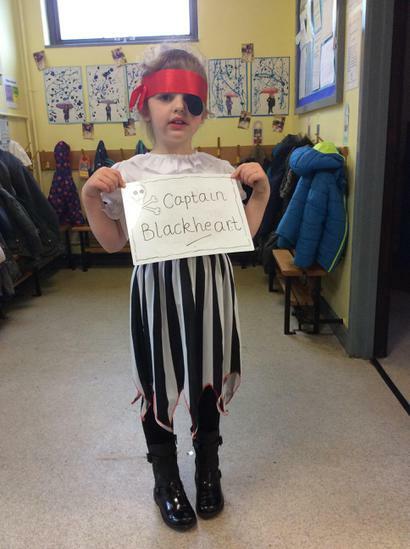 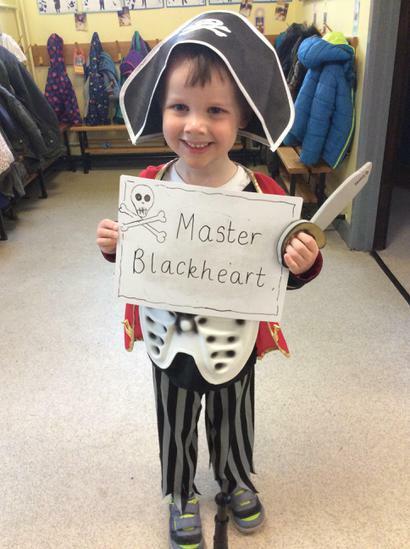 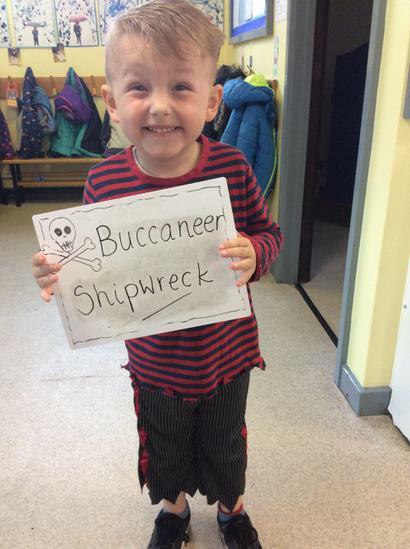 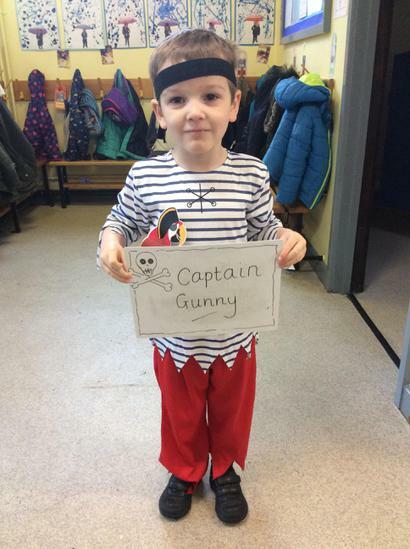 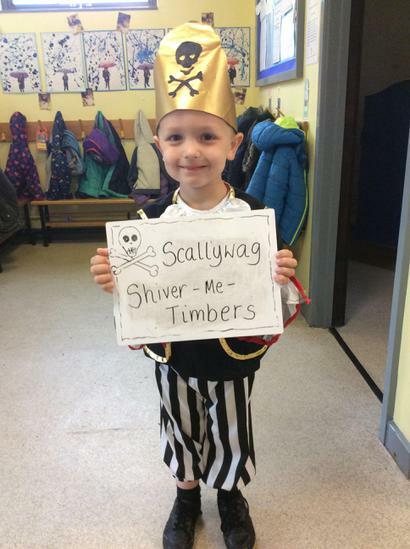 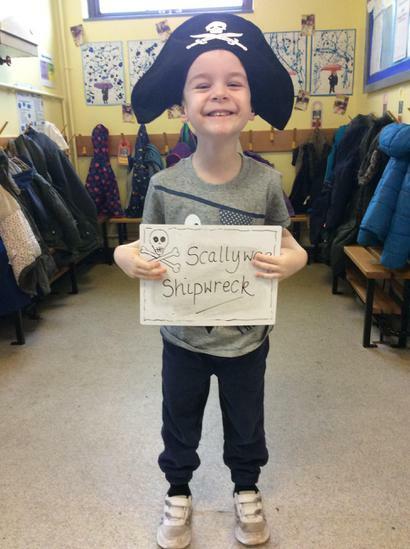 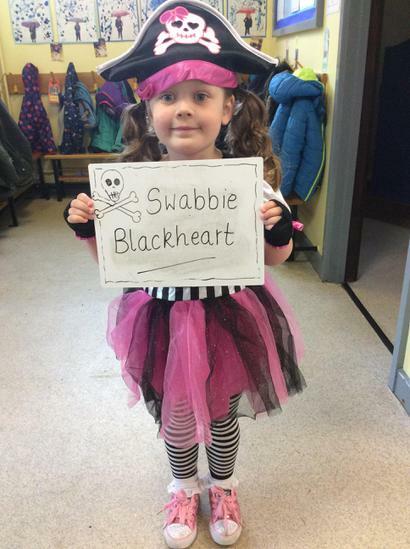 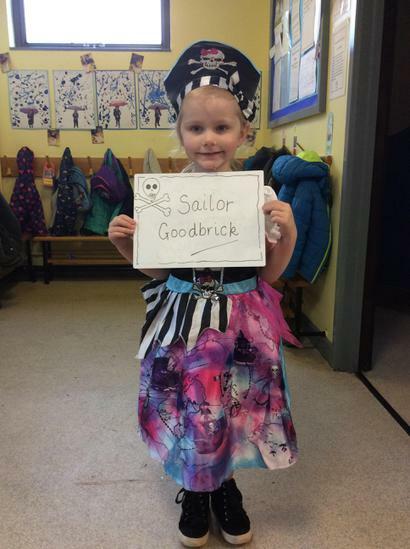 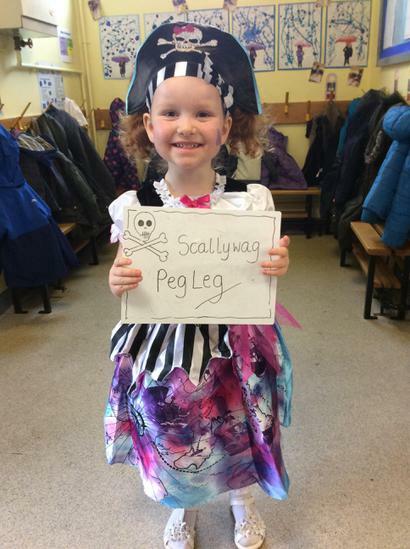 Reception children have also been learning about Pirates this week. 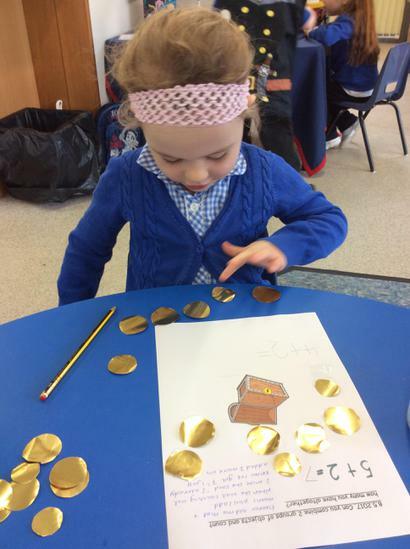 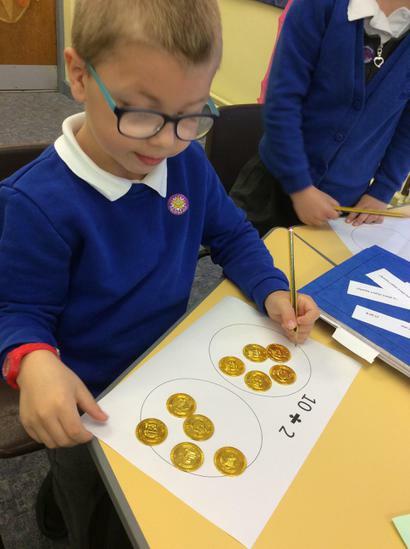 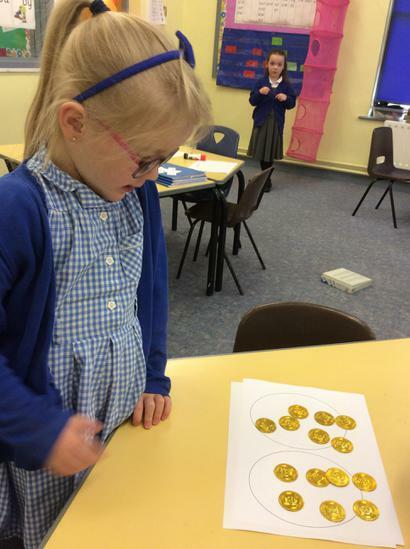 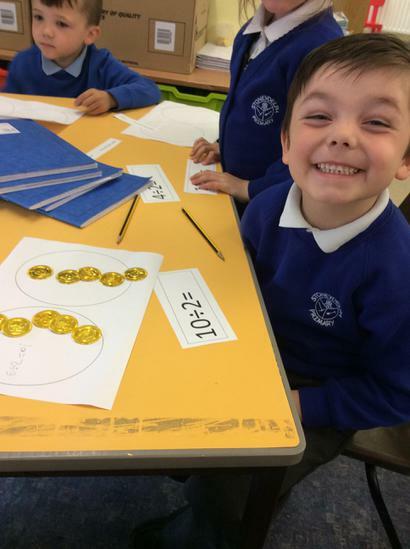 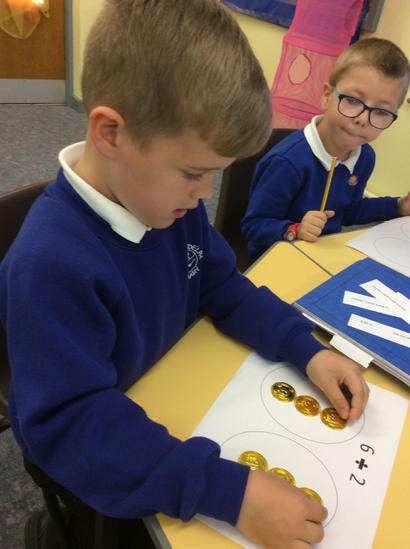 They have been learning to share coins, describing their own pirate, wanted posters and many more fun learning activities. 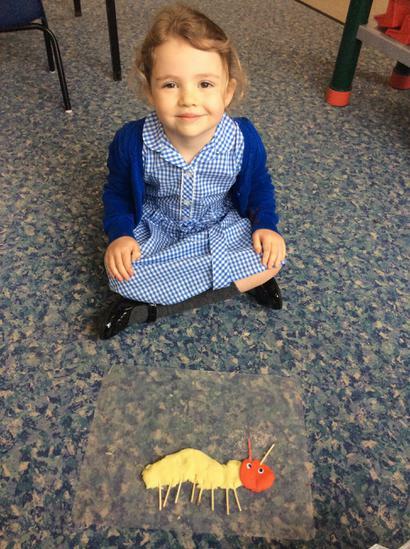 W/B 24/4/17 and 1/5/17 Nursery children have been learning all about the life cycle of a butterfly. 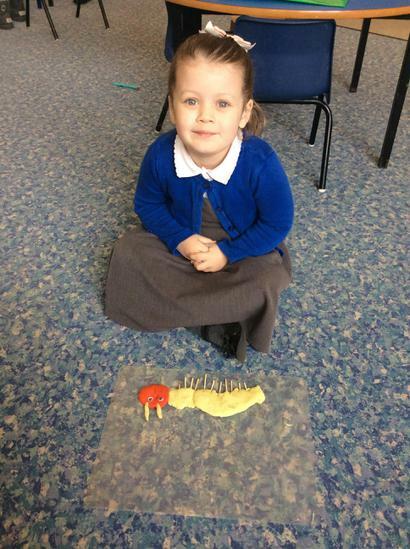 Our focus has been around the story - The Very Hungry Caterpillar. 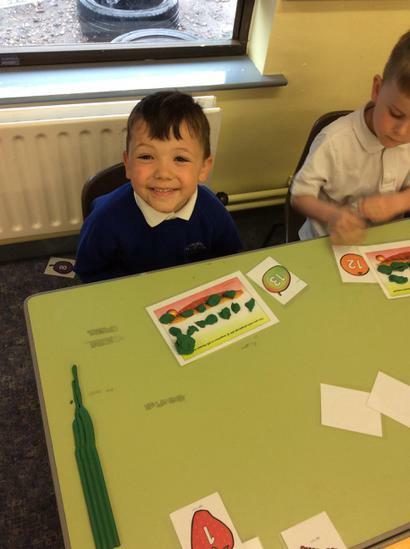 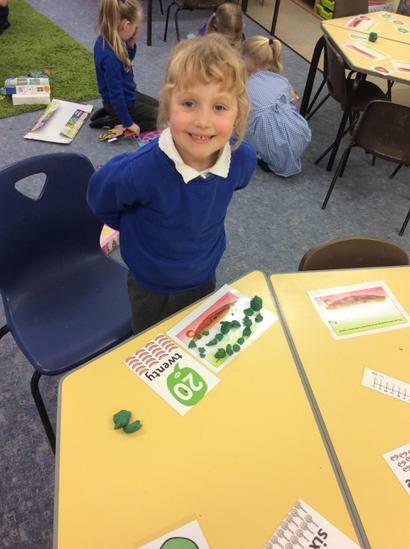 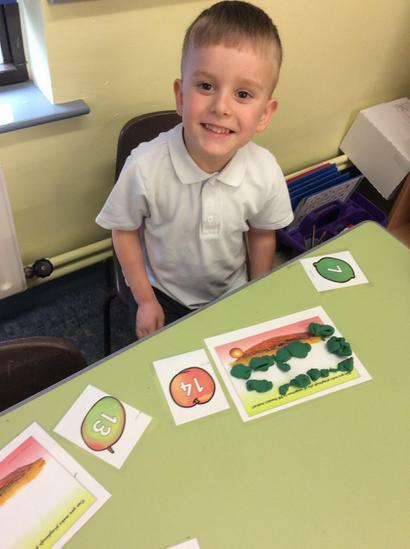 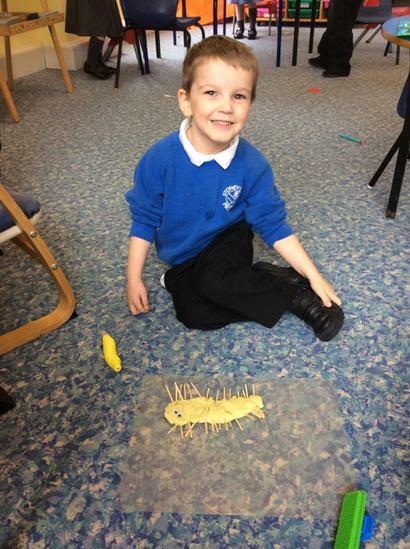 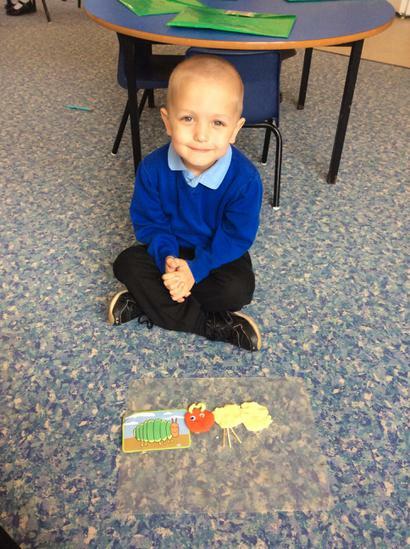 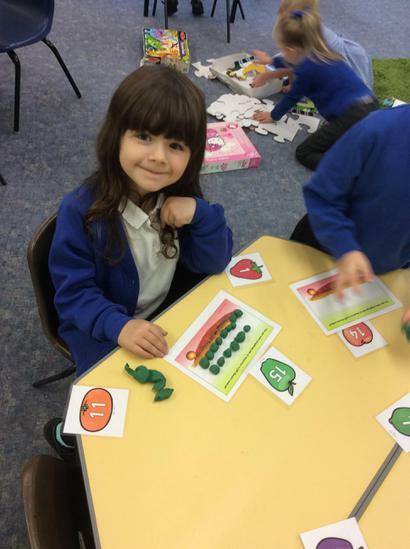 Some of the activities to help with the children's learning were: playdough caterpillars, pattern threading caterpillars, number recognition - caterpillar body parts and drawing and labelling the life cycle. 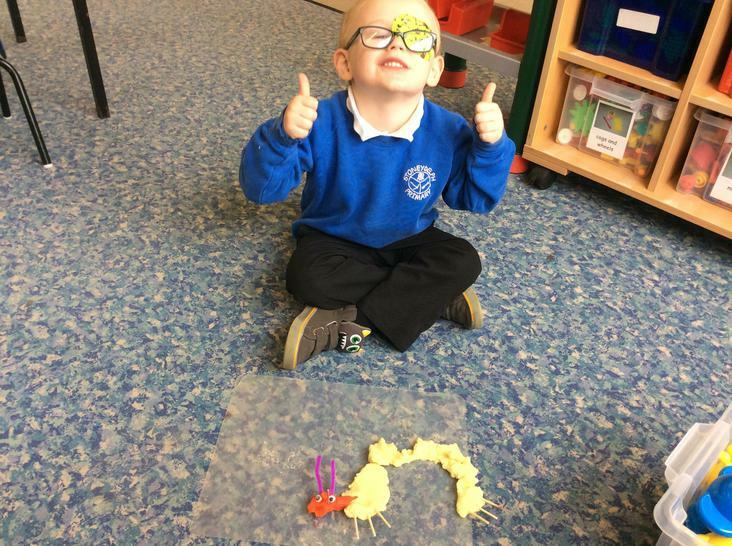 Mrs Parry has ordered some caterpillars so hopefully they will arrive soon for the children to experience their life cycle in our Nursery. 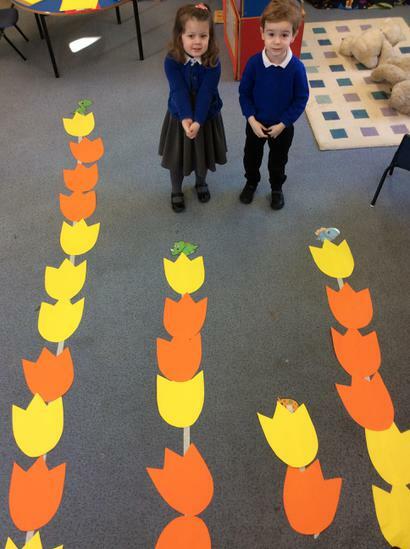 This half term the children will be learning about: We're going on a Bear Hunt, The Tiny Ant and growing - Plantzilla. 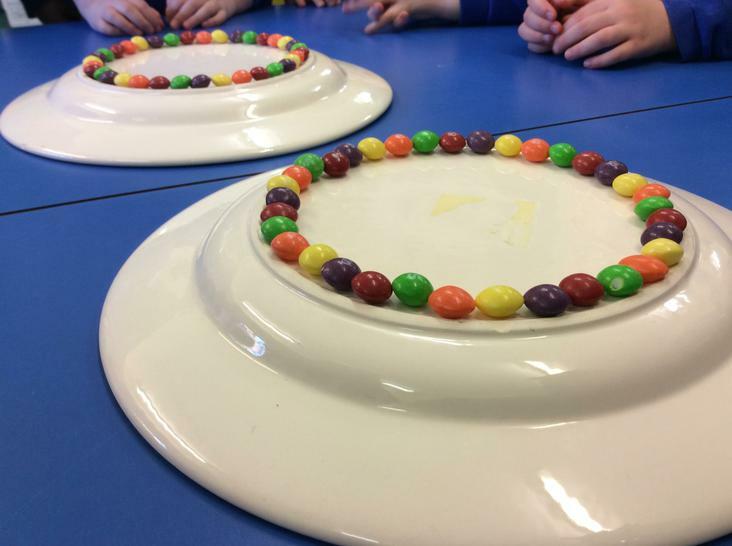 W/B 13/3/17 A whole school theme - Science week. 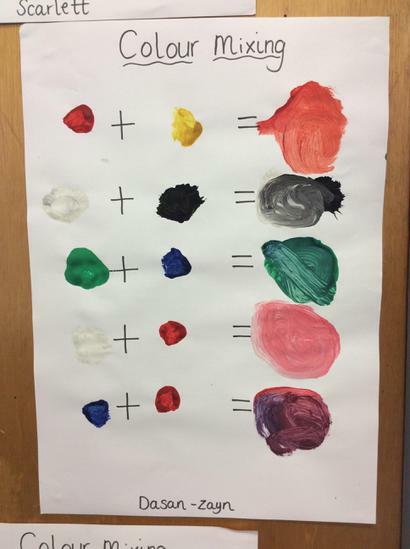 Nursery and Reception will be looking at colour changes and the book - The Day the Crayons Quit. 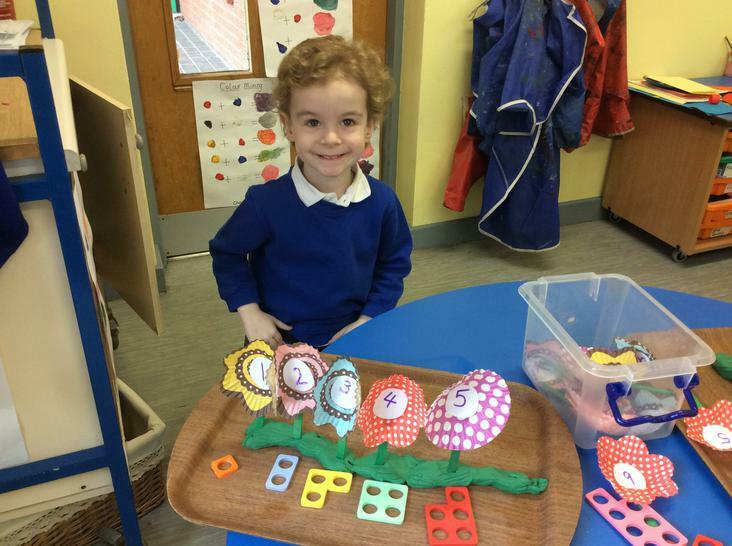 We will also enjoy activities planned around Mothers Day, Spring and Easter. 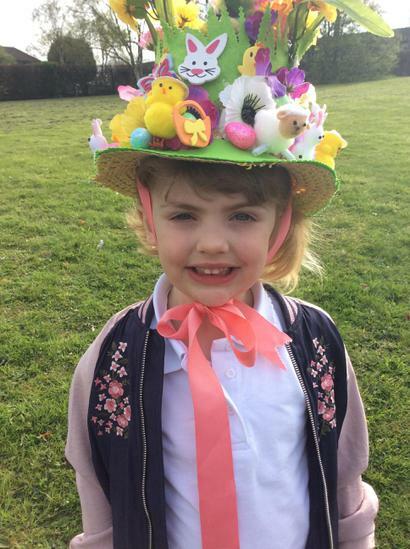 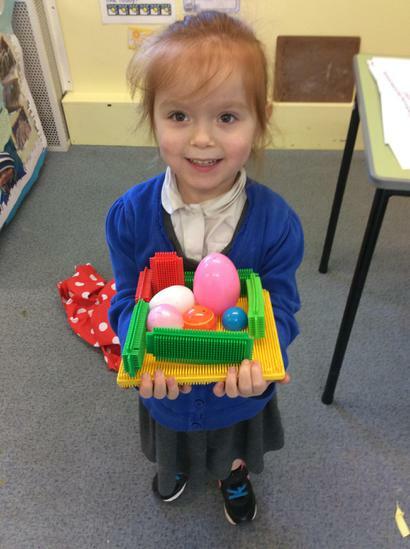 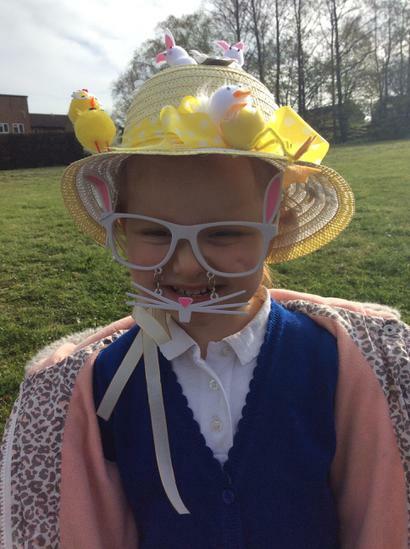 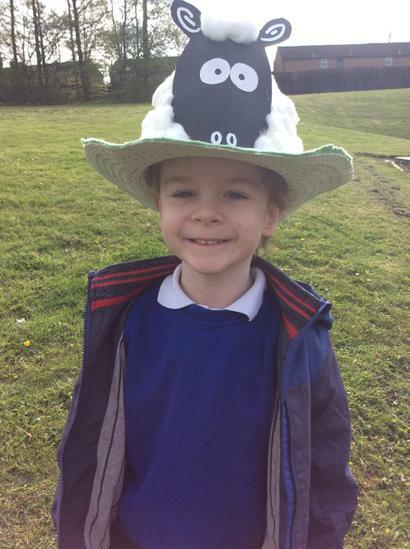 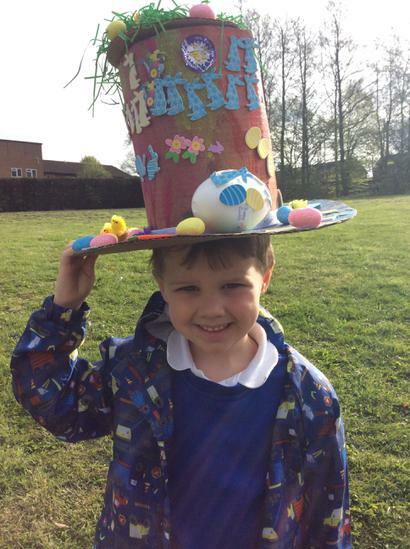 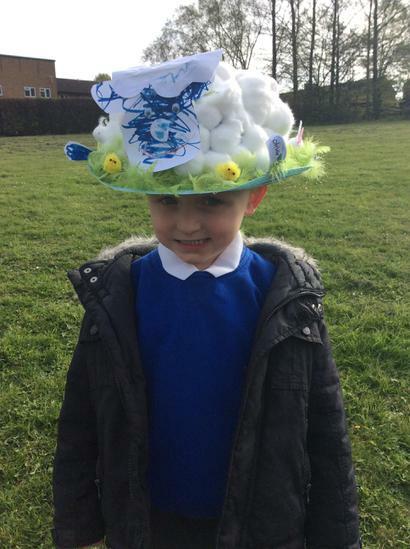 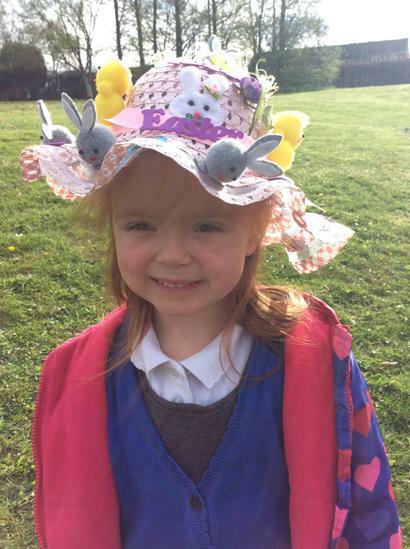 W/B 3/4/17 All the children in Reception, Nursery and Daycare have enjoyed a lovely week learning all about Easter. 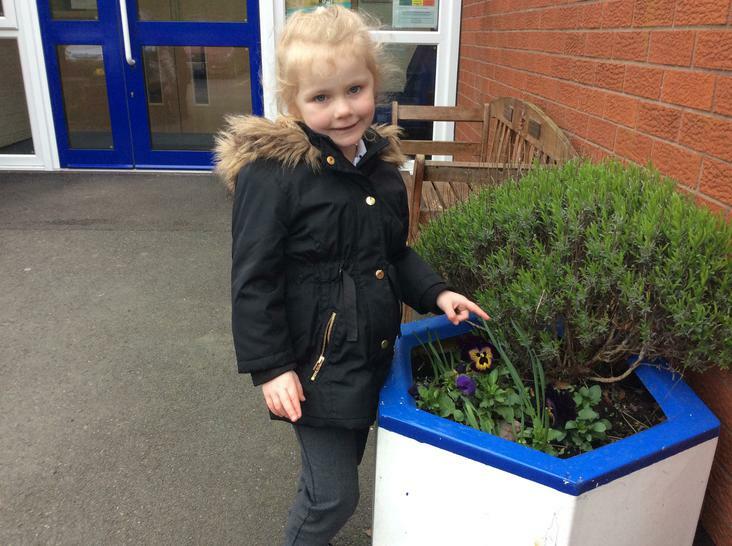 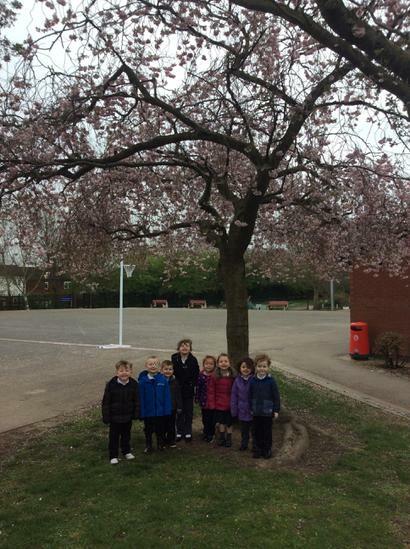 W/B 27/3/17 - Nursery children have enjoyed learning all about spring and growing this week. 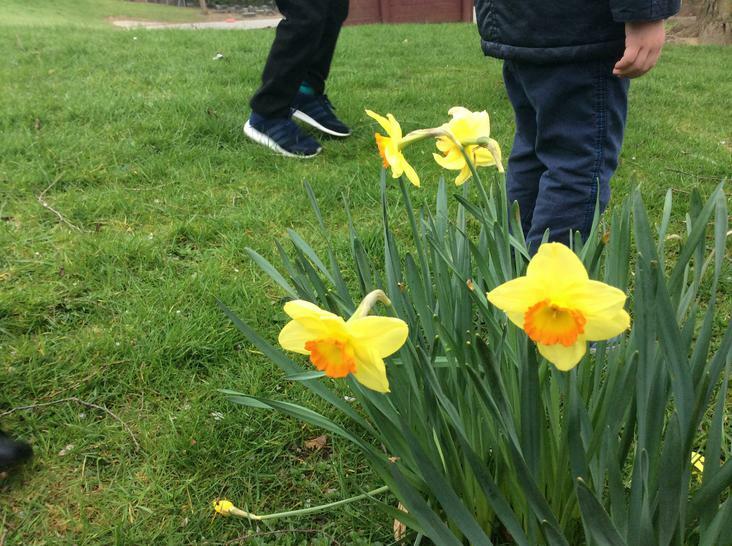 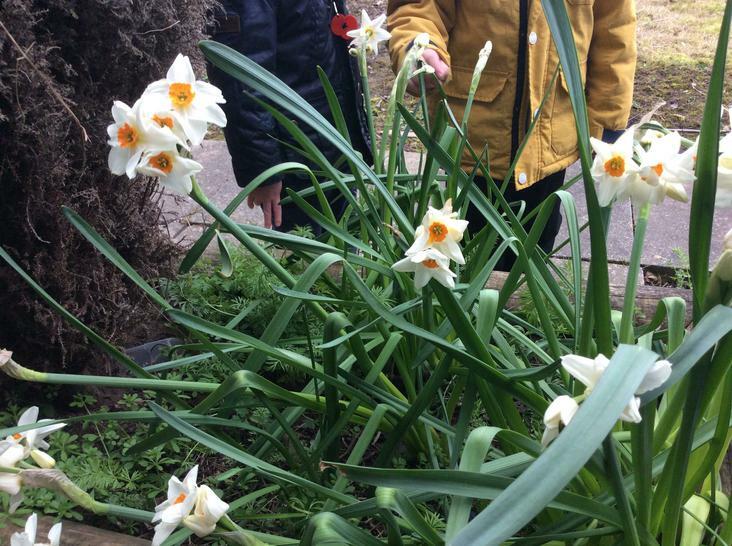 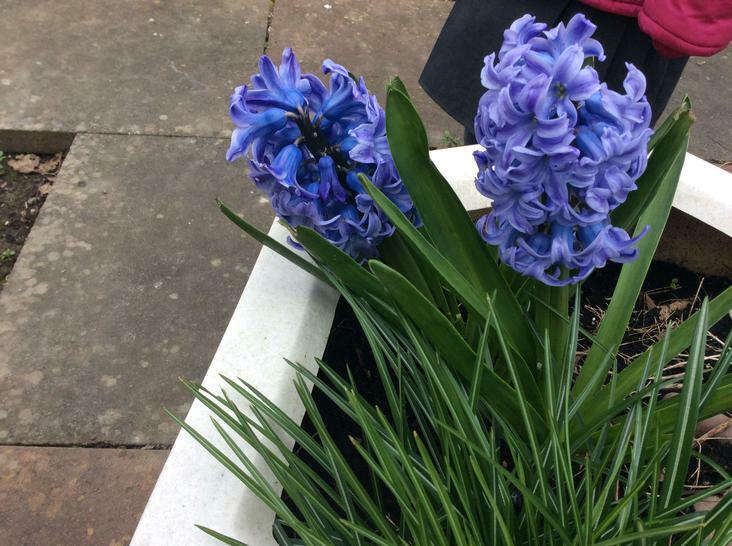 Monday we went on a spring walk around the school, taking pictures and writing about what they have seen. 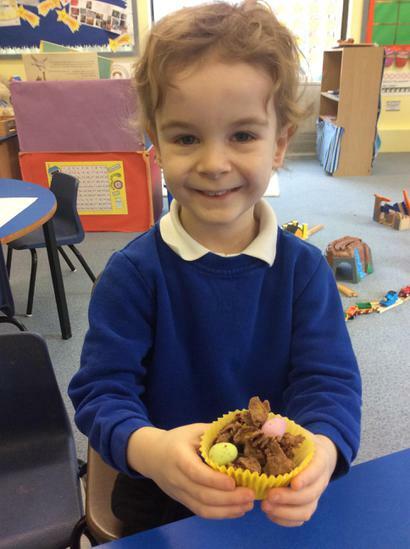 The children also have enjoyed planting grass seeds, making chicks out of playdough and tubes and ordering flowers 1-10. 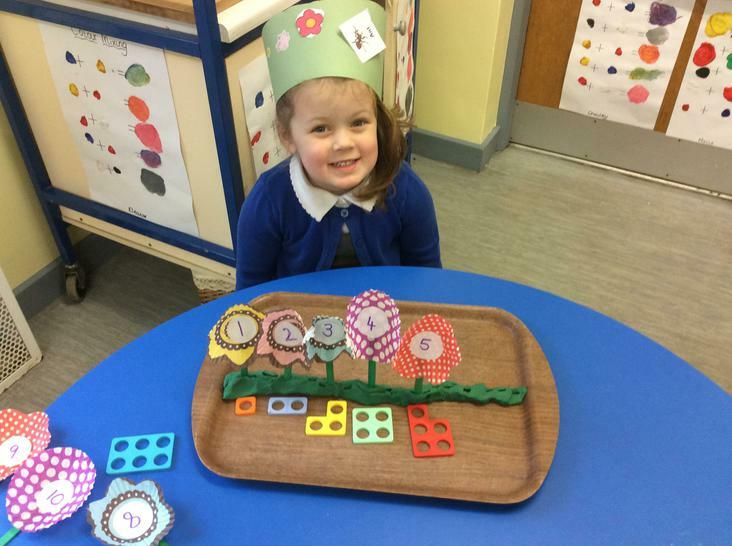 W/B 20/3/17 Nursery and Reception children have enjoyed a lovely week, focusing on Mother's Day. 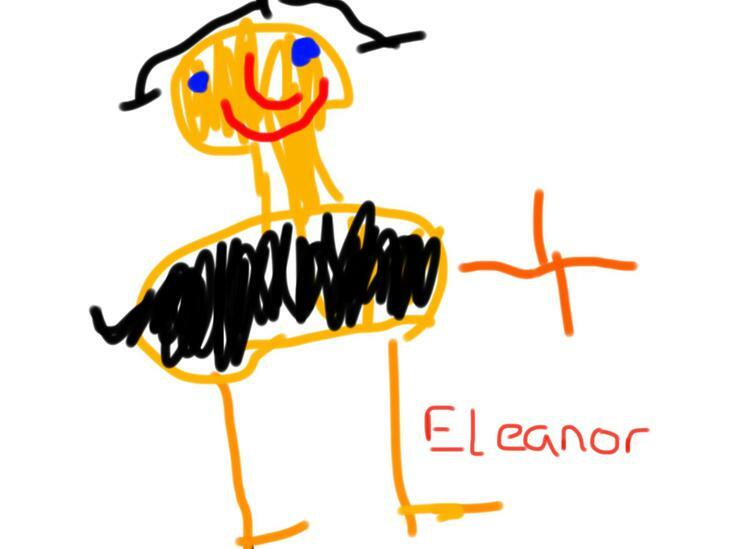 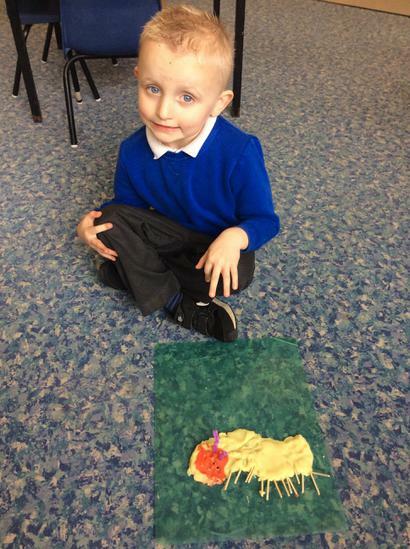 All the children painted pictures and made cards. 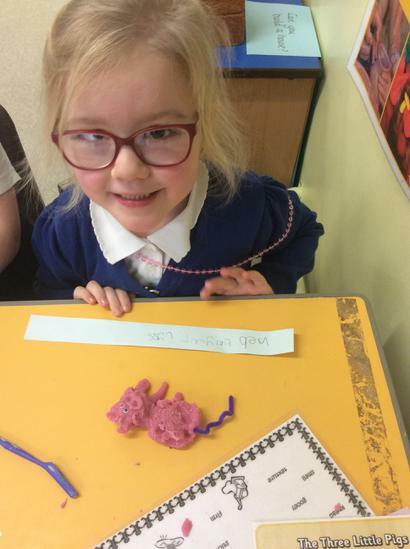 Reception children also have written all about their mom's. 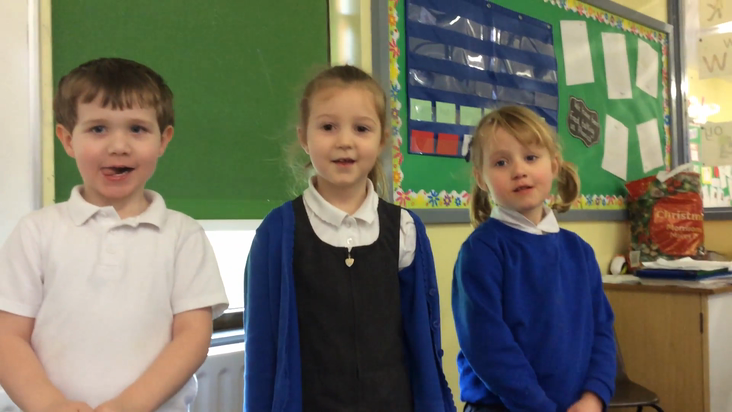 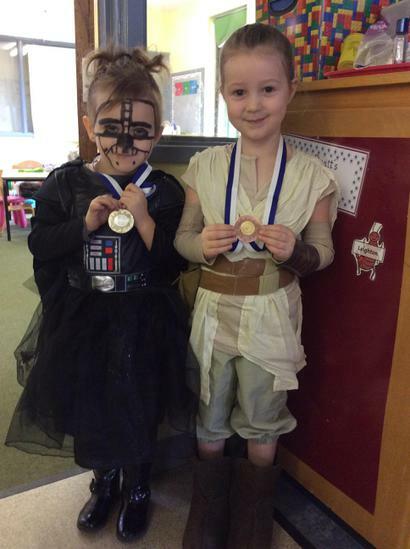 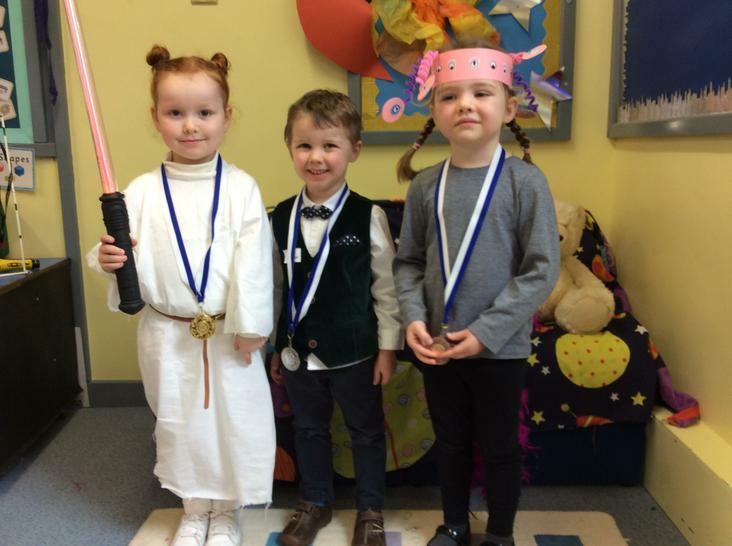 A big well done to the children for a fabulous assembly. 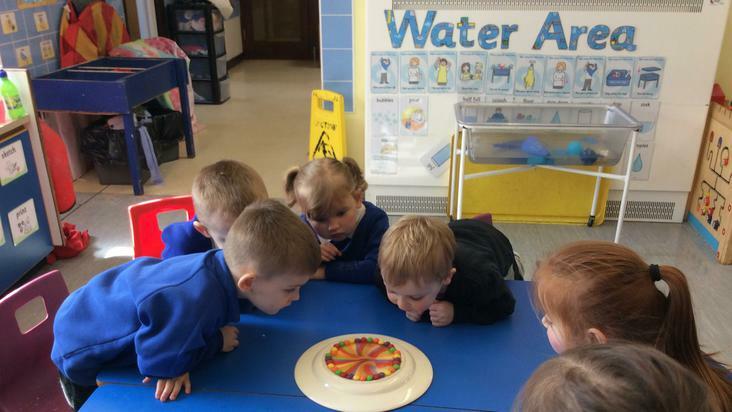 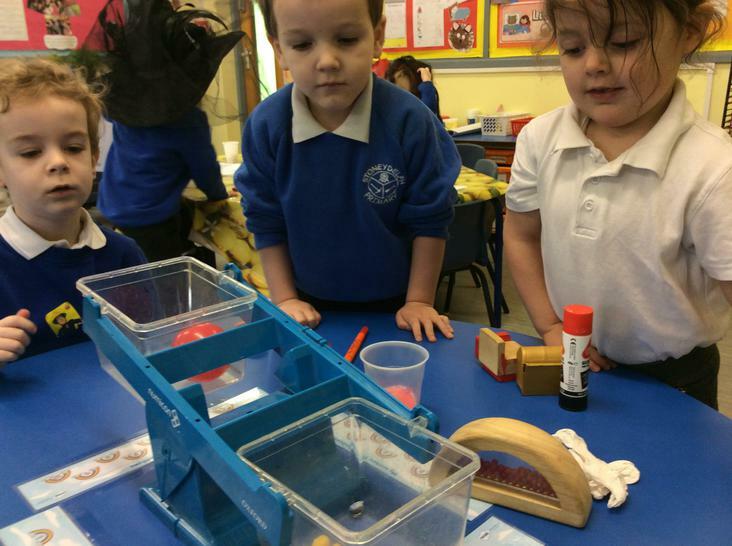 W/B 13/3/17 Daycare, Nursery and Reception have enjoyed science week all around colour. 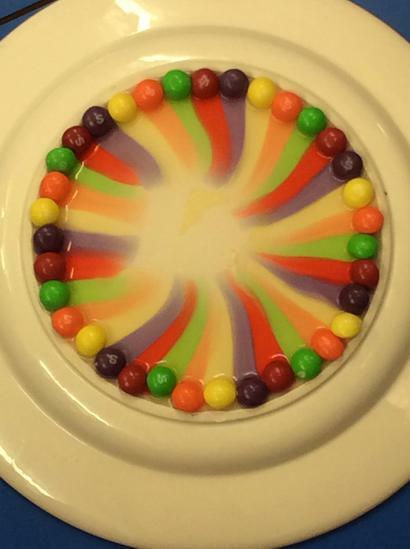 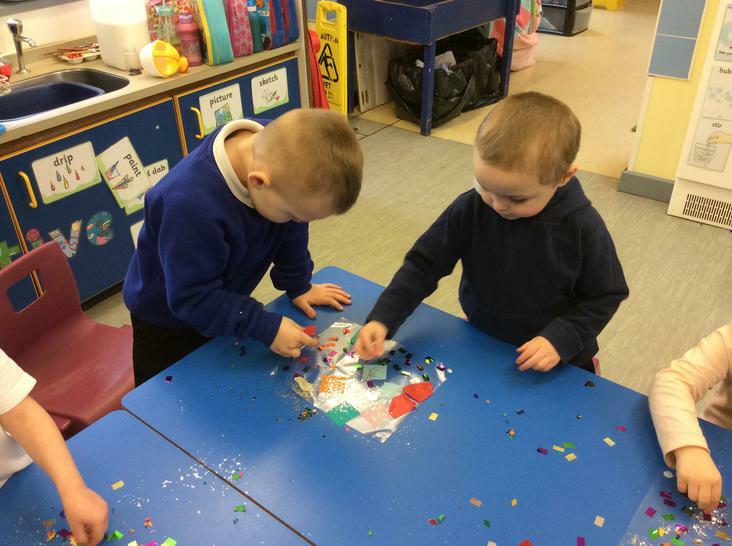 There has been many experiments, sorting of colours, creative work, colour hunts and many more activities. 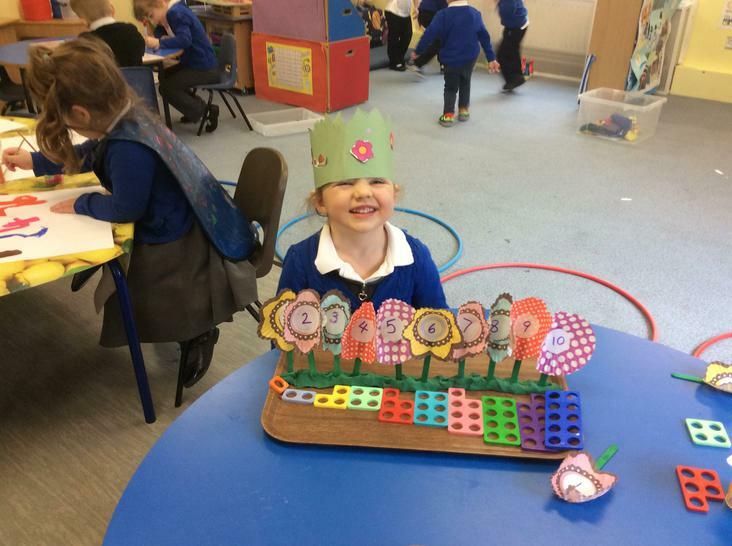 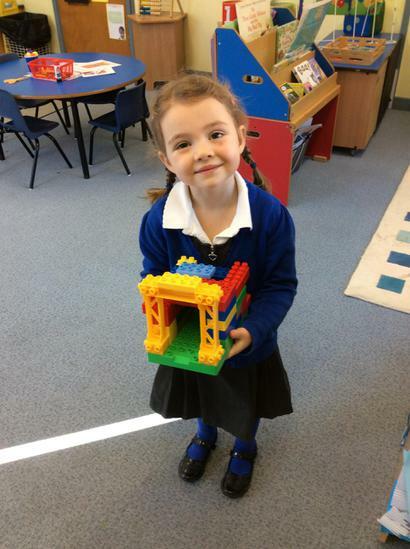 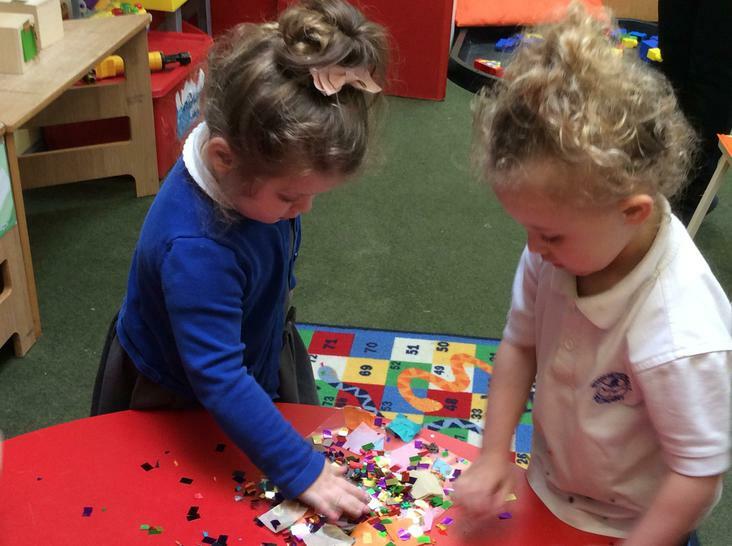 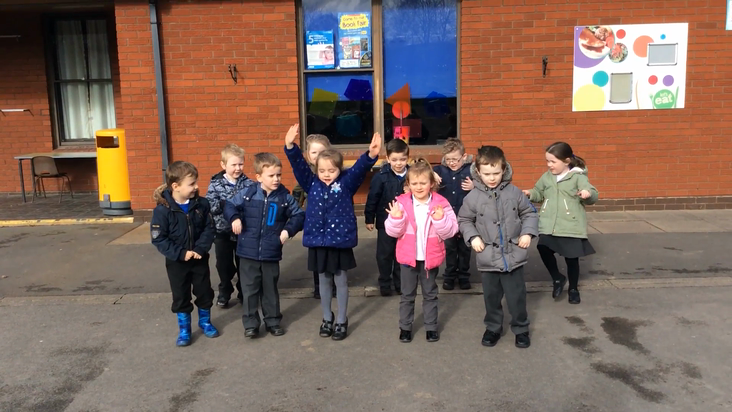 Daycare and Nursery have joined together over the week, which all the children have enjoyed. 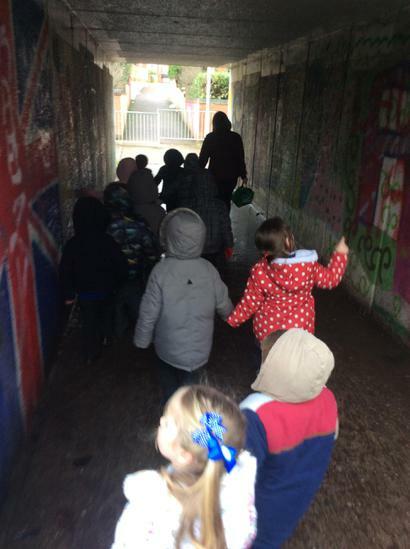 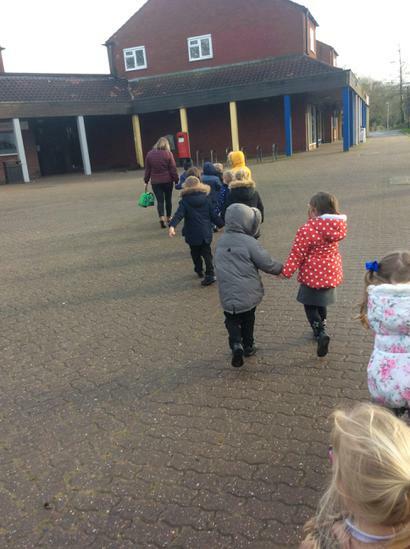 W/B 6/3/17 We're Going on a Bear Hunt - Nursery children have retold the story through paintings, small world and role play area, practised their names and cutting and also had many other focused activities. 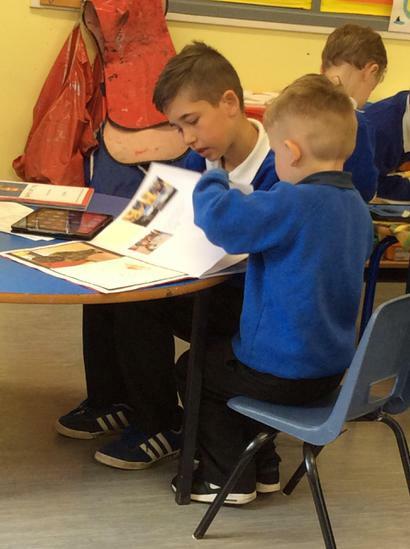 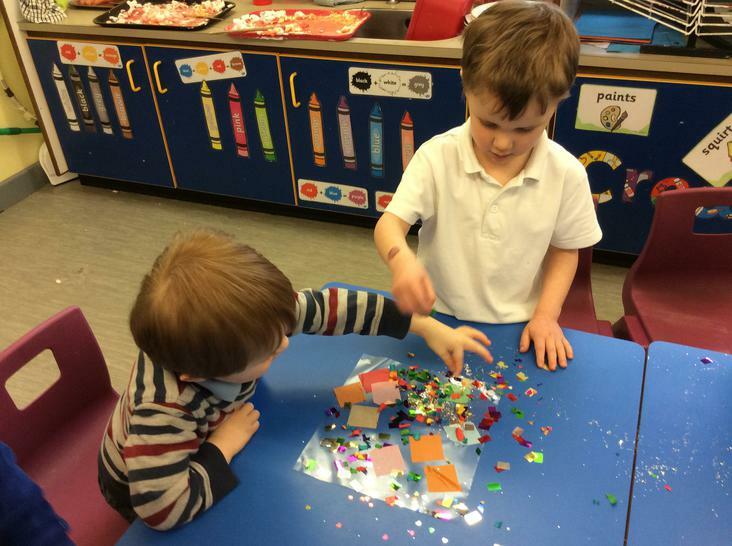 A big thank you to the parents who joined in with their child's learning on Monday and Thursday. 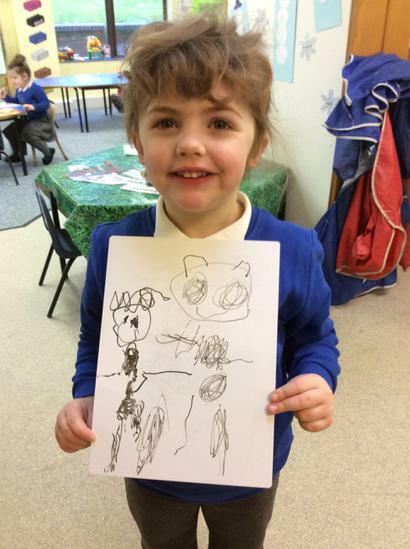 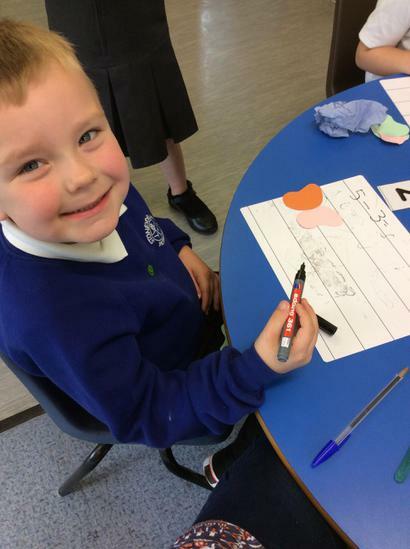 W/B 6/3/17 Reception children enjoyed going for a bear hunt around the school, painting the scenes from the story, wanted bear posters and many other focused activities. 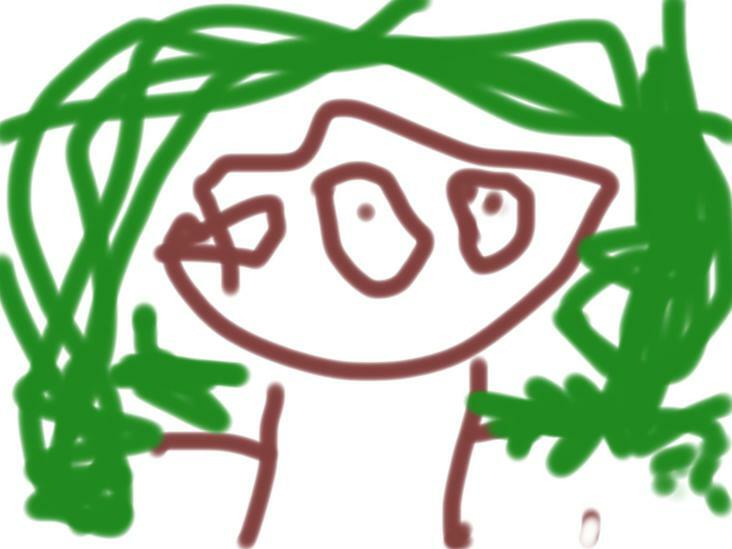 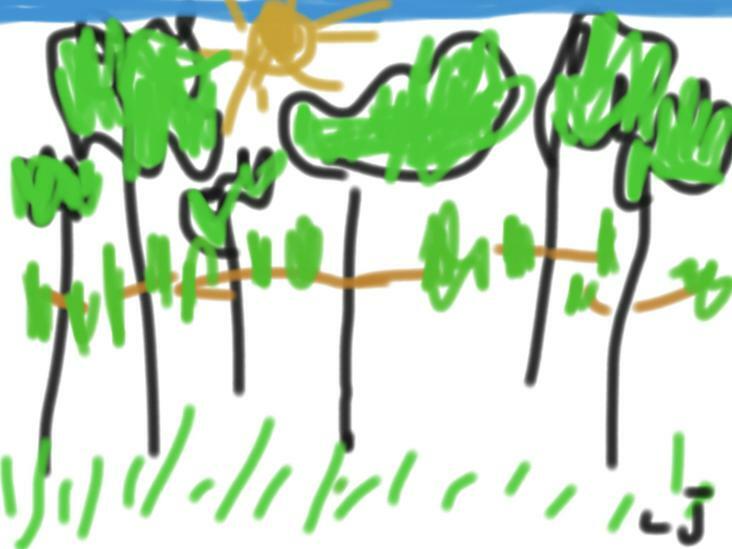 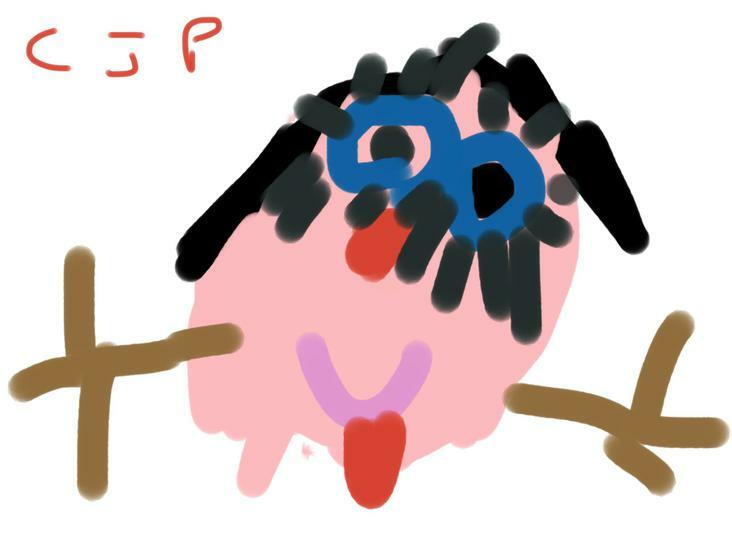 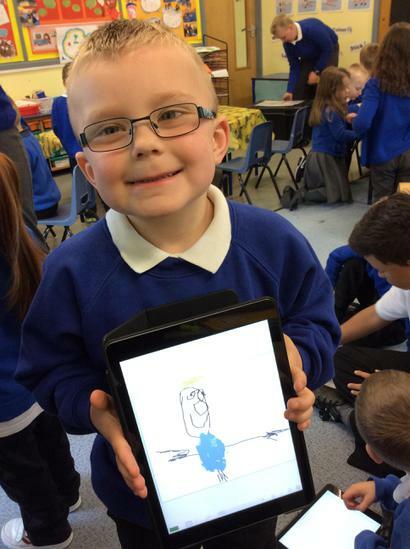 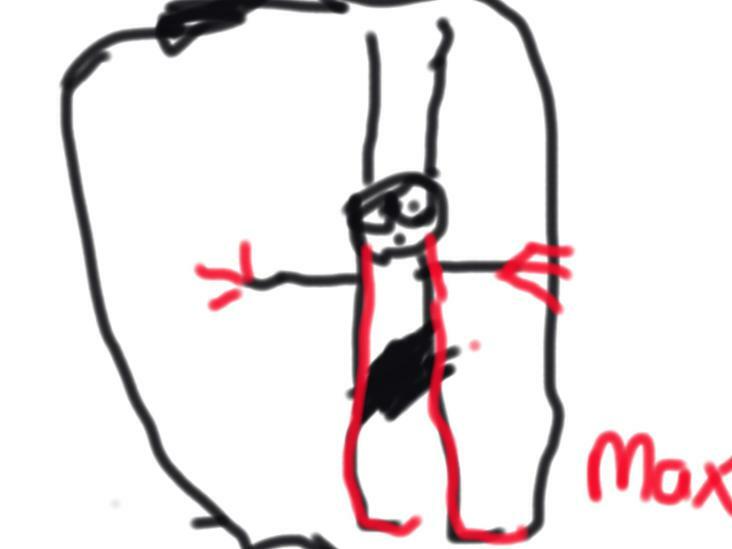 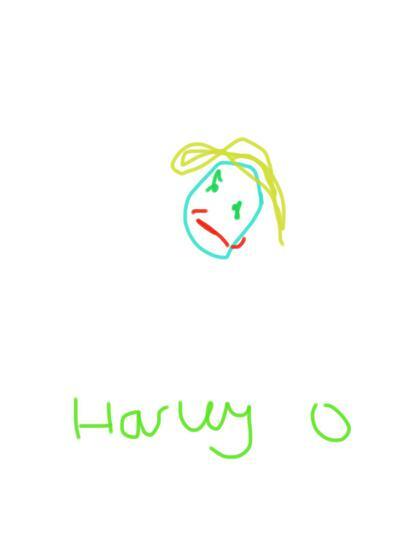 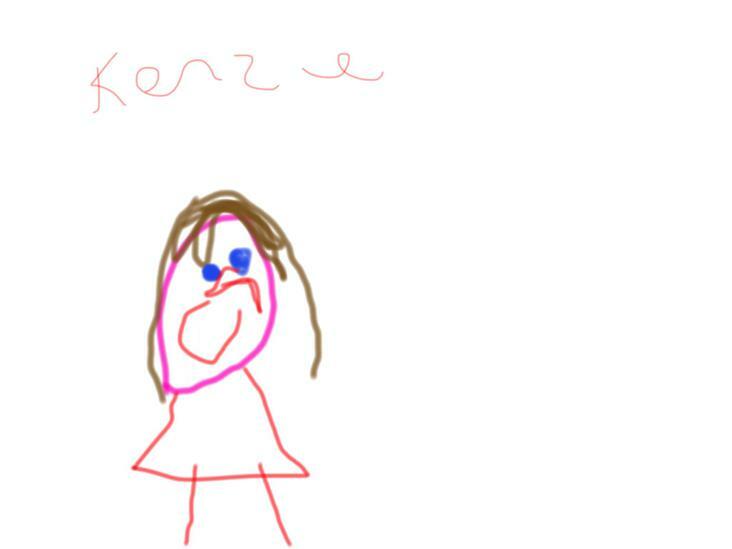 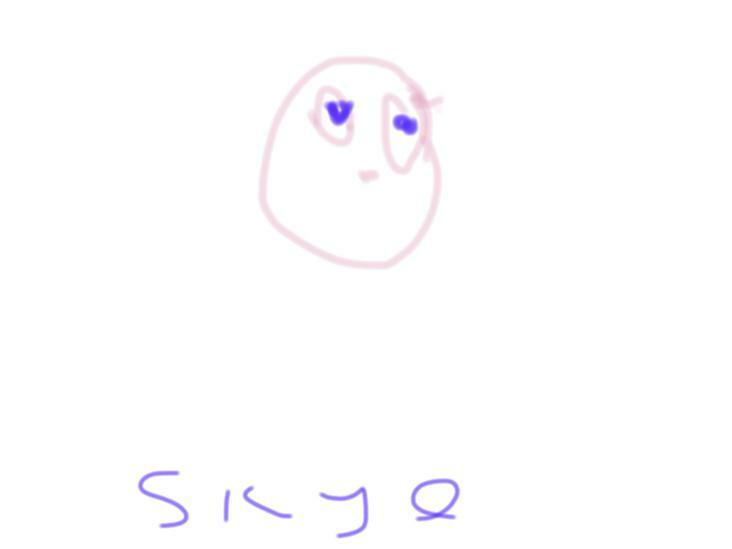 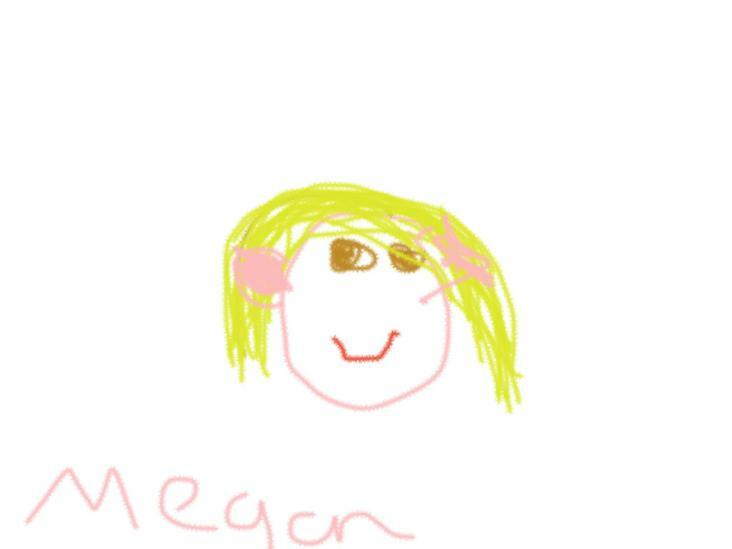 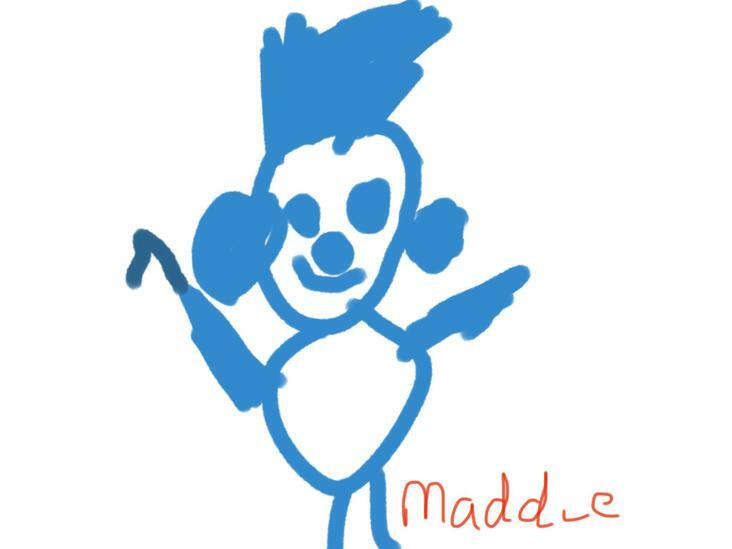 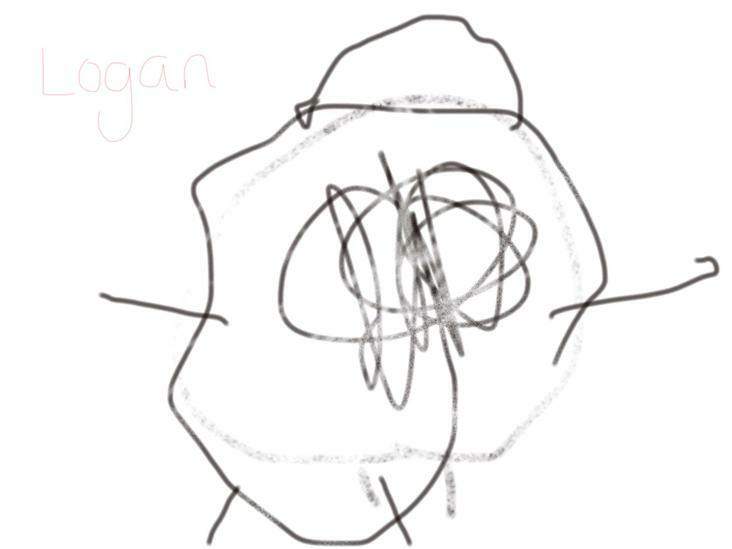 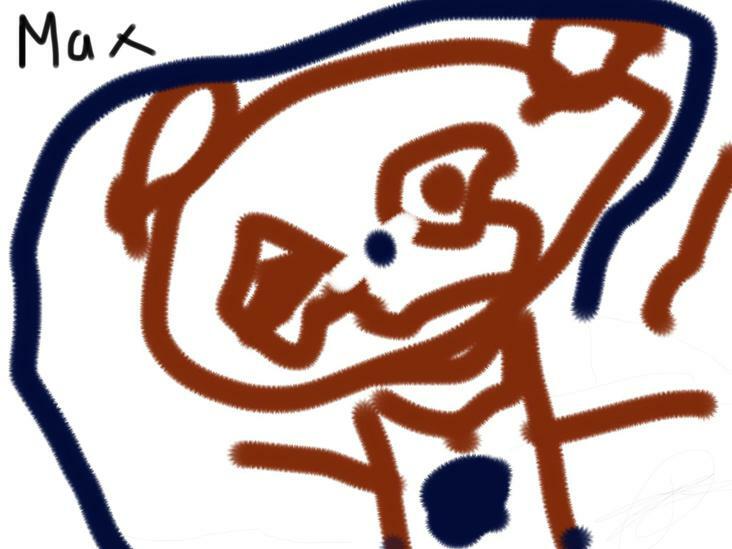 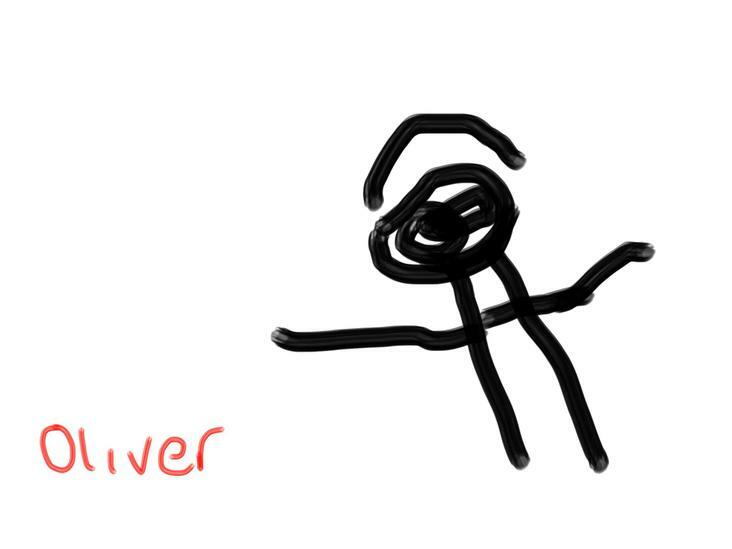 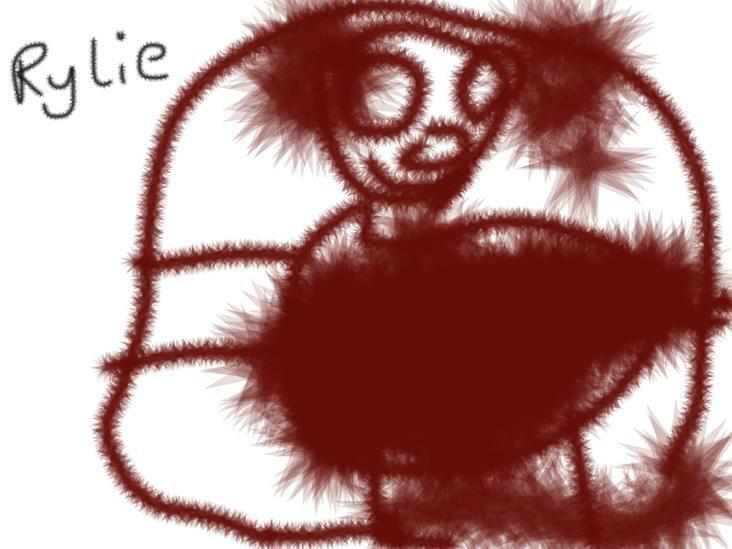 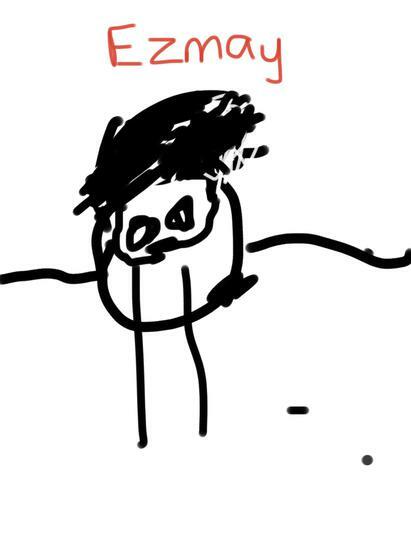 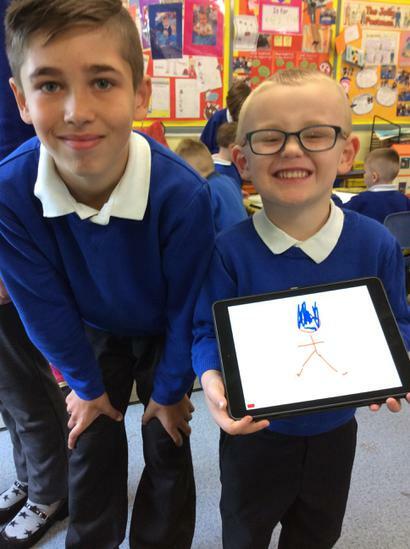 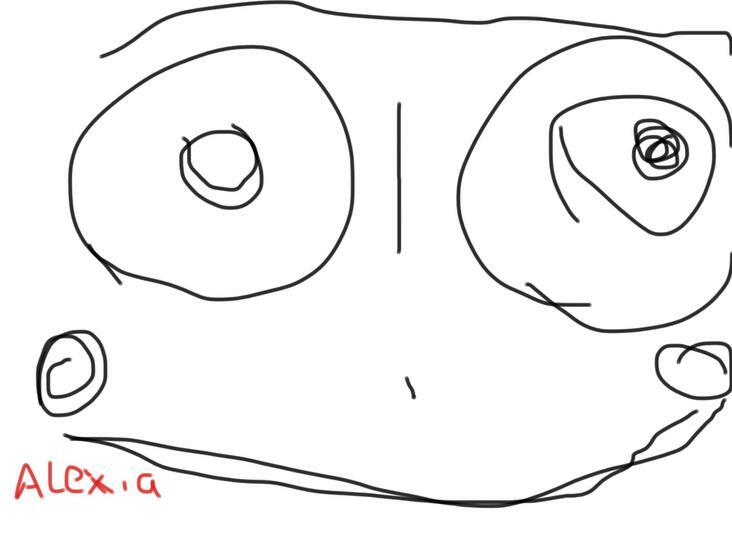 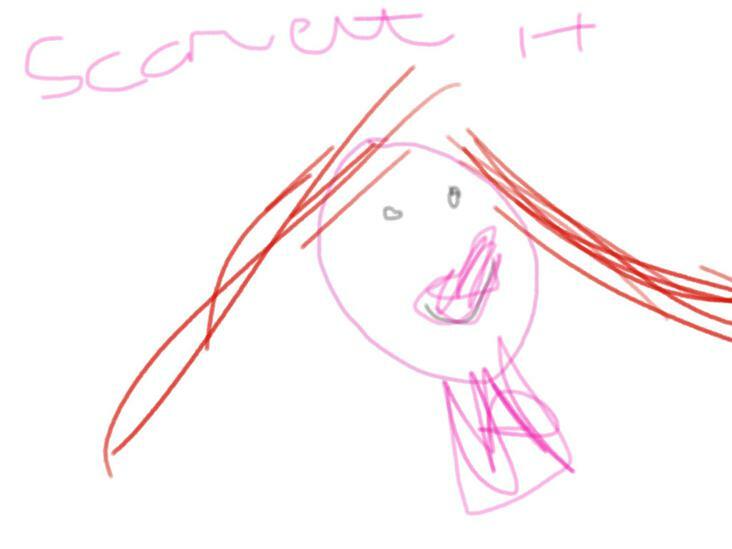 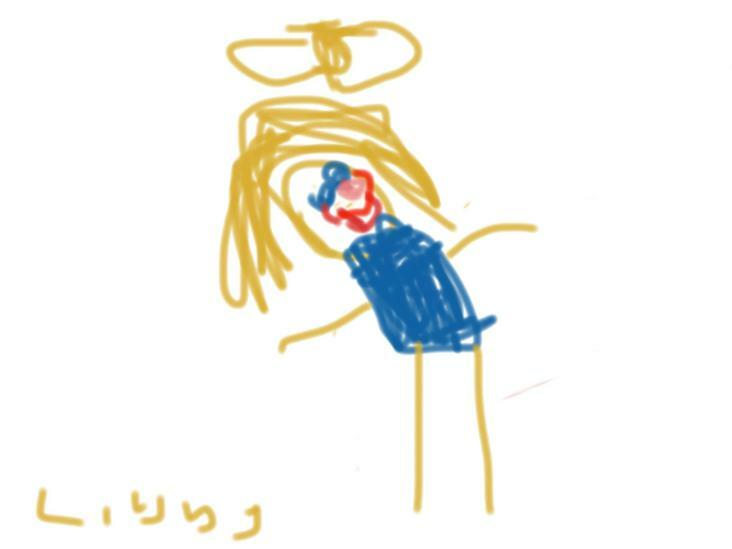 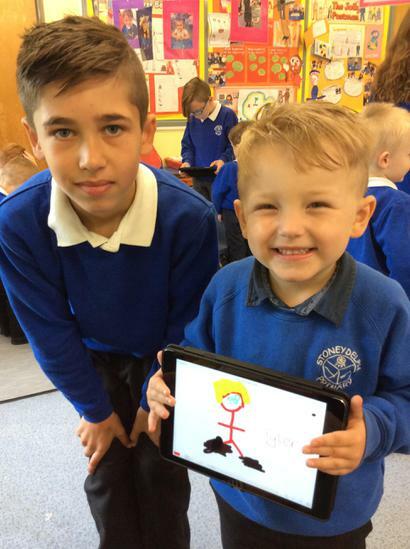 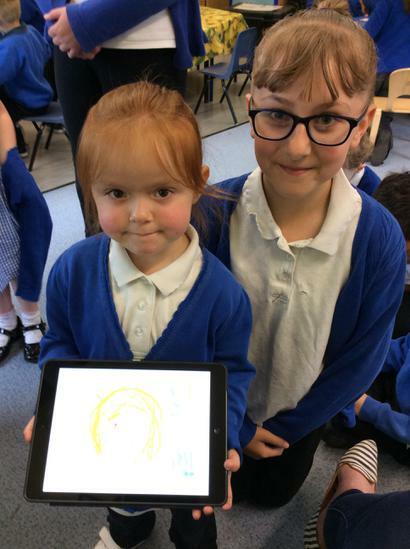 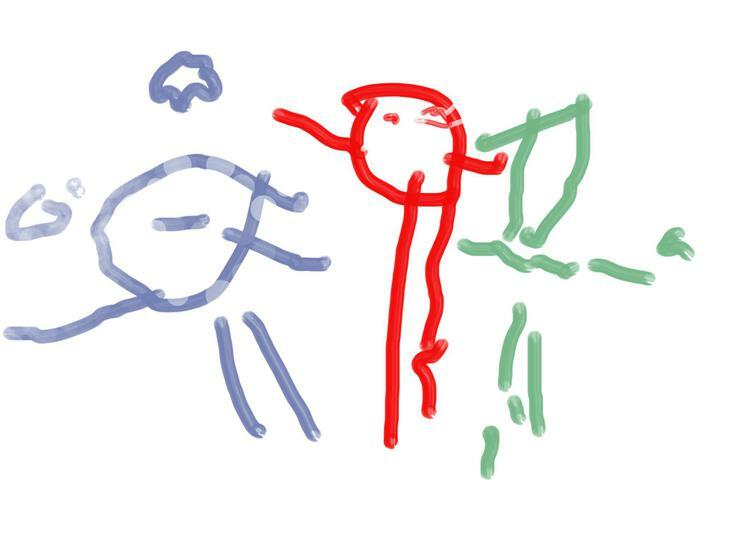 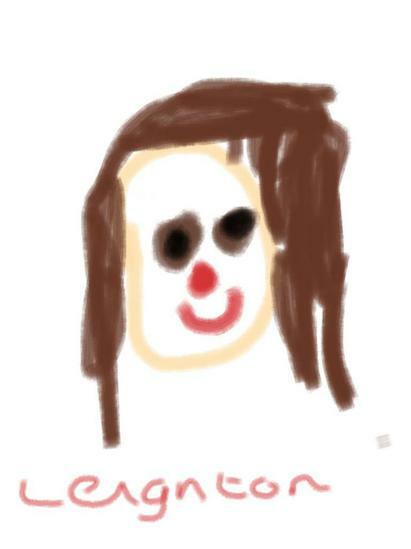 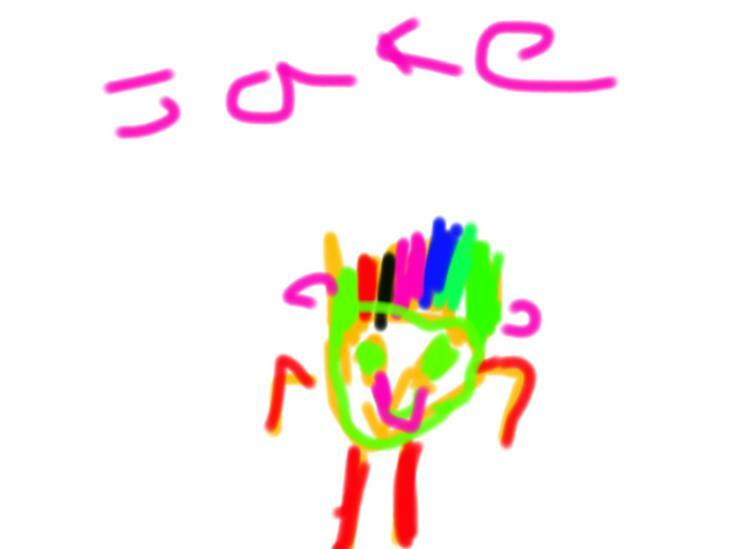 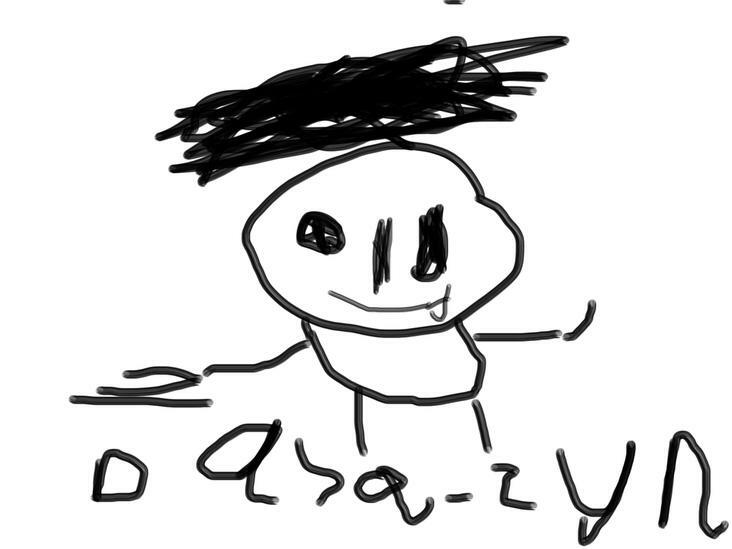 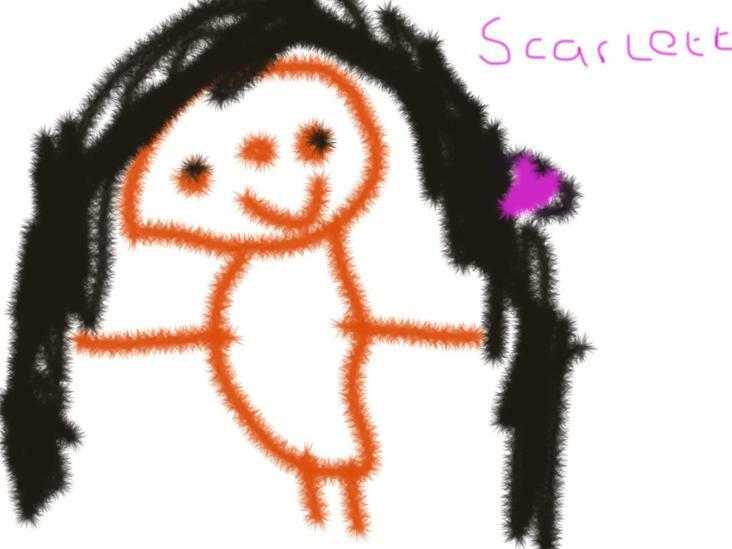 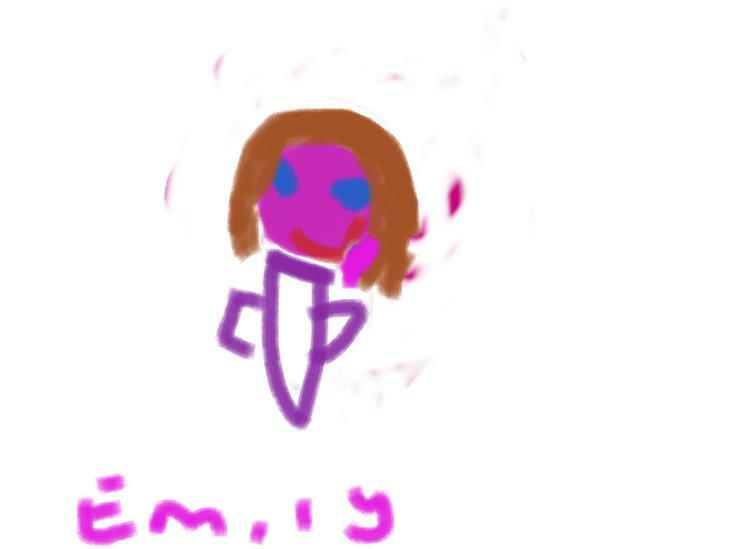 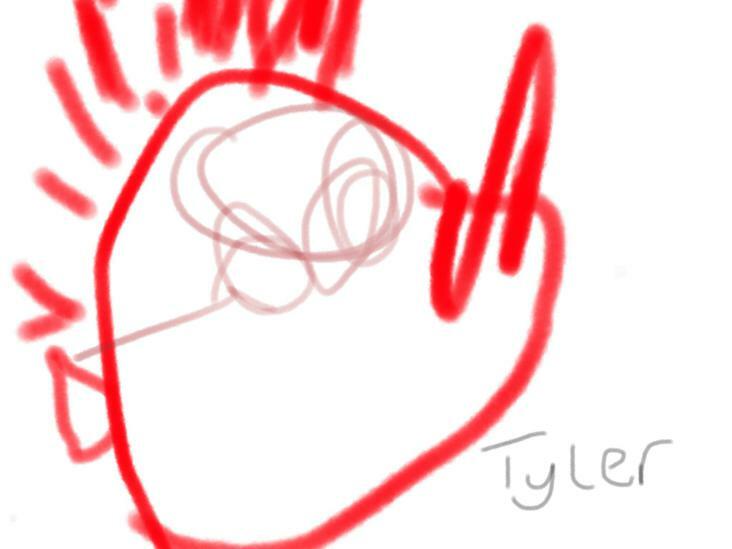 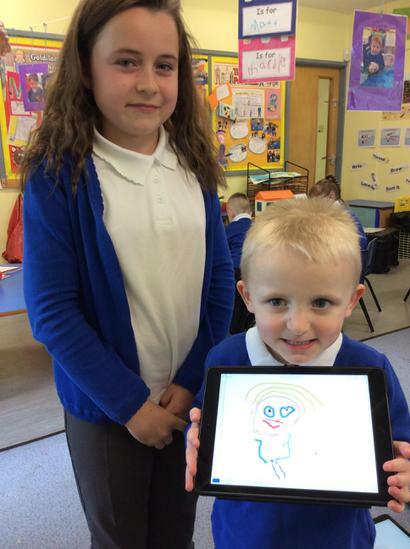 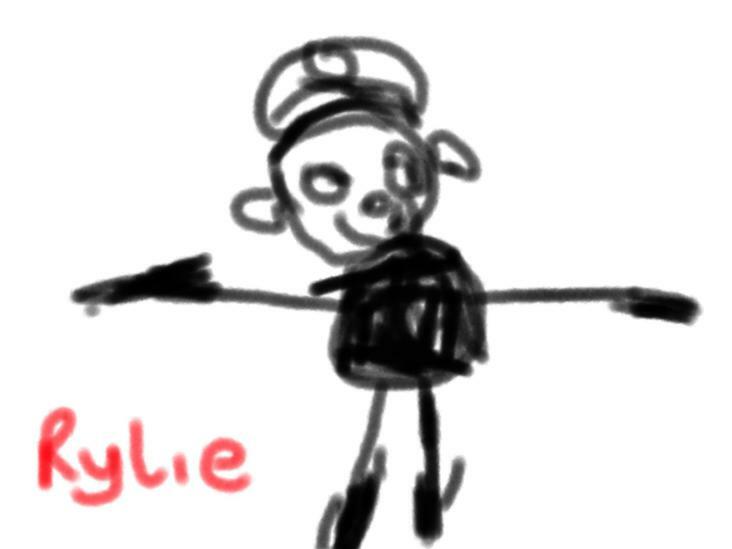 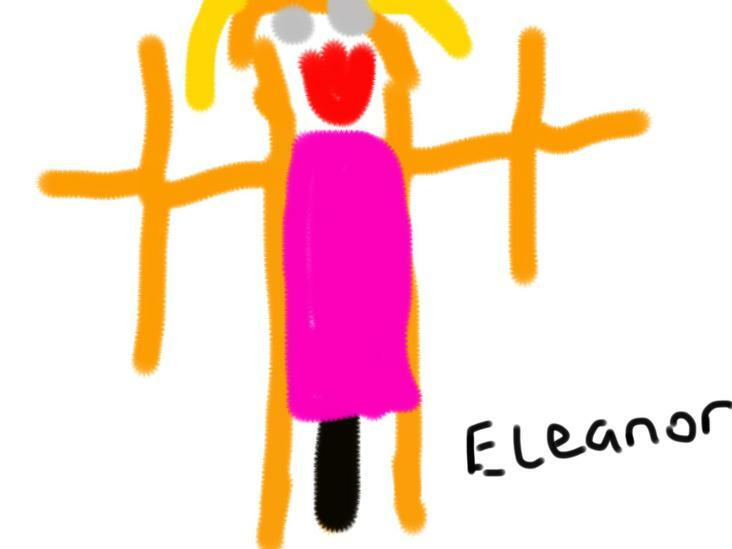 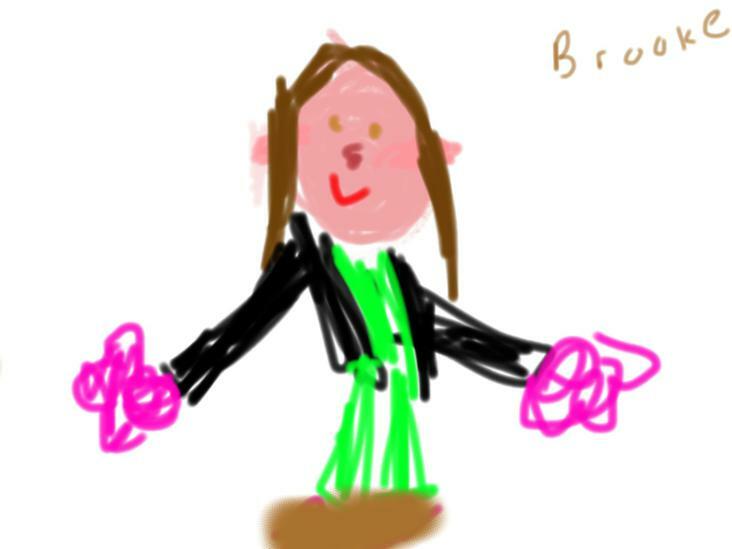 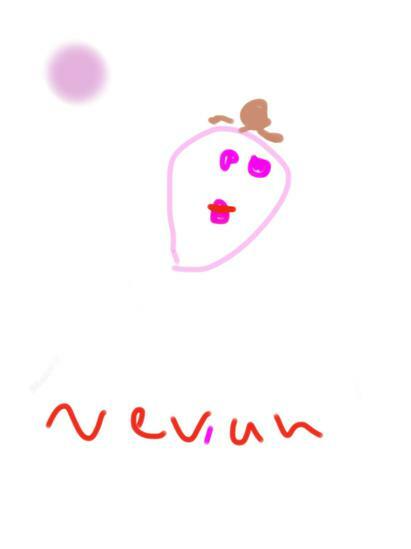 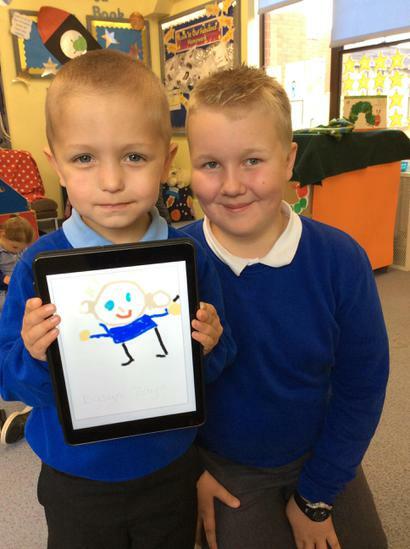 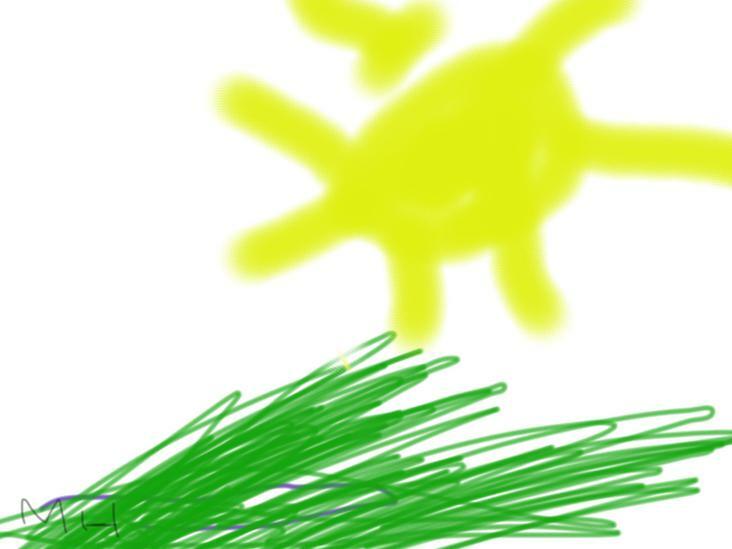 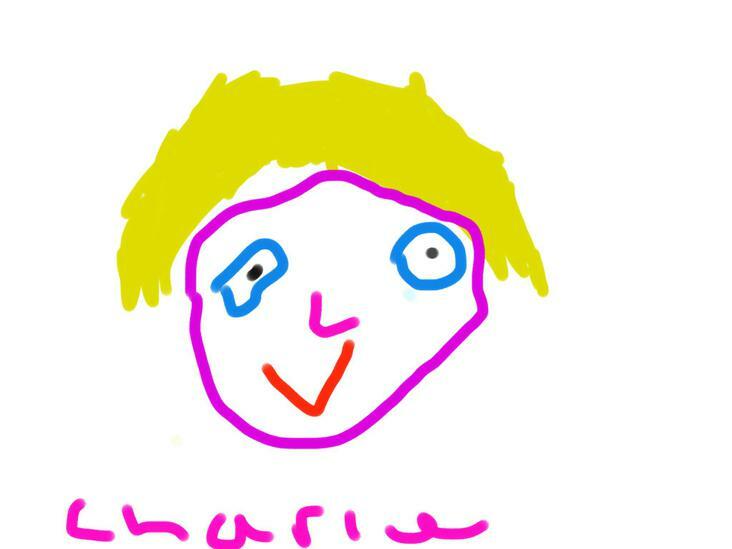 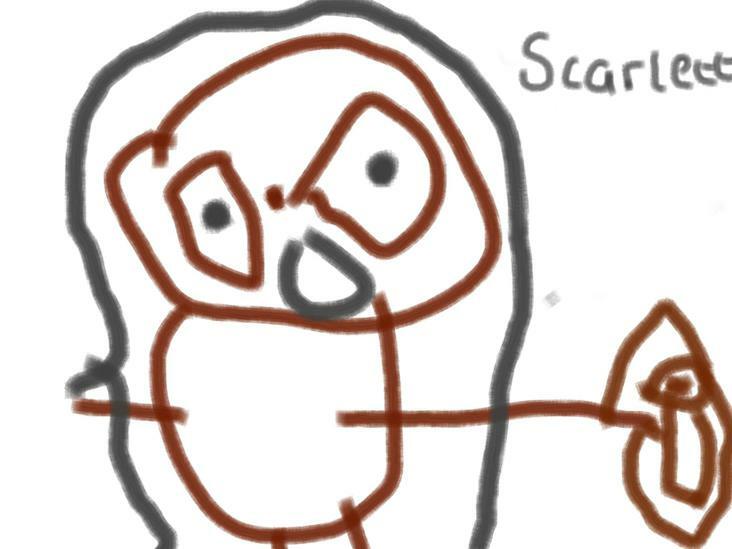 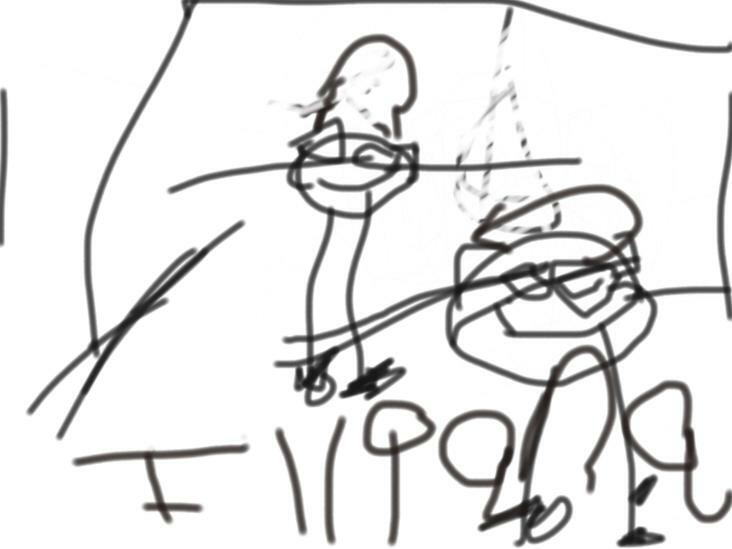 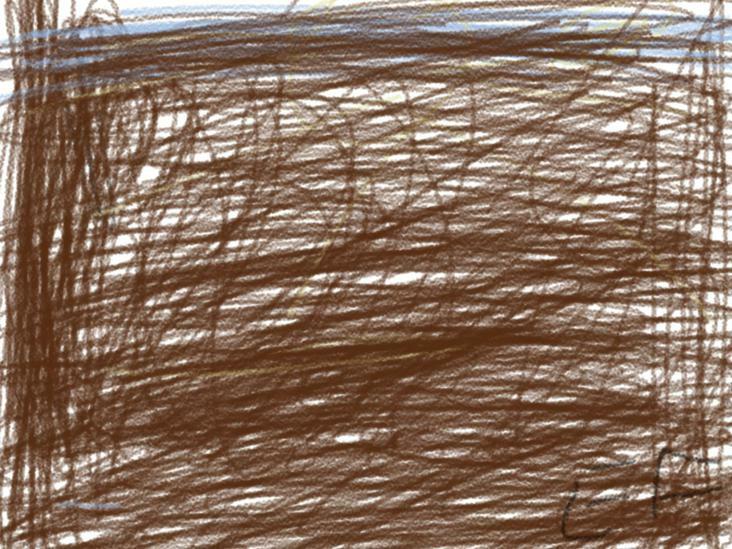 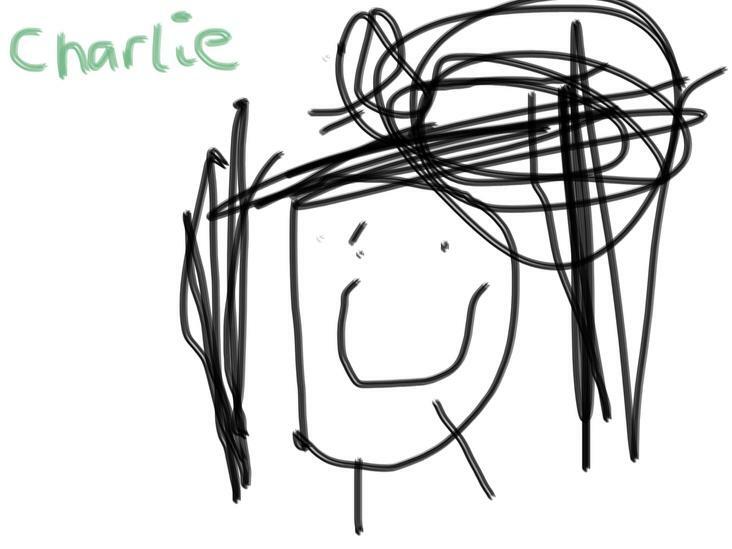 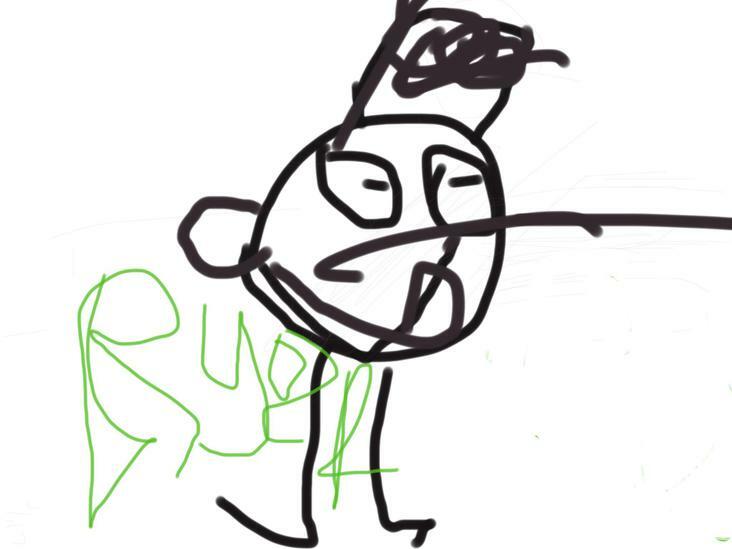 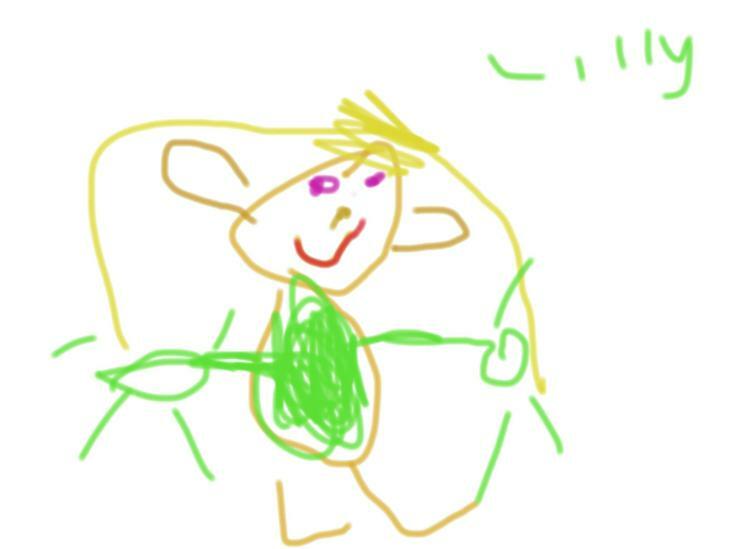 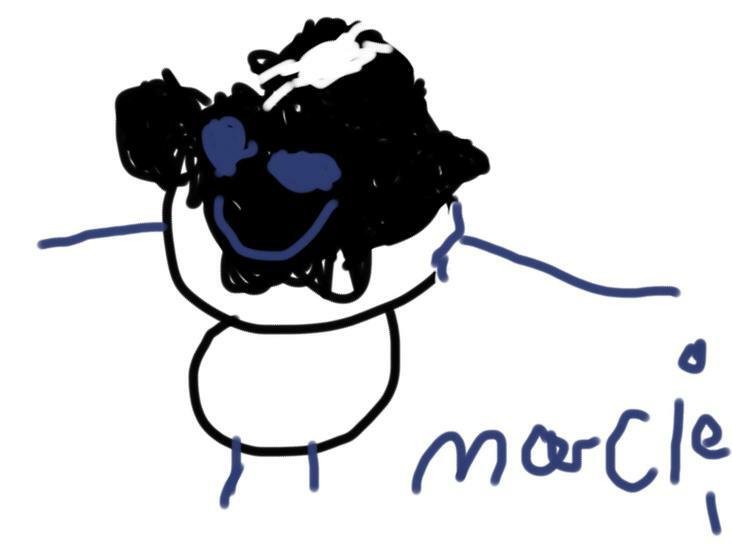 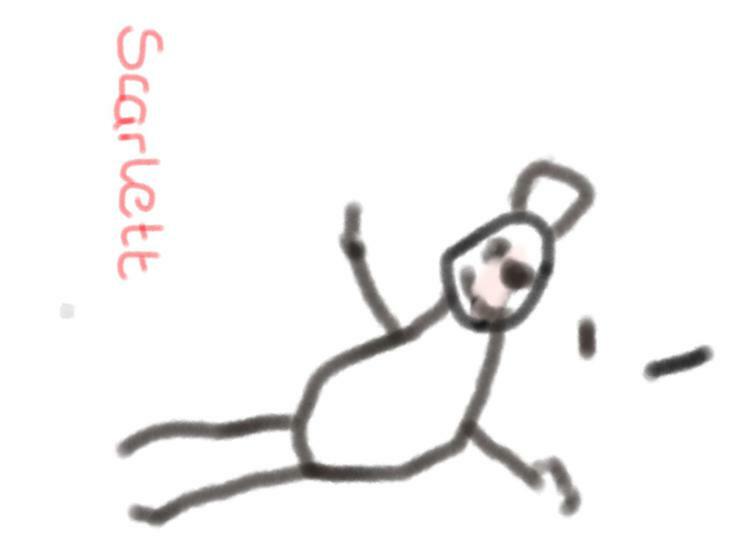 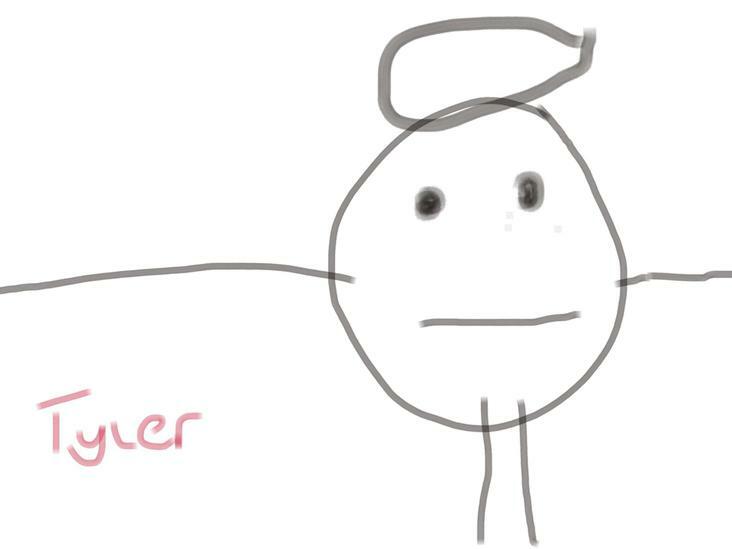 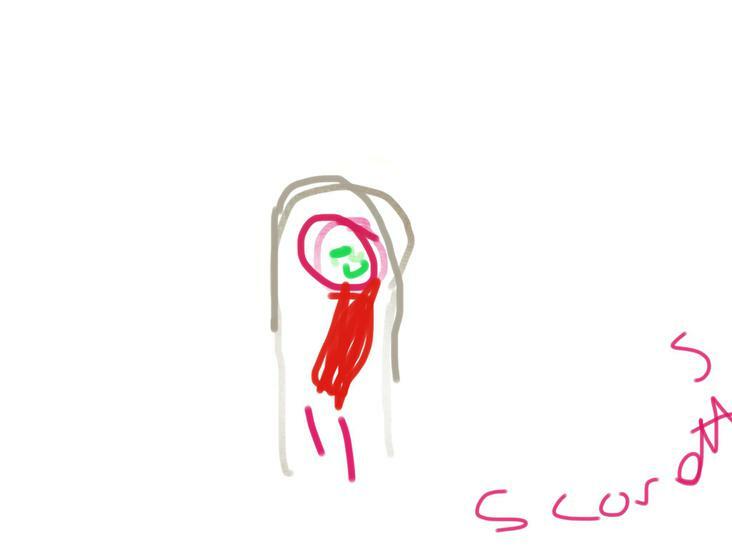 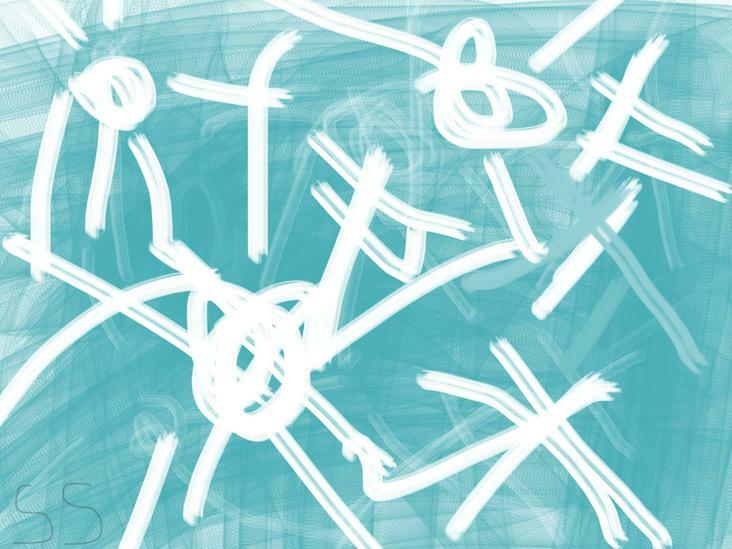 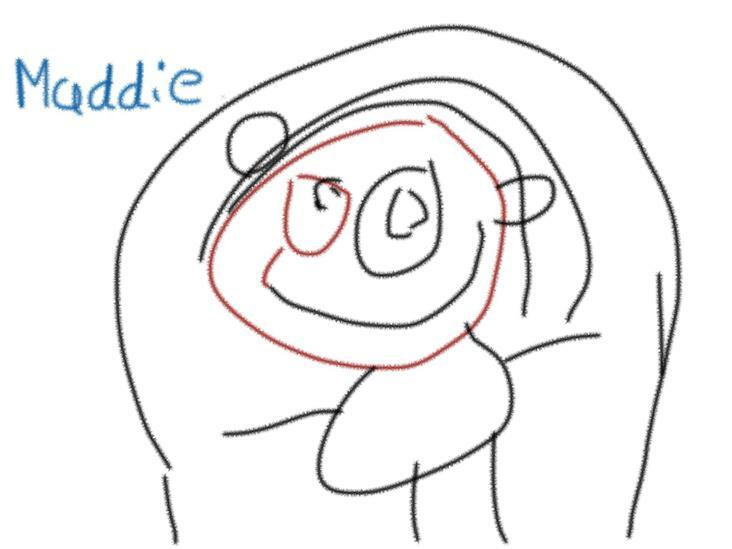 Pictures drawn on iPads of each scene from the story. 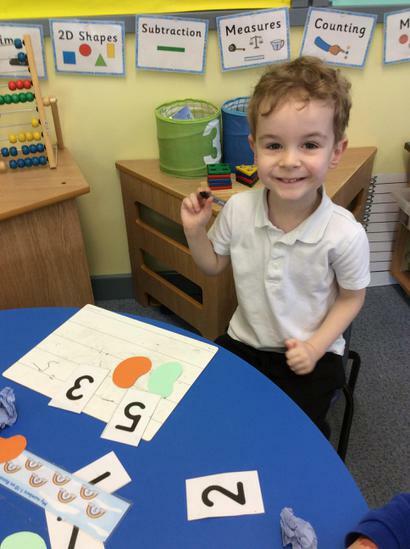 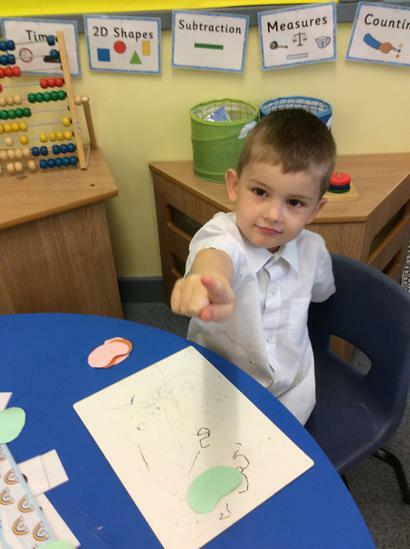 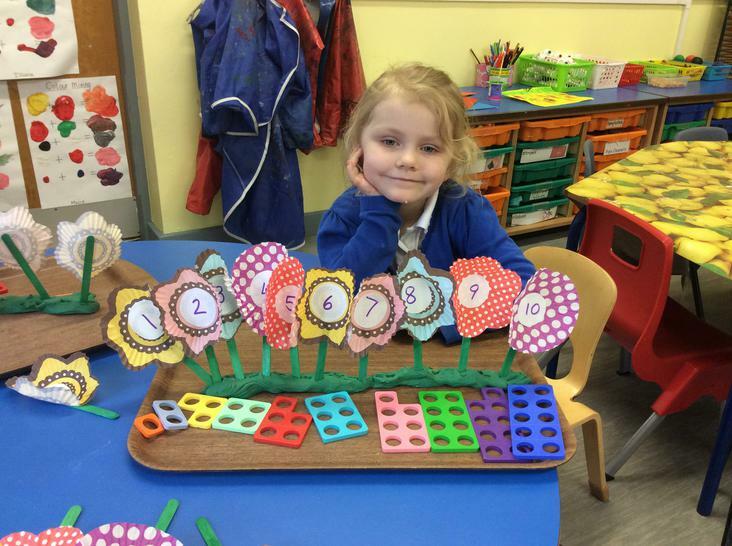 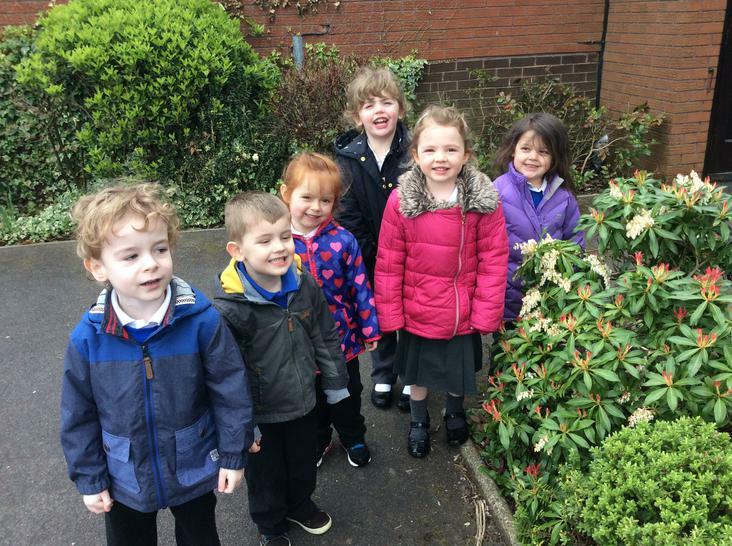 The children in Nursery and Reception have enjoyed a lovely first week back after half term, they've come back all ready to learn. 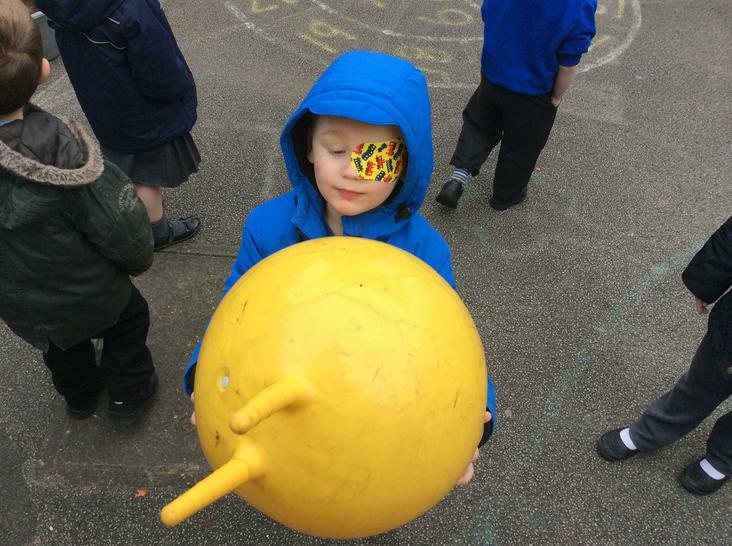 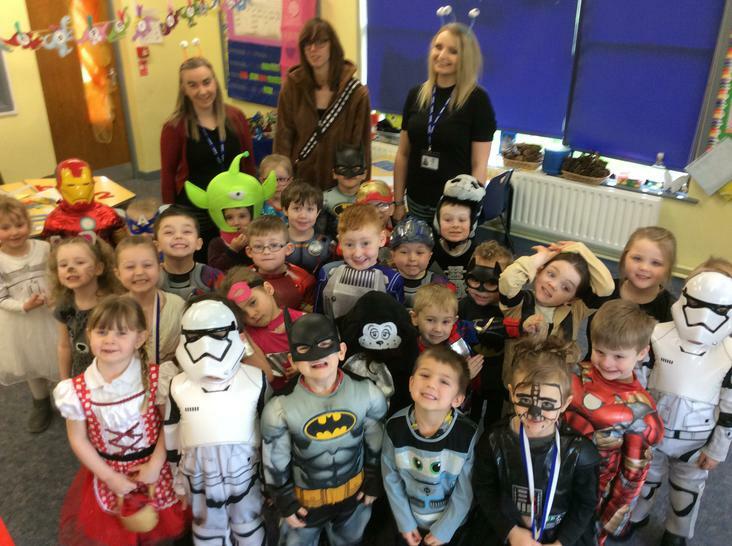 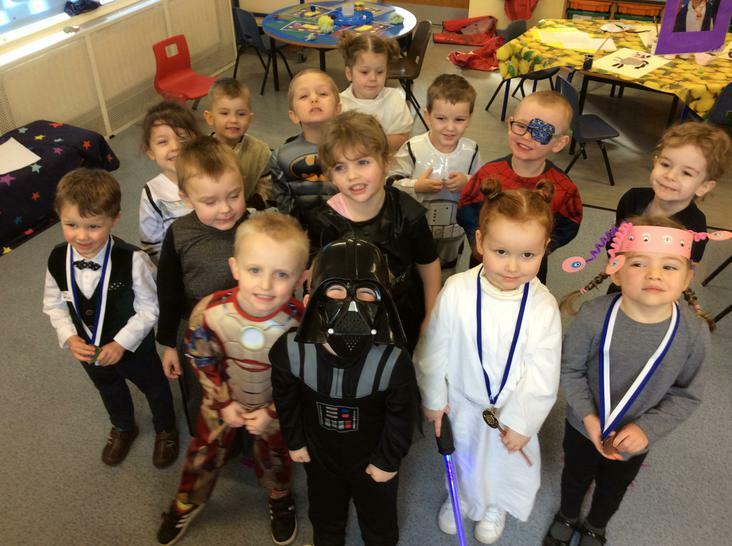 On Thursday 2nd March, the whole school enjoyed World Book Day with the children in Nursery and Reception reading the story - Aliens love Underpants. 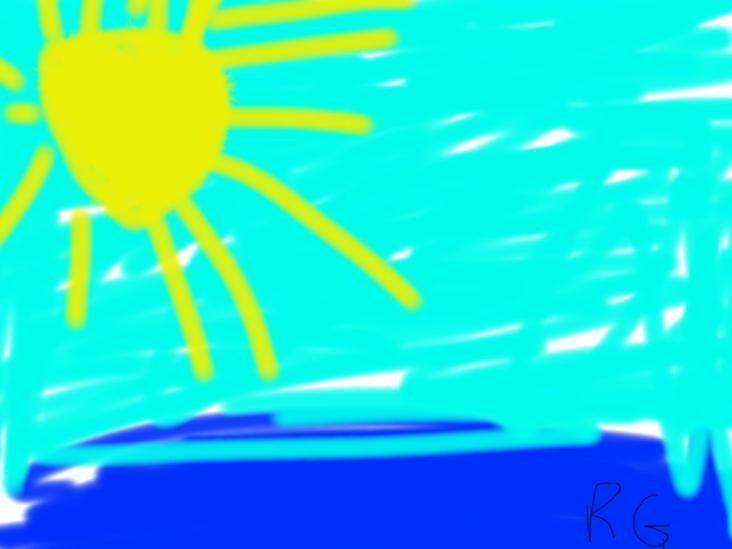 W/B 27/2/17. 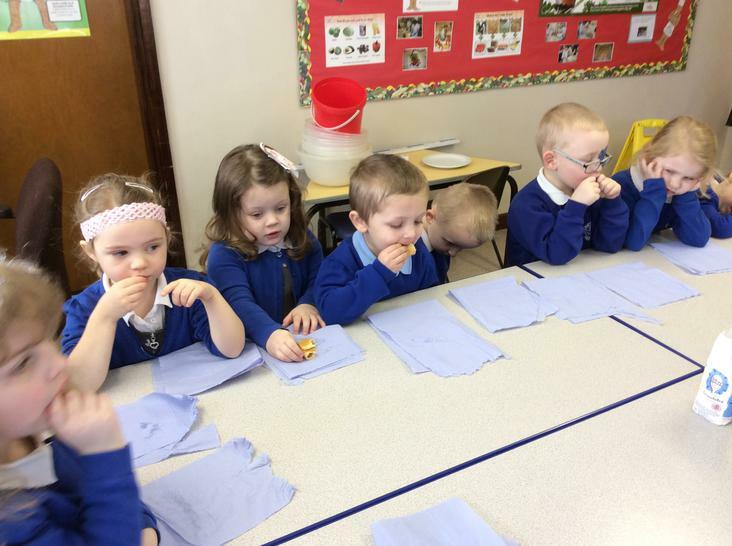 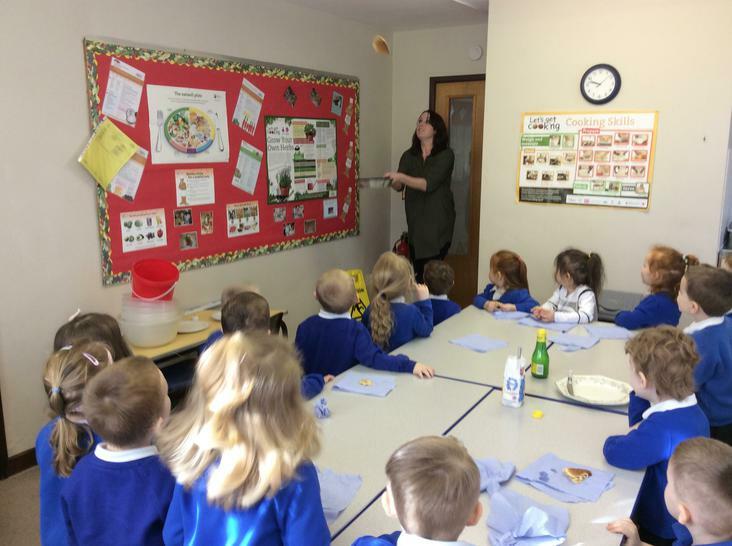 Pancake Day - the children got to taste half a pancake and choose what topping they would like. 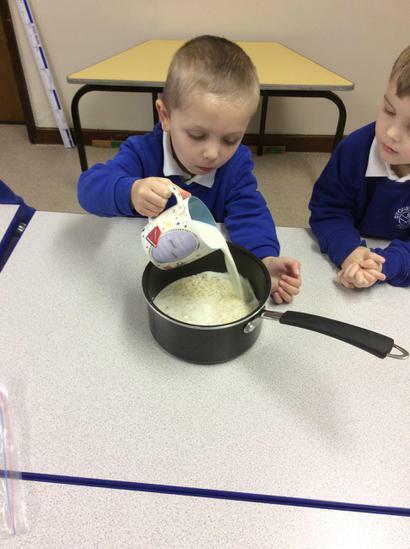 We discussed what ingredients was needed and how to make them. 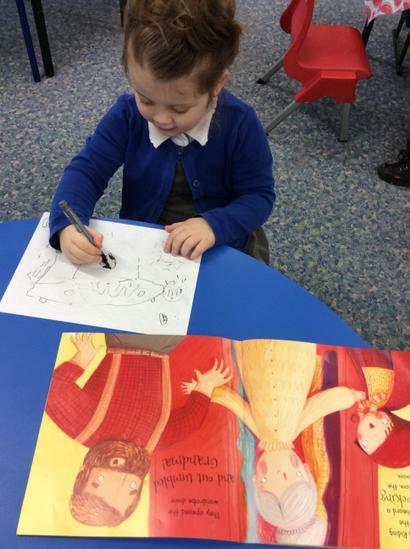 On Thursday the children painted and did a drawing of themselves in their costumes and enjoyed many planned activities around the story. 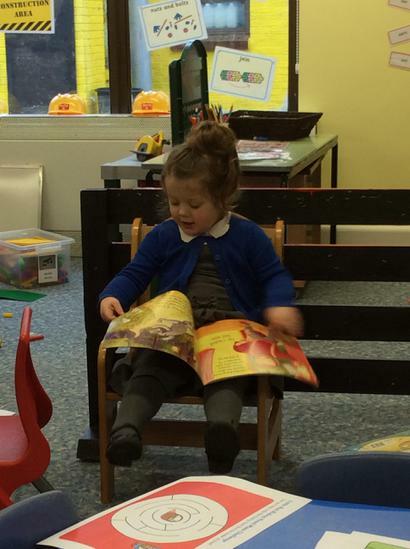 We're Going on a Bear Hunt was read on Friday and the children loved retelling the story in the role play area. 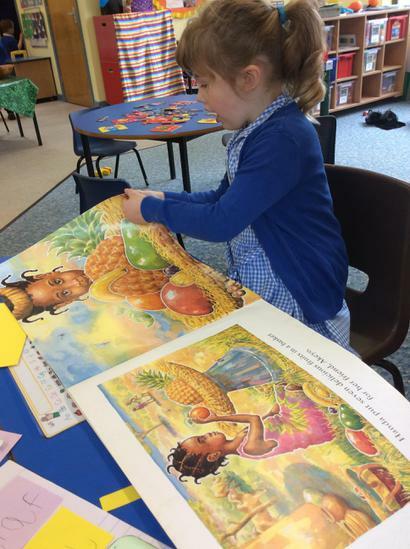 Next week the children will continue their learning from this book. 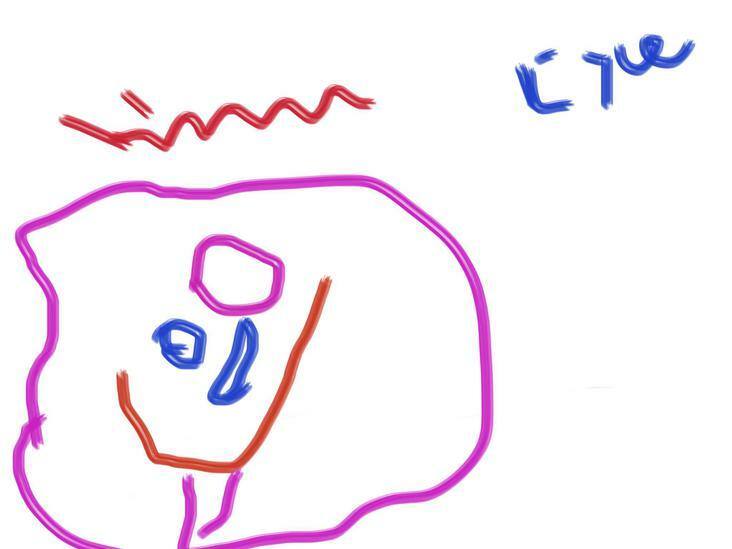 W/B 27/2/17. 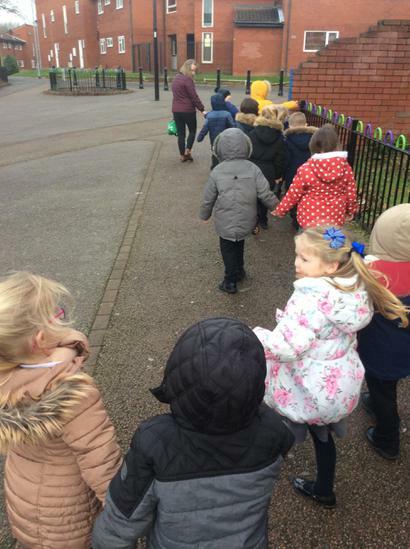 We're Going on a Bear hunt was their focus this week and next. 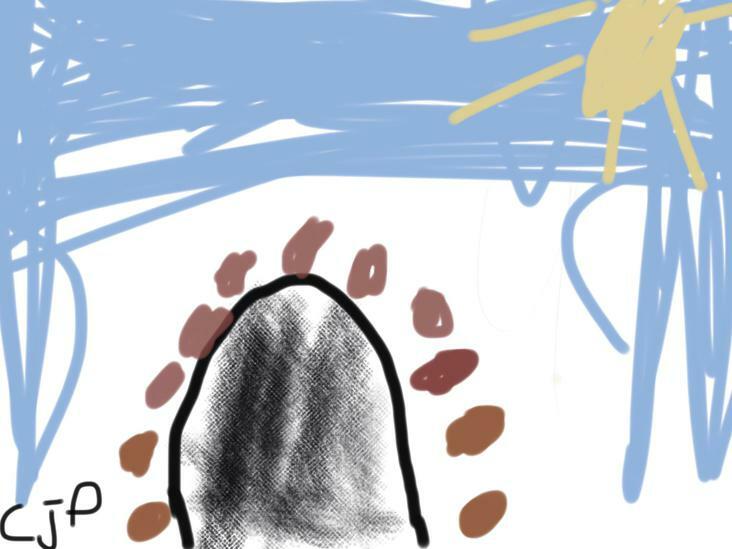 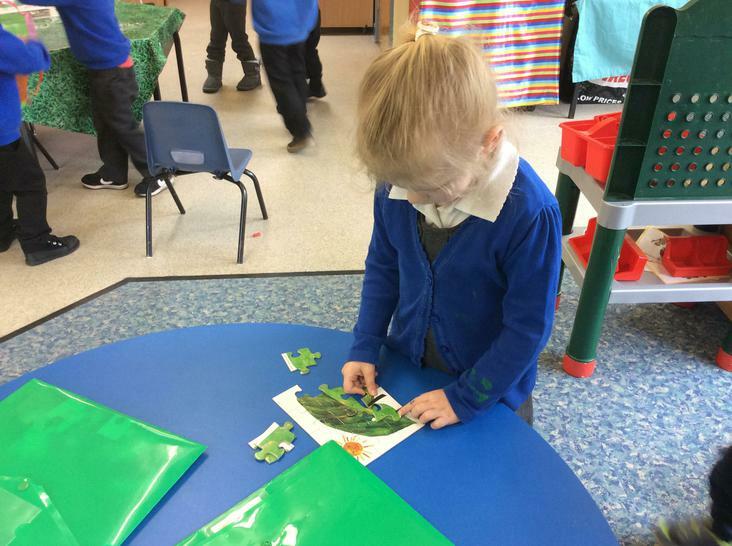 The children have enjoyed many planned activities: creating different landscapes, retelling the story, measuring using bear footprints and sequencing the story. 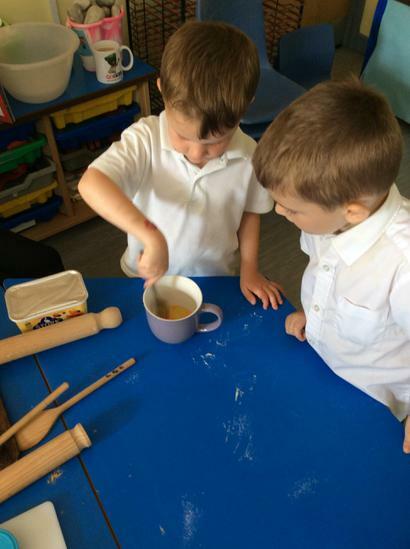 They also made and tasted pancakes on Tuesday. 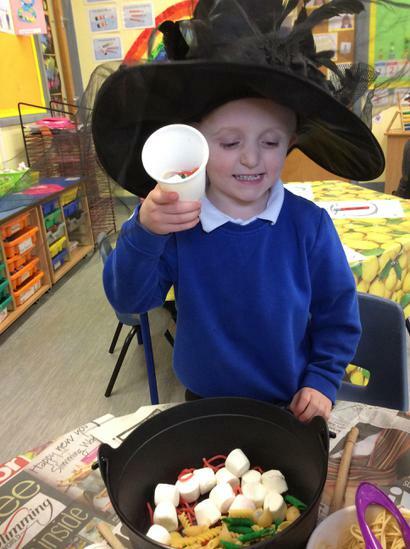 This half term we will be learning about Fairy Tales: Little Red Riding Hood, Goldilocks and The Three Bears and The Three Little Pigs. 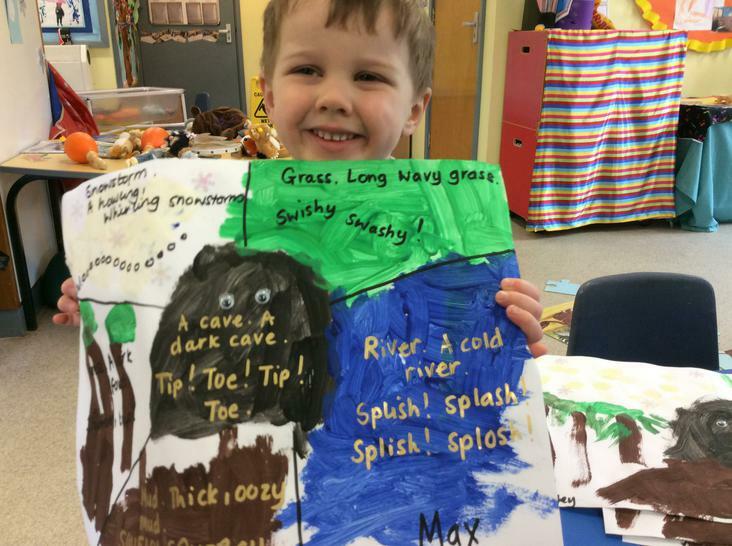 Also The Jolly Postman, Noah's Ark and Dinosaurs - Gigantasorous. 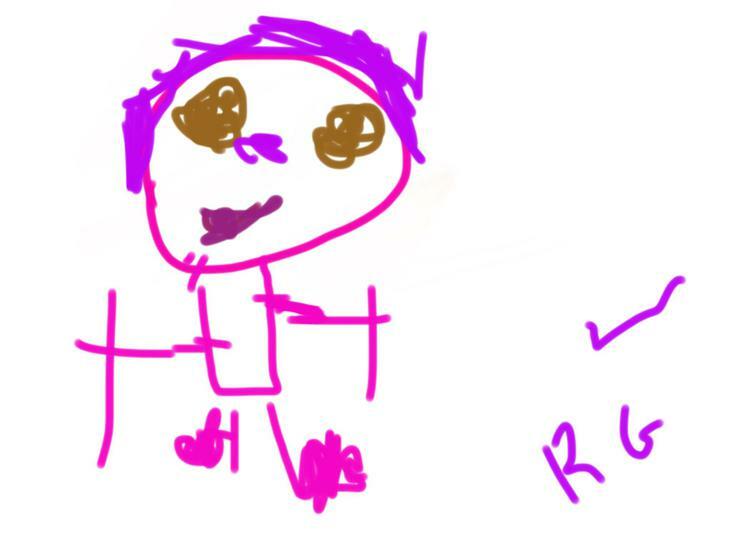 W/B 13/2/17. 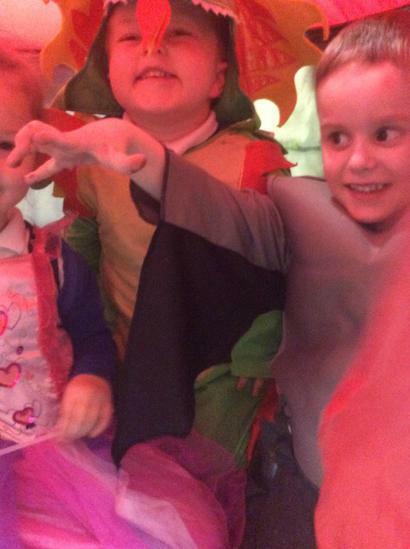 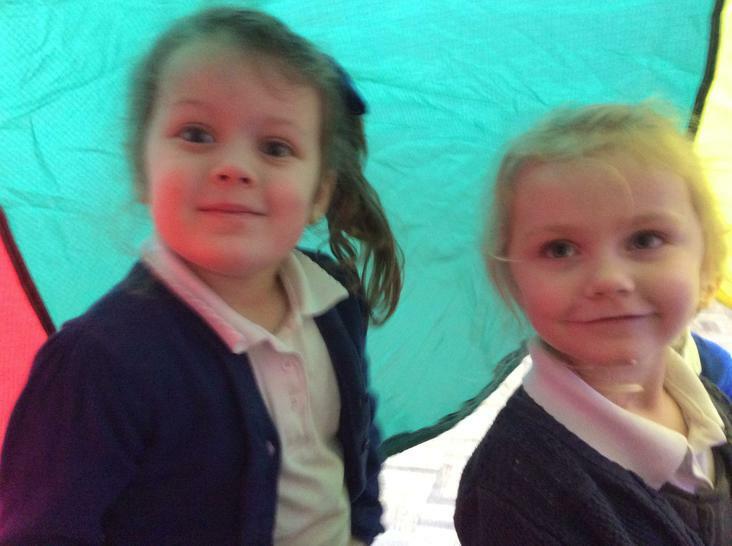 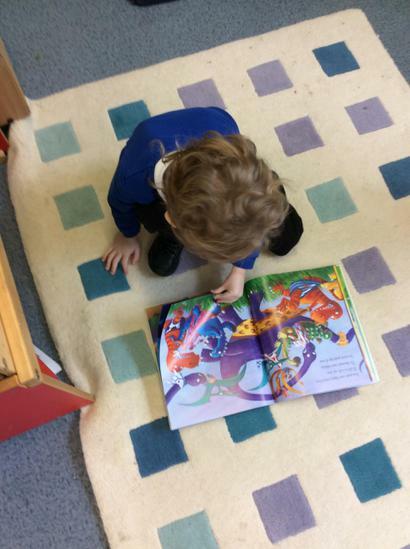 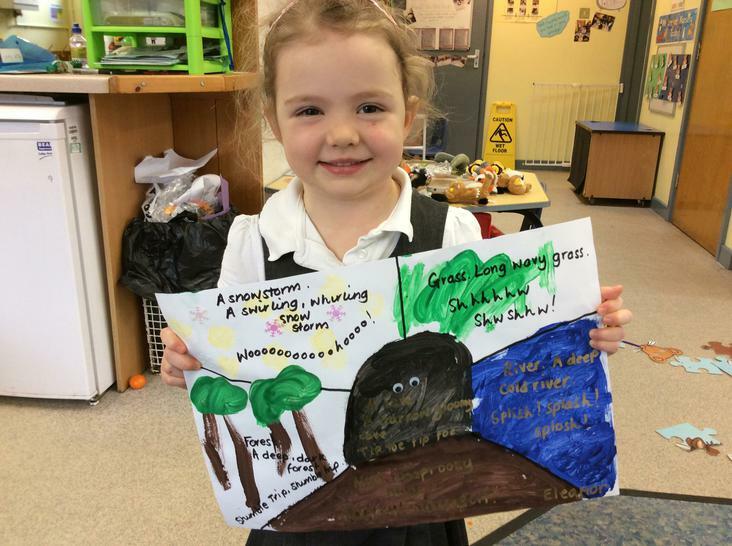 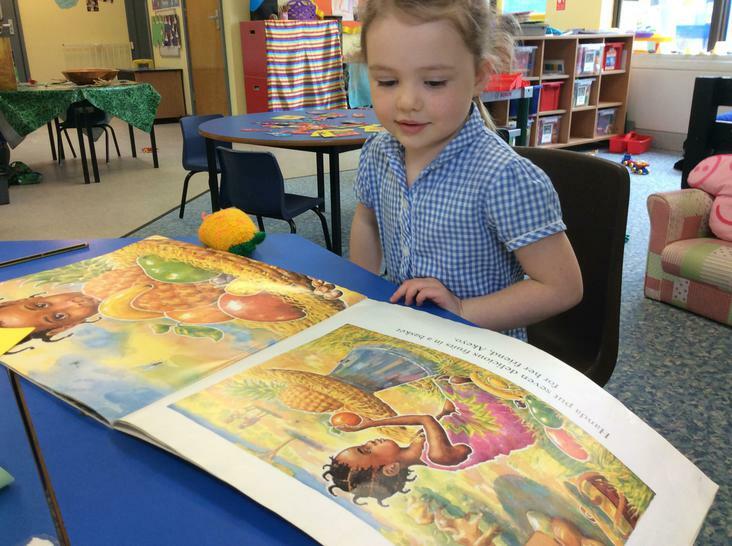 The children in Nursery have been learning all about dinosaurs and the book 'Gigantasorous'. 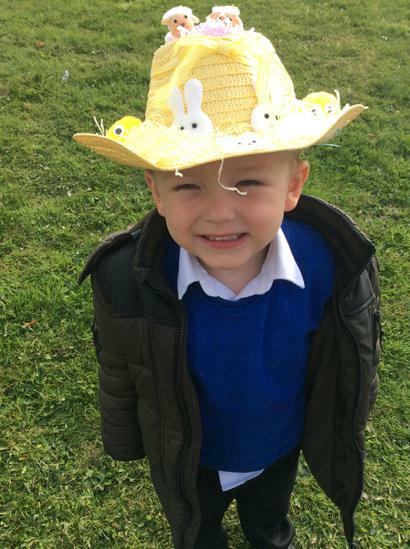 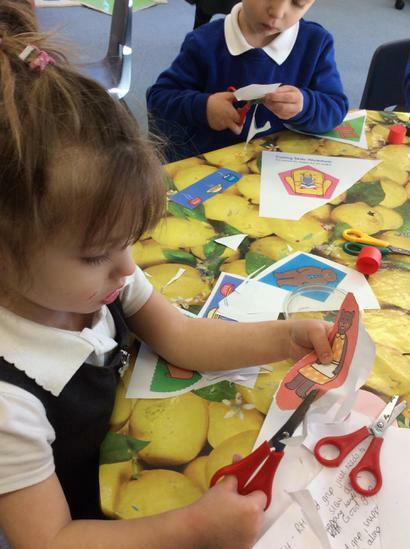 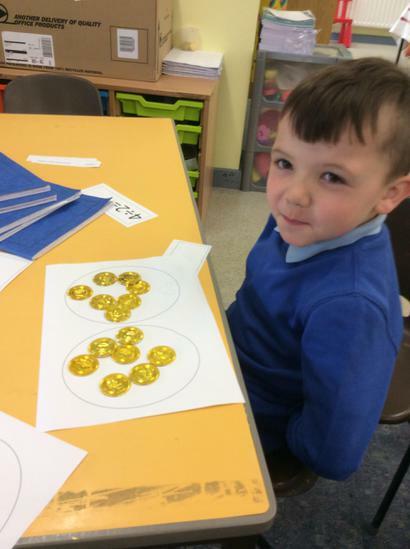 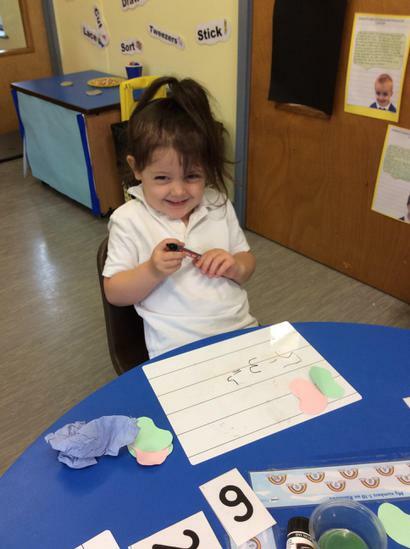 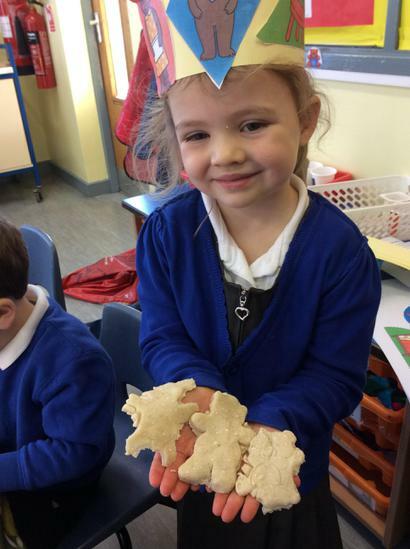 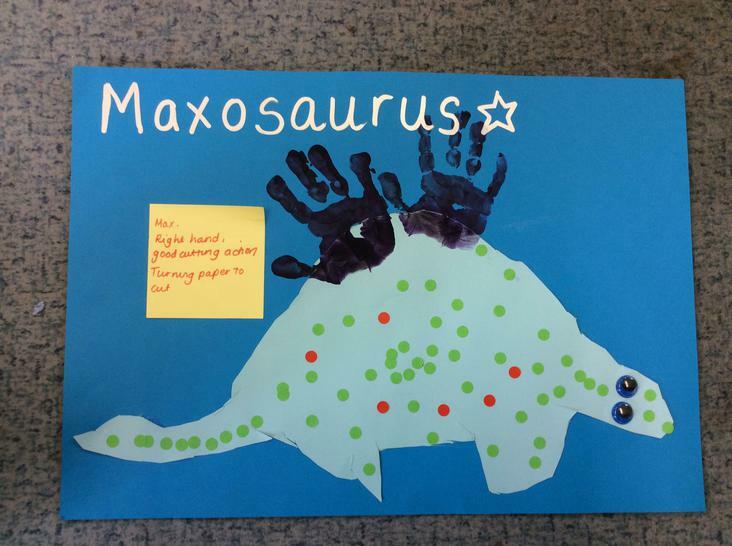 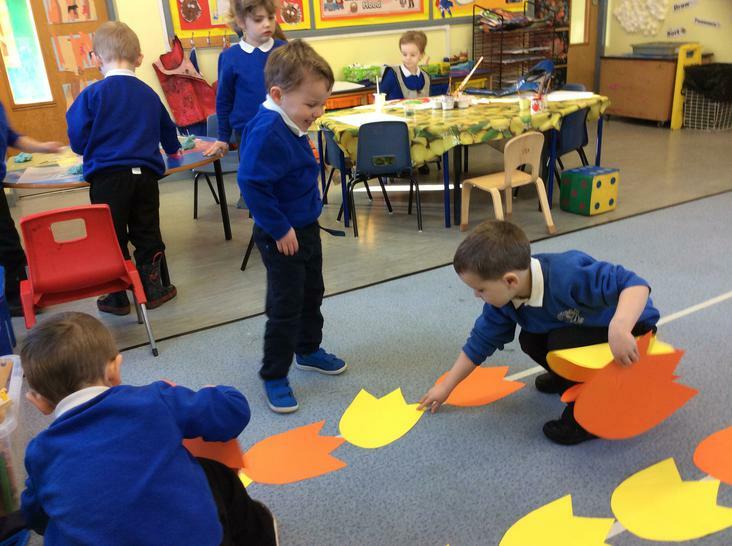 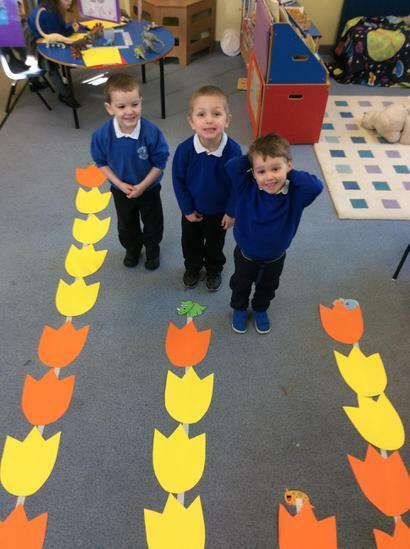 They have enjoyed many planned activities like: measuring using dinosaur feet, cutting and creating their own nameosaurus pictures, dinosaur shape pictures, creating nests for the dinosaurs eggs and footprint dinosaur cookies. 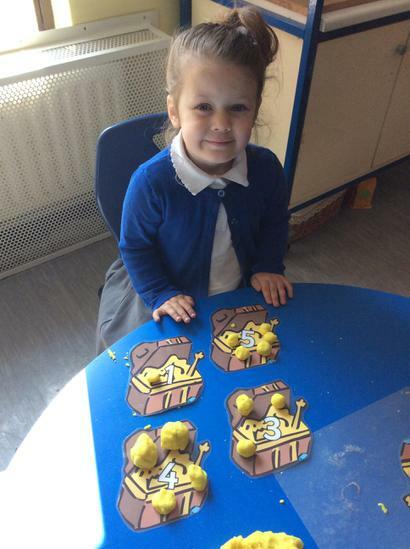 W/B 6/2/17 This week in Nursery the children have been learning about Noah's Ark. 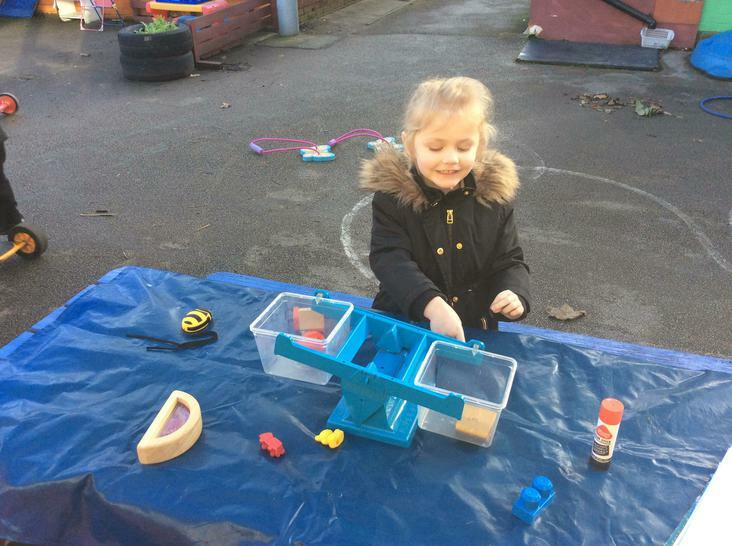 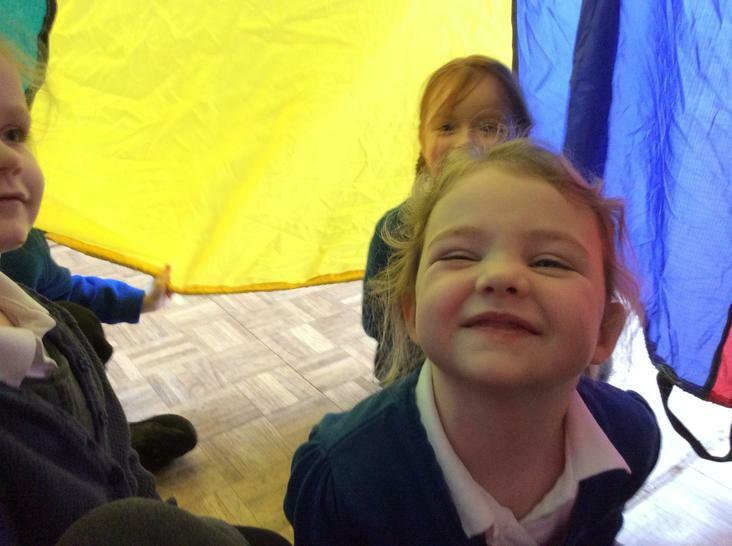 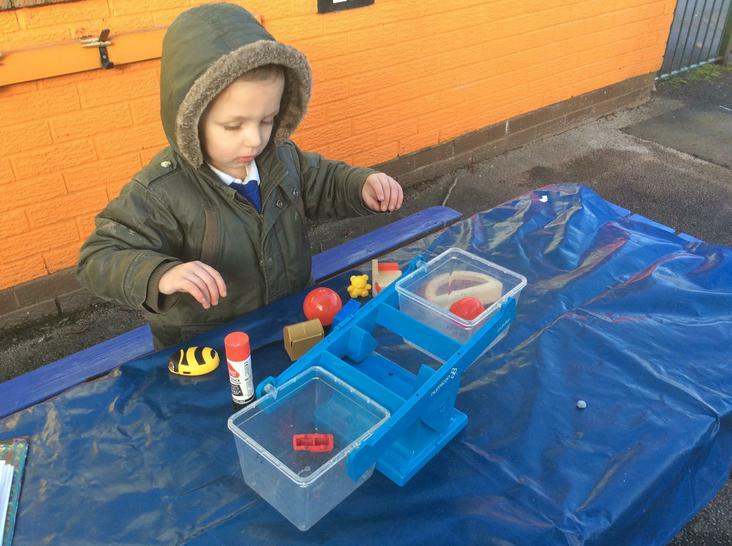 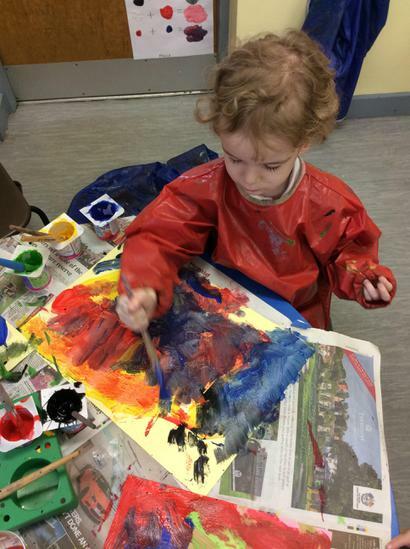 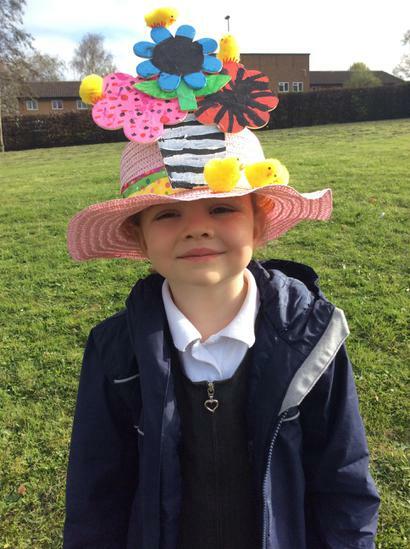 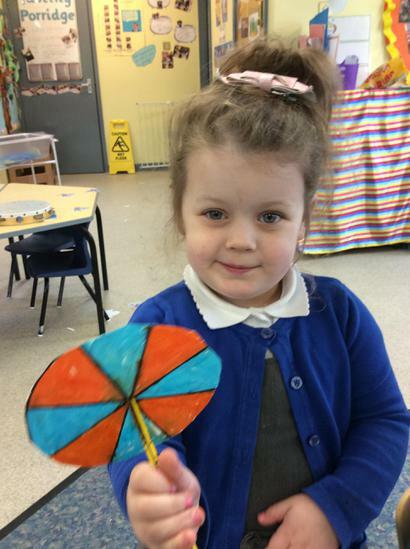 They have enjoyed many planned activities like: painting how to be a good friend rainbows, splatter painting, making clay/playdough boats and floating and sinking. 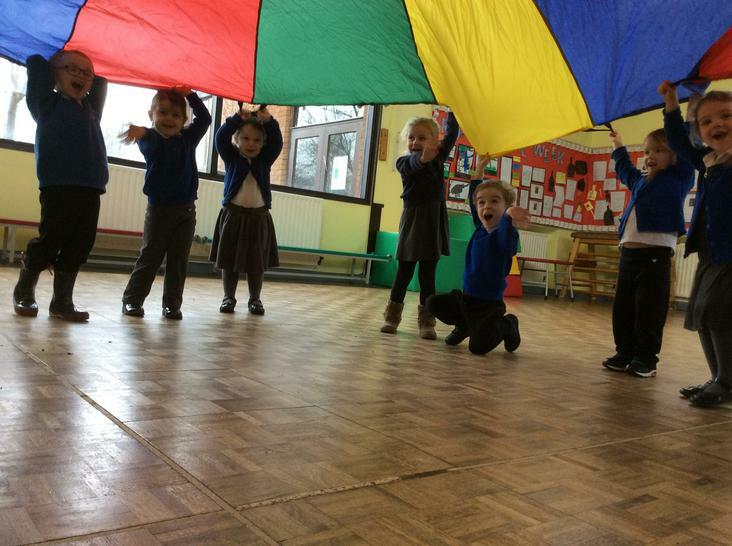 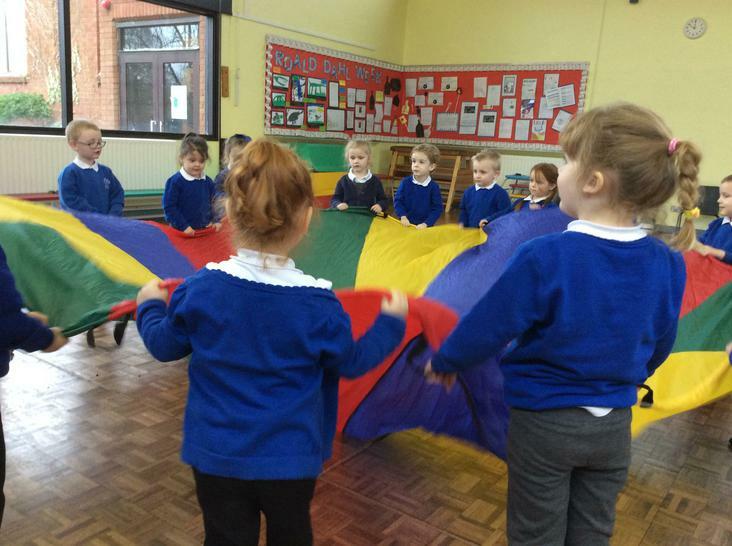 On Wednesday for P.E we all enjoyed ring games and parachute. 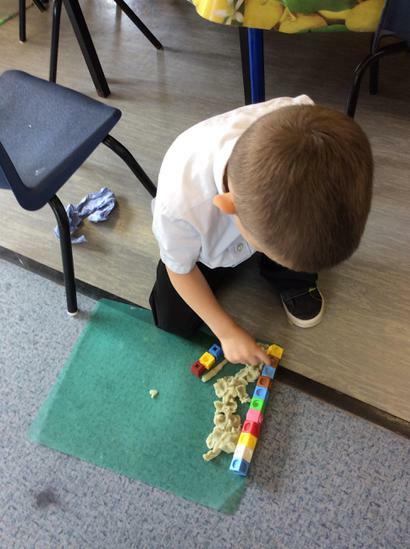 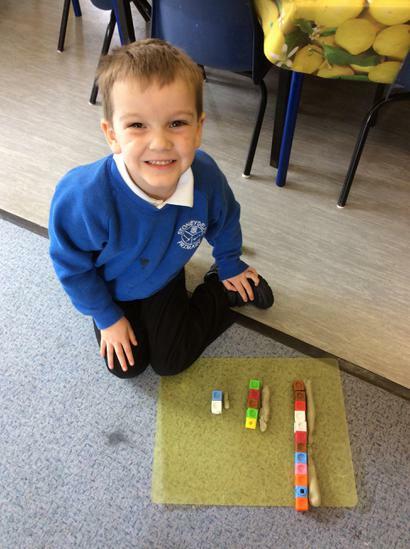 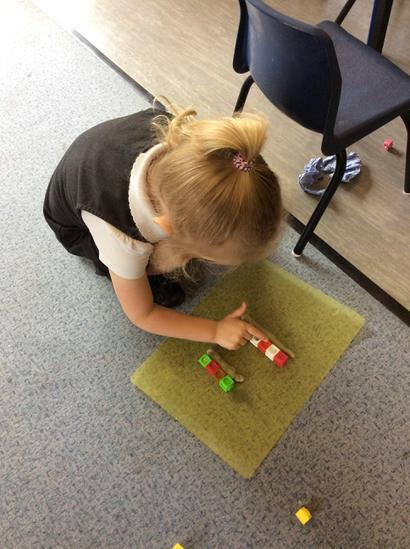 As a whole class on Friday we built a large train track as a team and the children enjoyed playing with the trains. 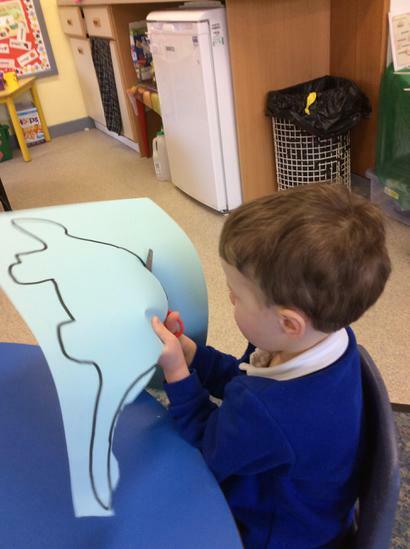 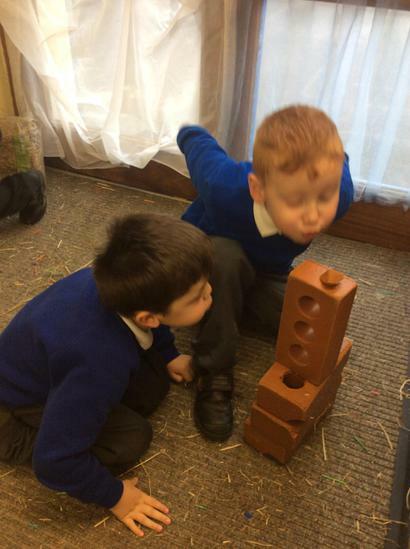 W/B 6/2/17 The children in Reception have been learning about Dinosaurs - Gigantasorous. 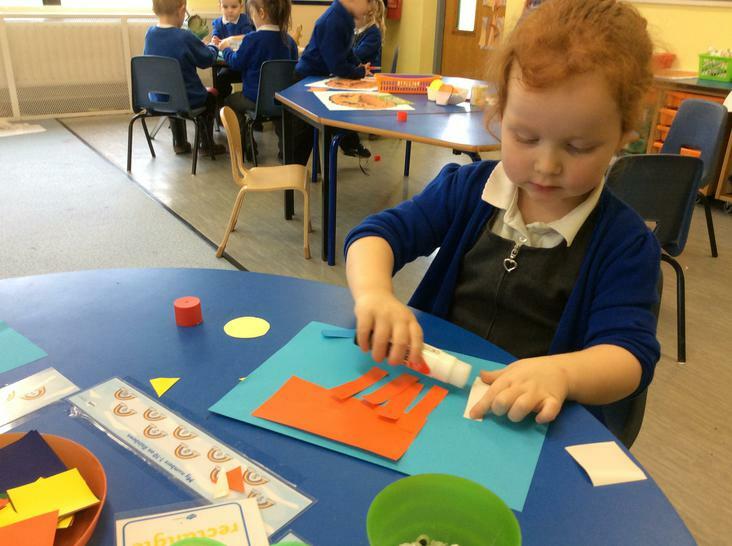 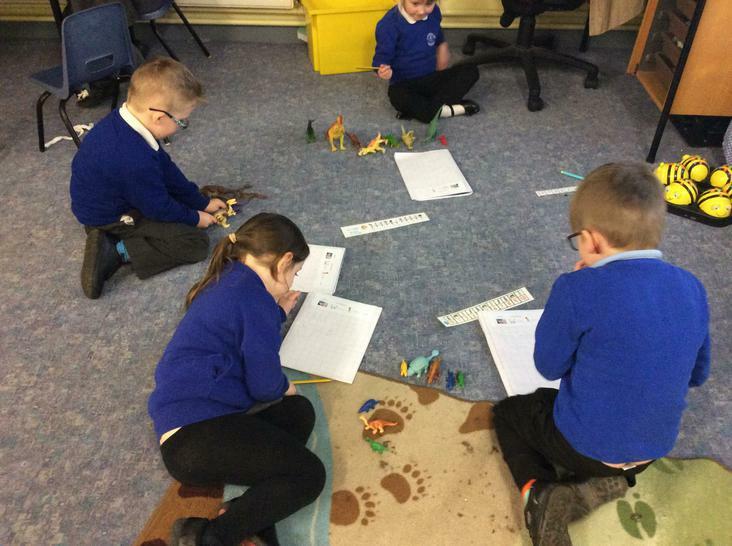 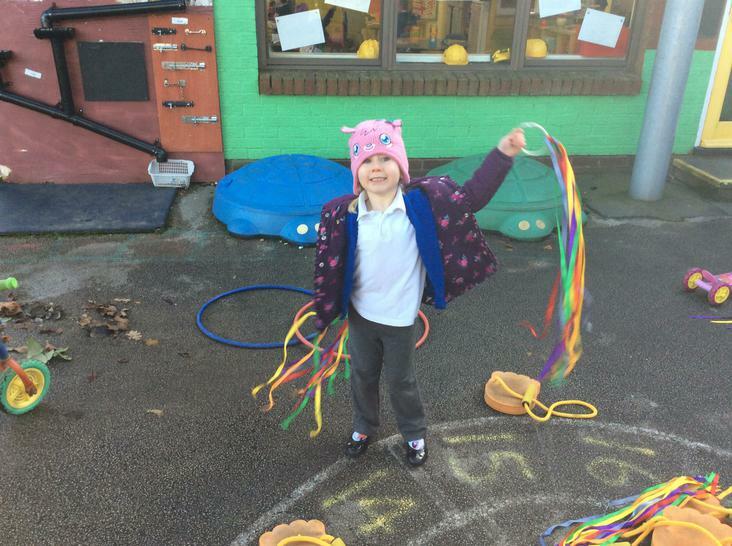 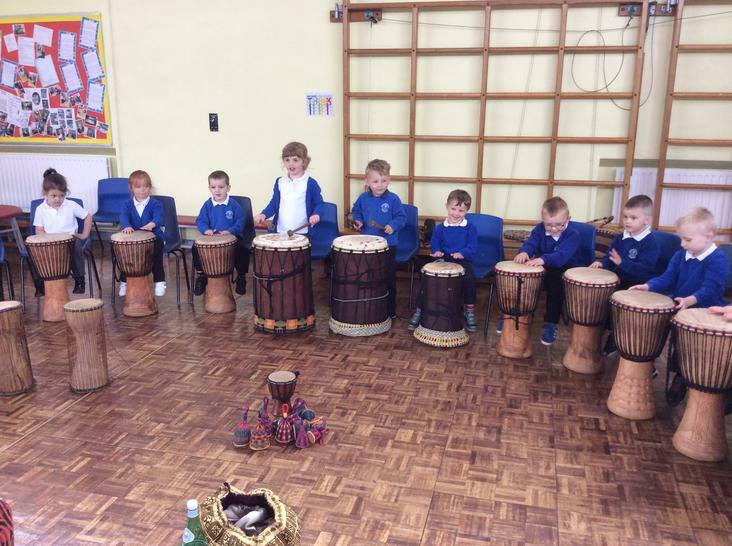 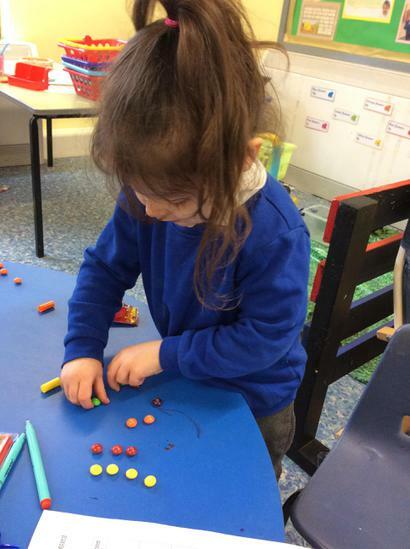 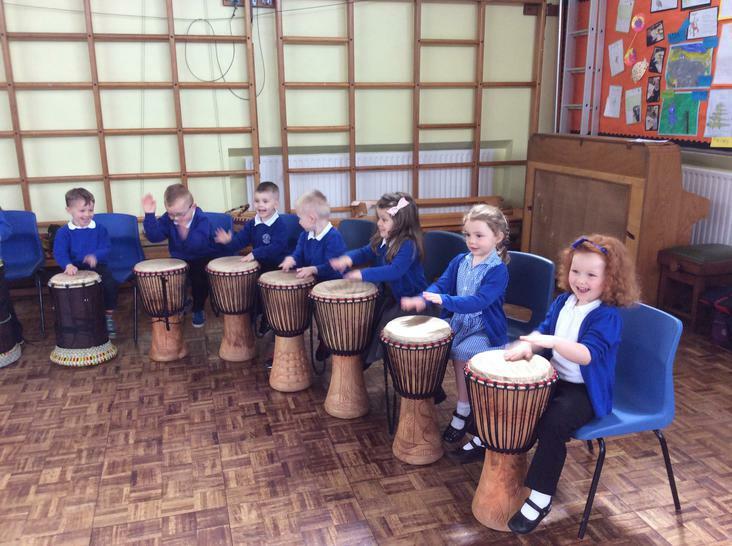 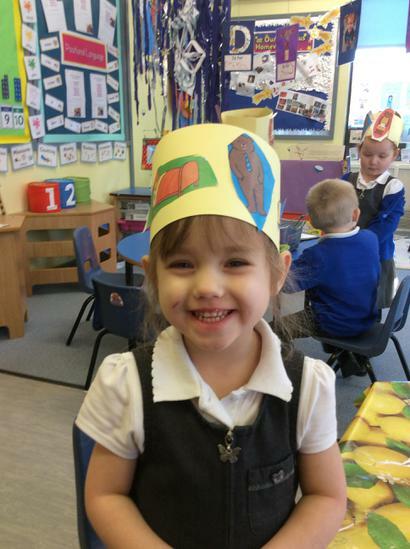 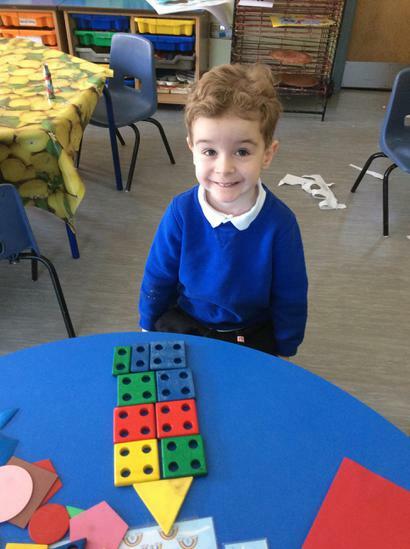 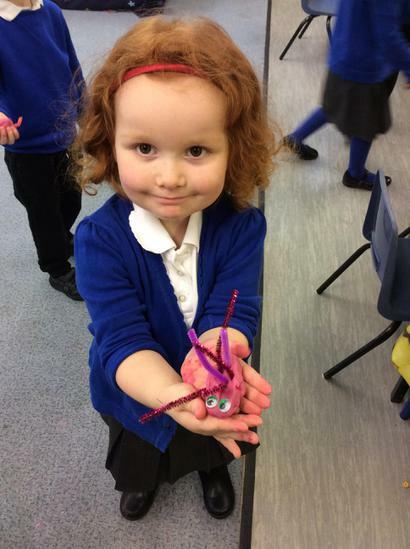 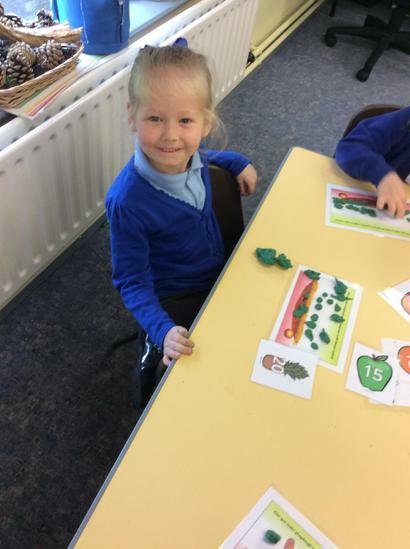 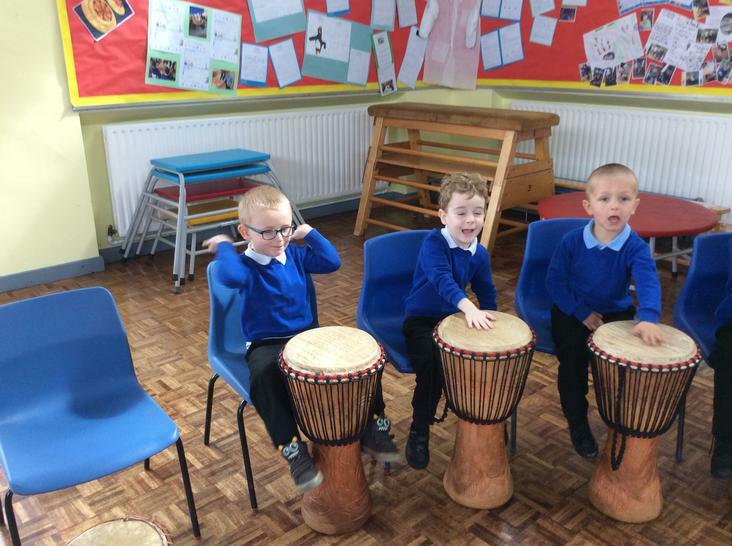 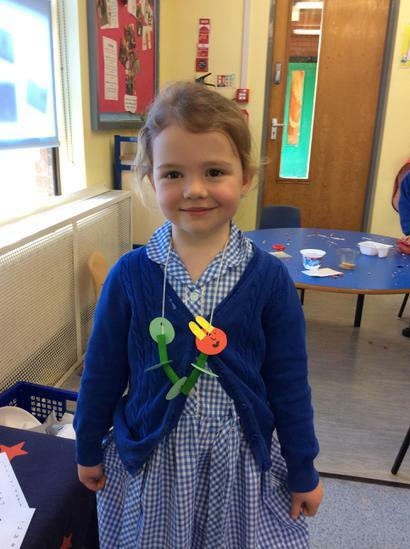 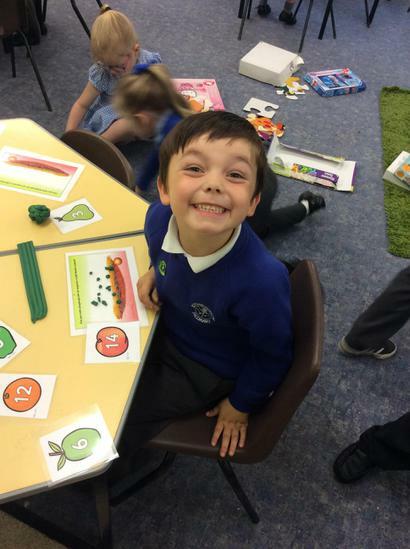 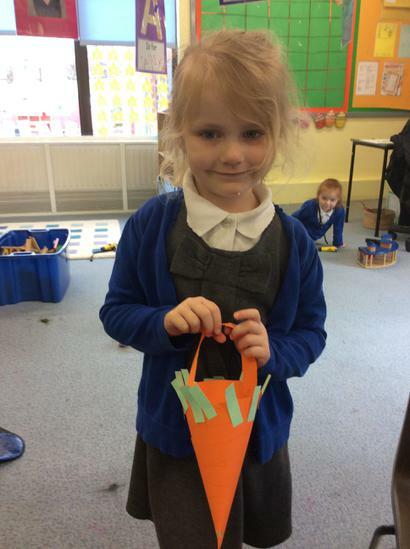 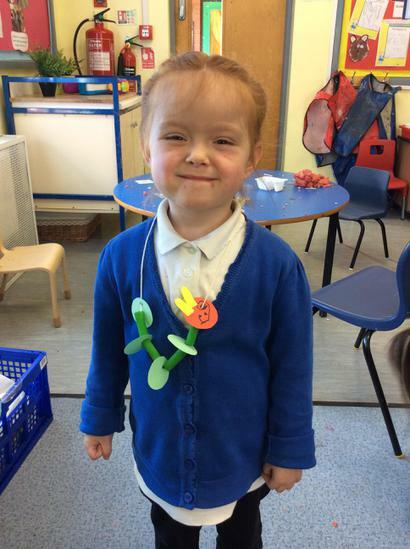 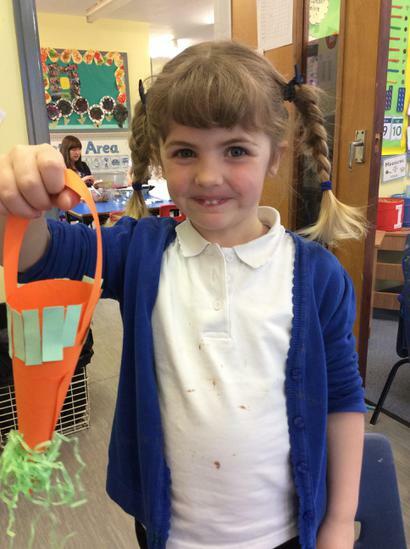 They have enjoyed planned activities like: writing an end to a story, shape dinosaurs, repeating patterns and making dinosaur eggs and skeletons. 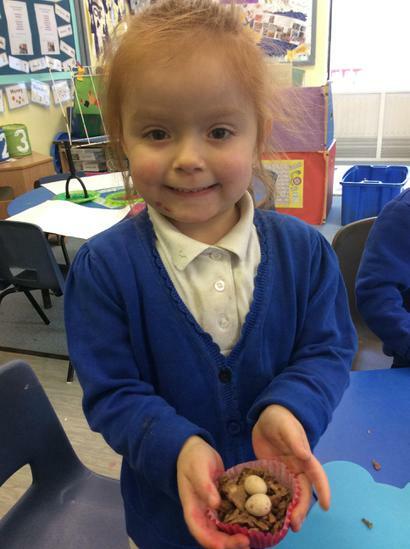 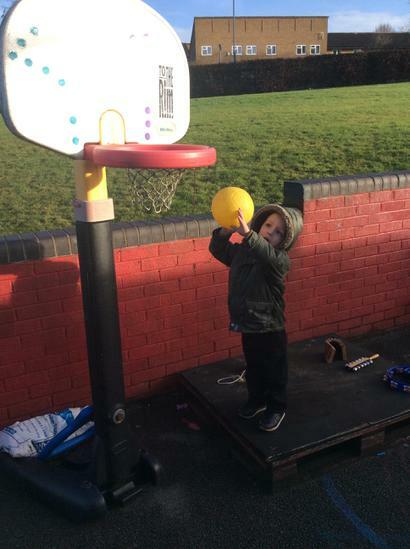 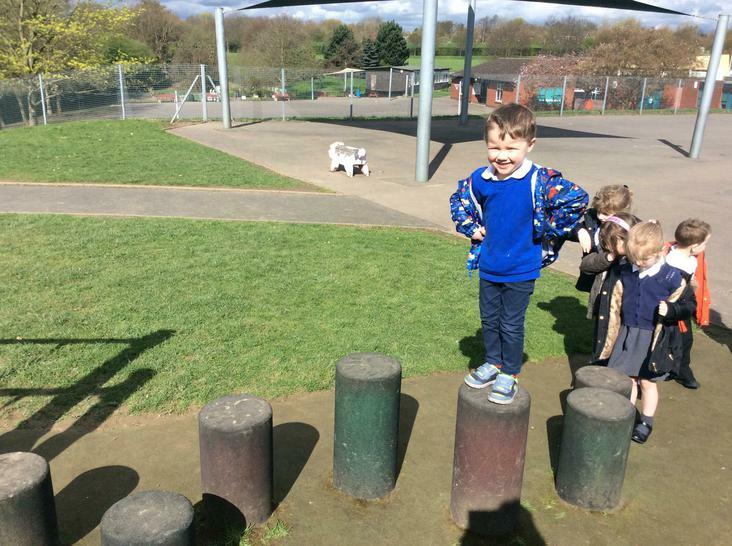 In their P.E session on Friday the children worked in teams to steal the dinosaur eggs. 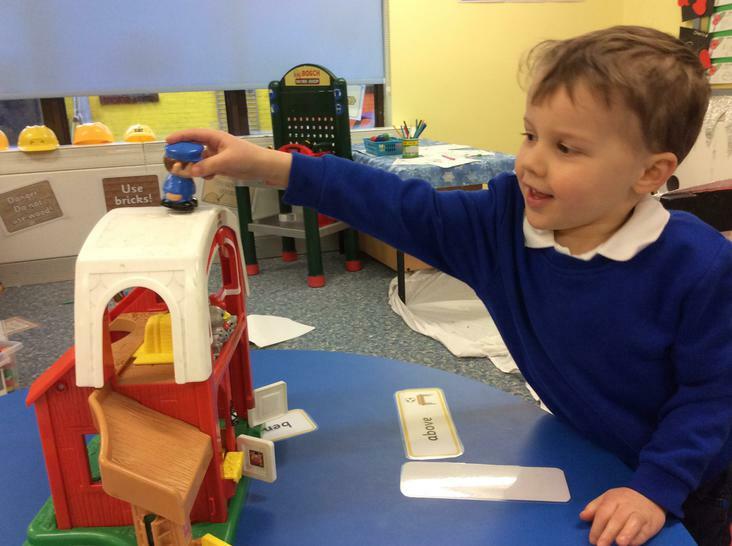 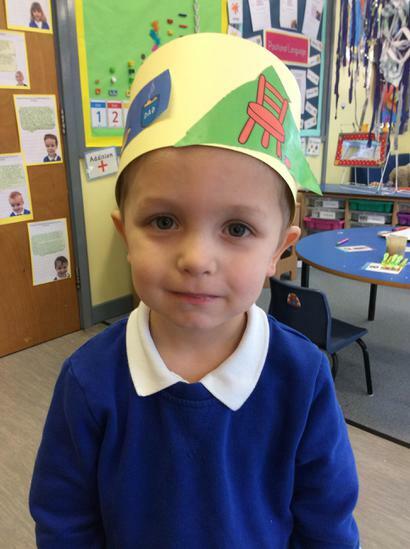 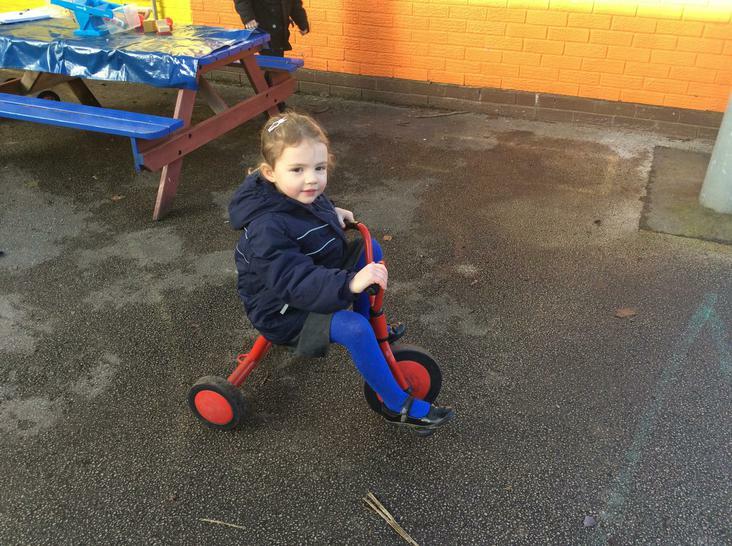 W/B 30/1/17 The children in Nursery have been learning about The Jolly Postman. 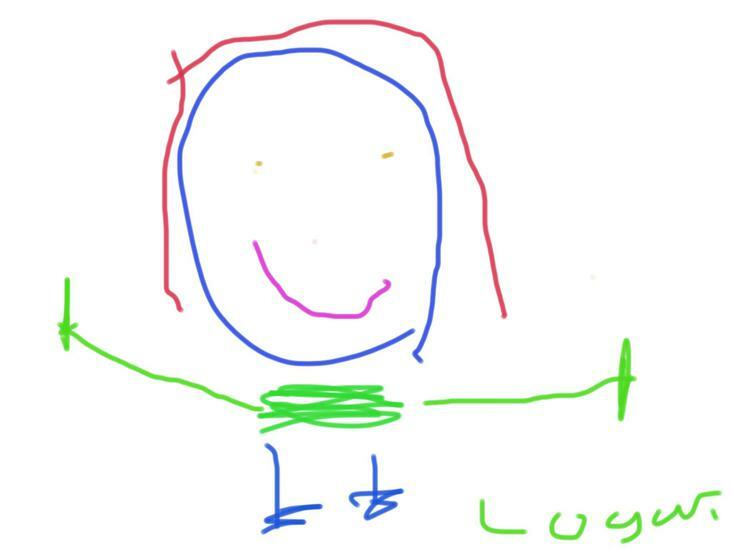 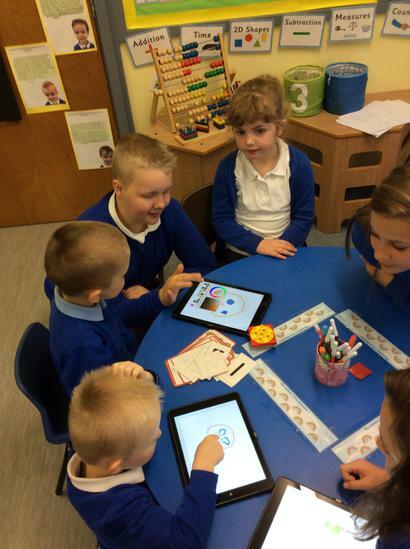 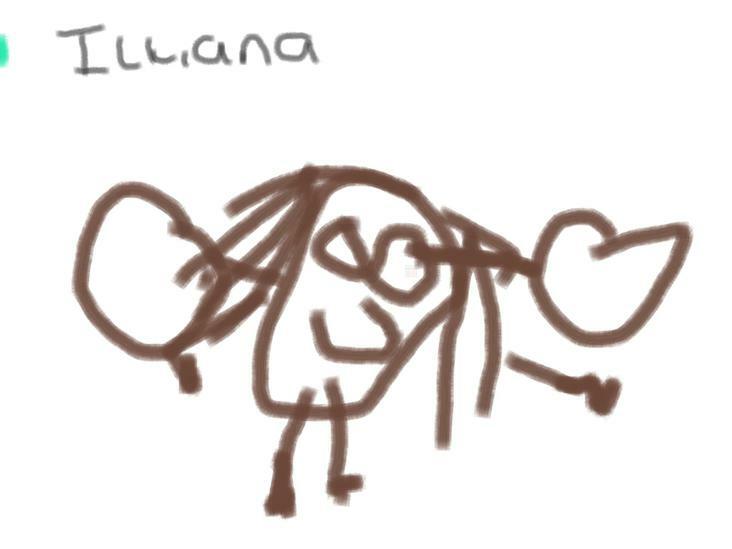 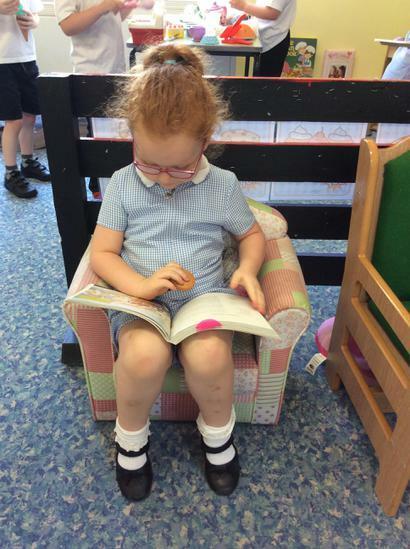 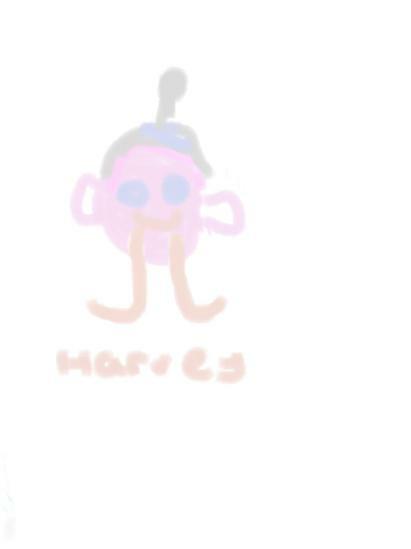 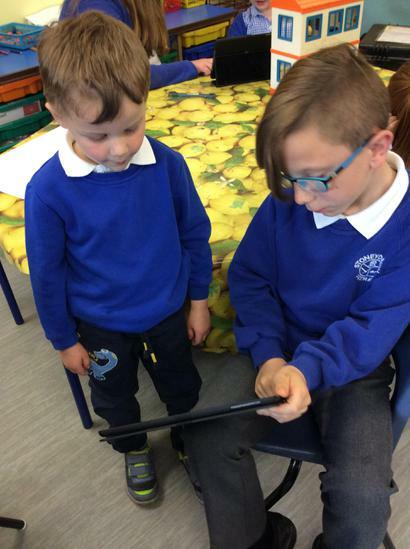 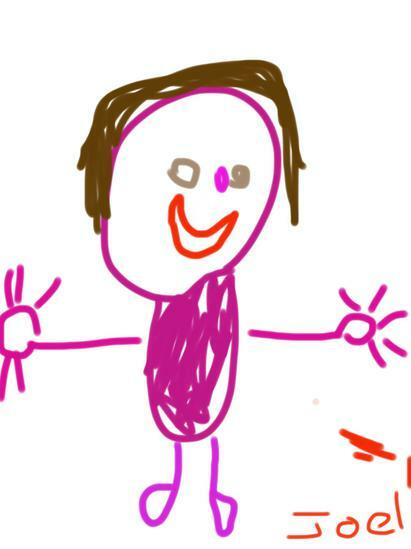 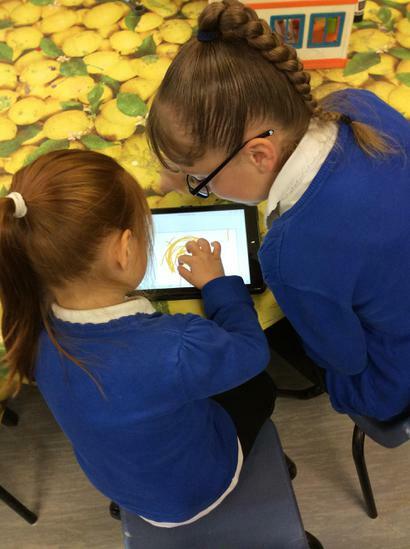 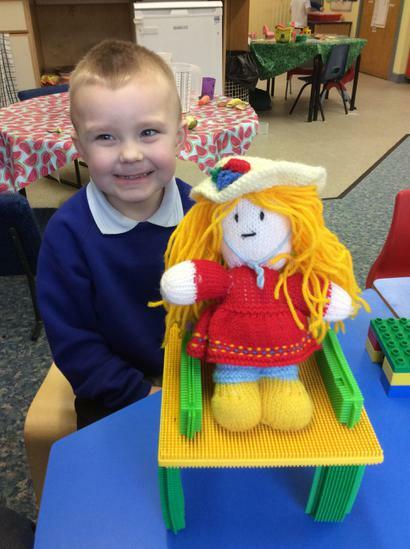 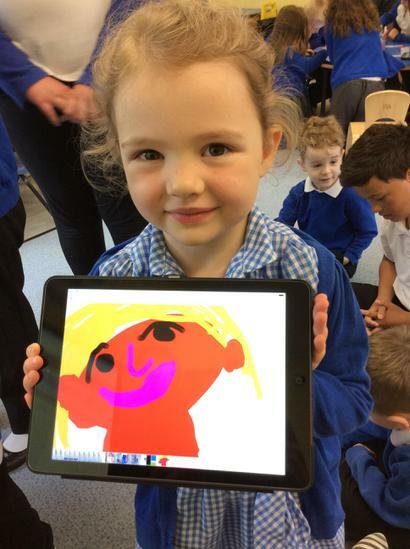 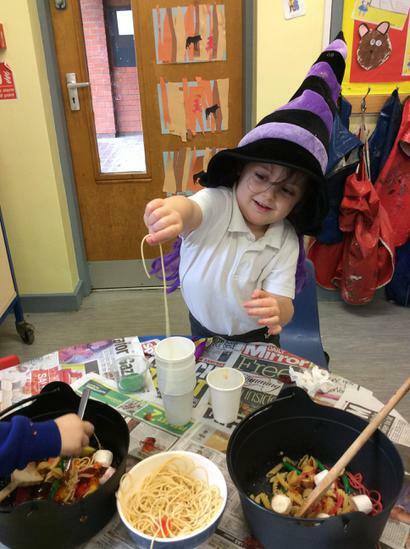 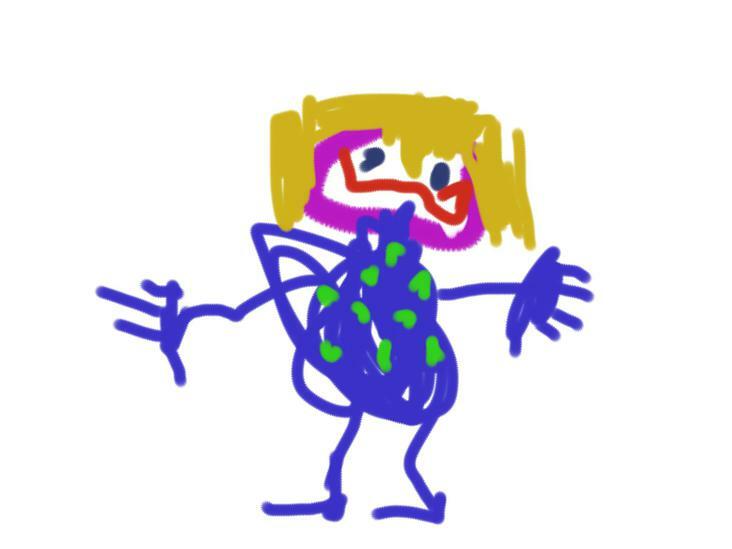 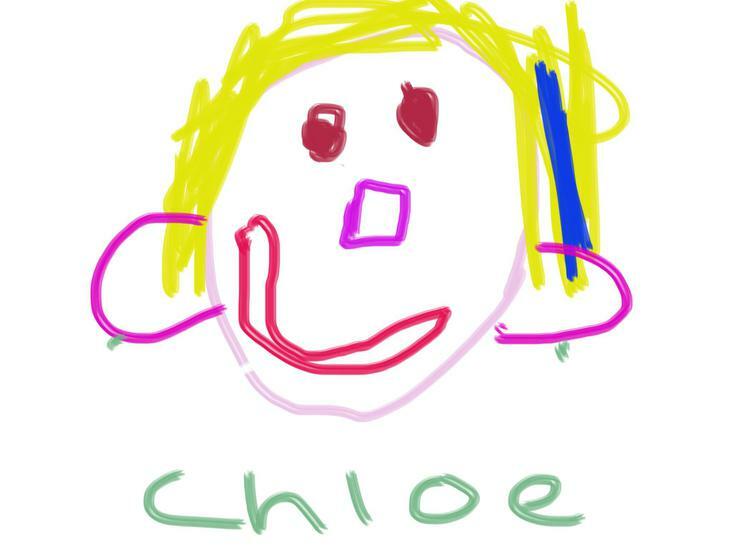 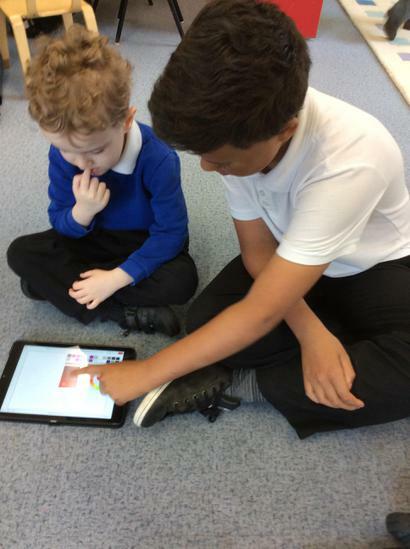 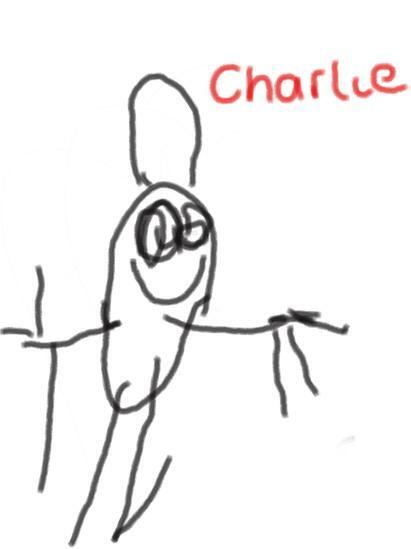 They have enjoyed many planned activities like: making magic potions, drawing and labelling a map for the Jolly Postman, drawing pictures of the characters on iPads and painting a picture from the story. 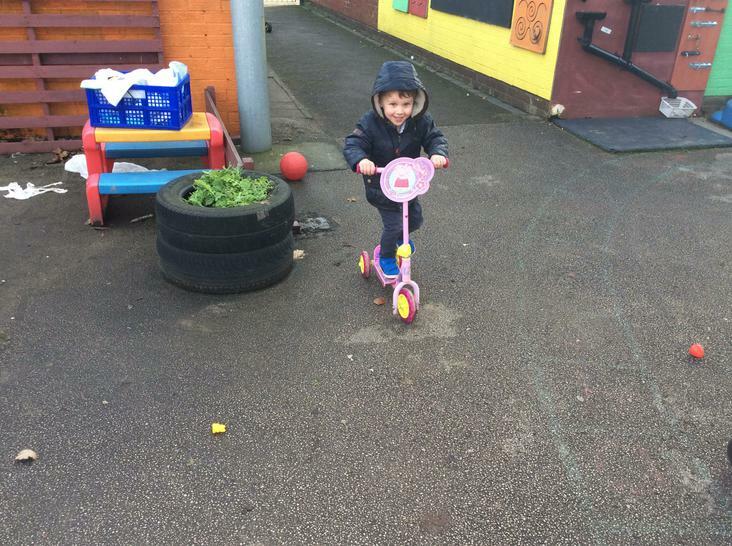 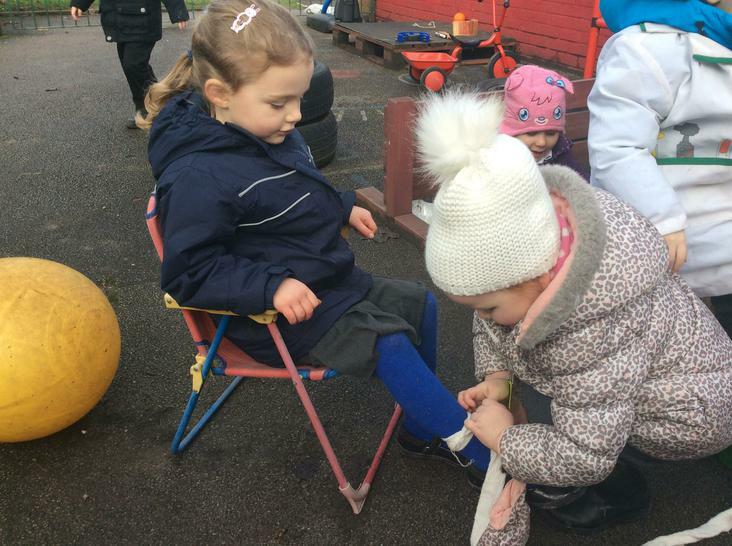 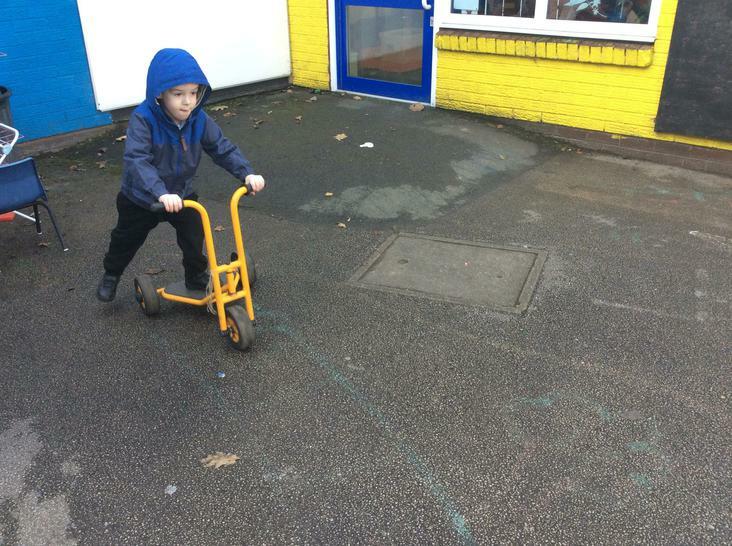 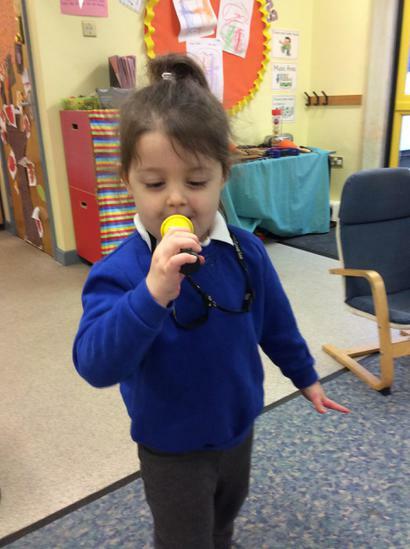 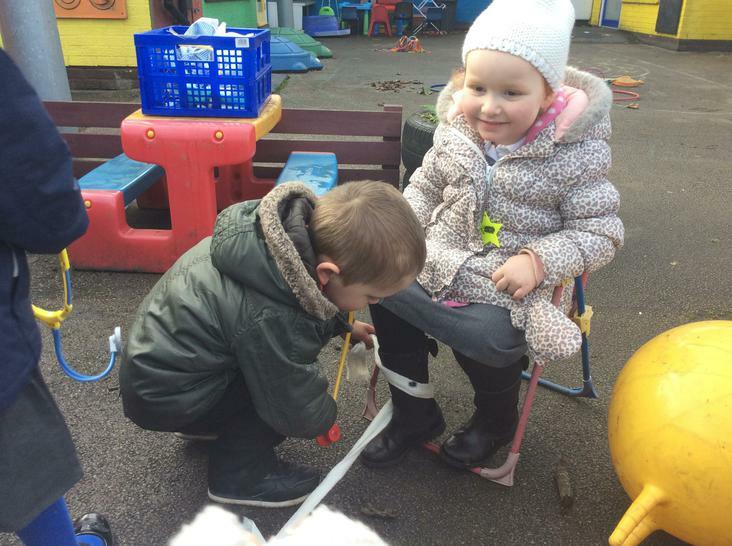 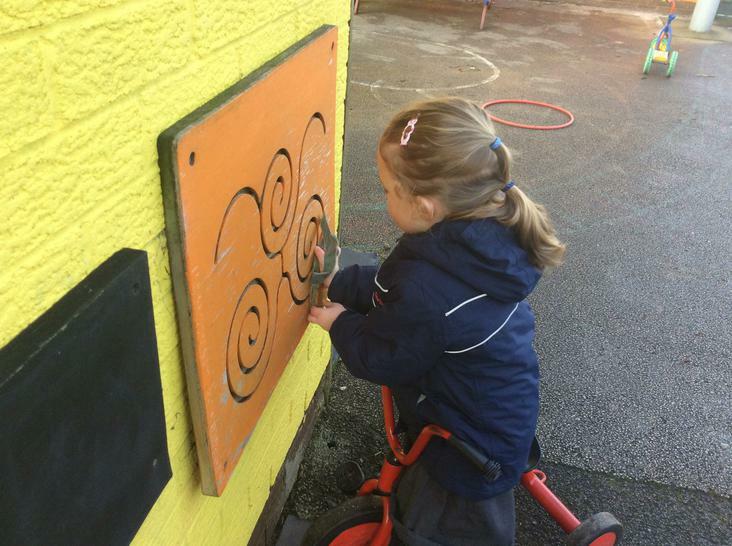 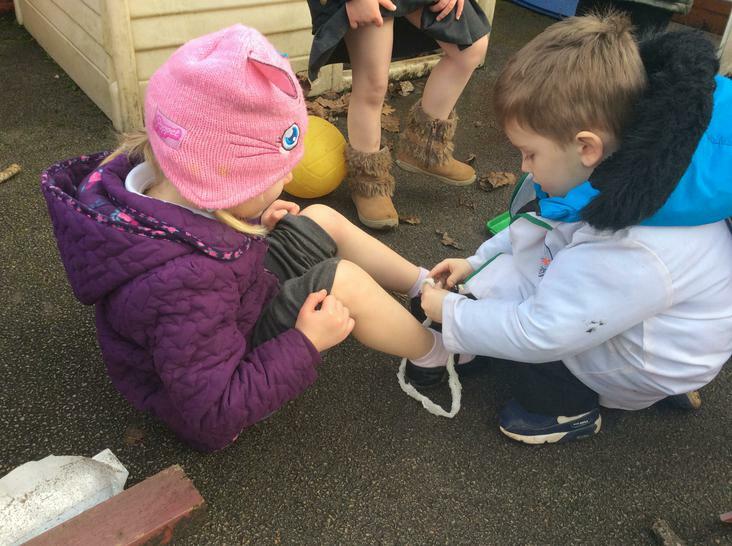 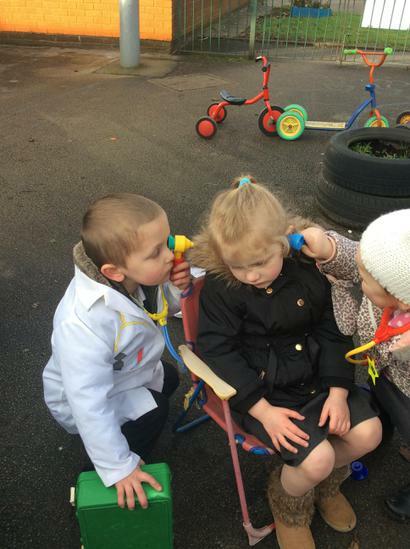 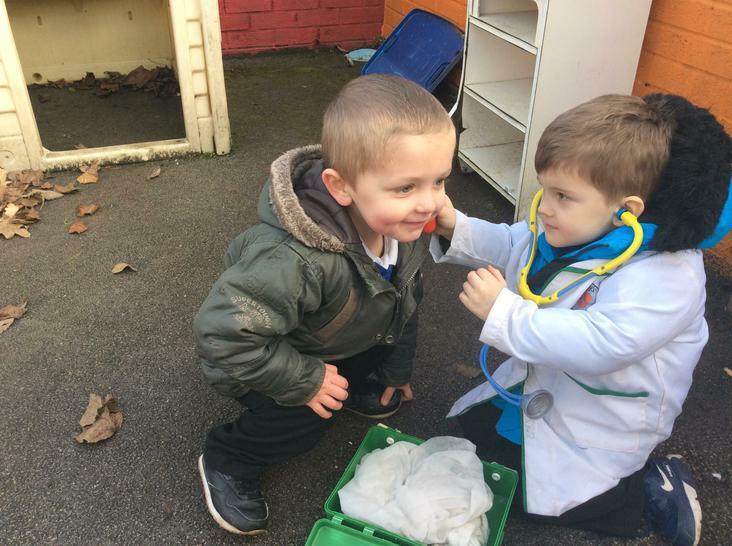 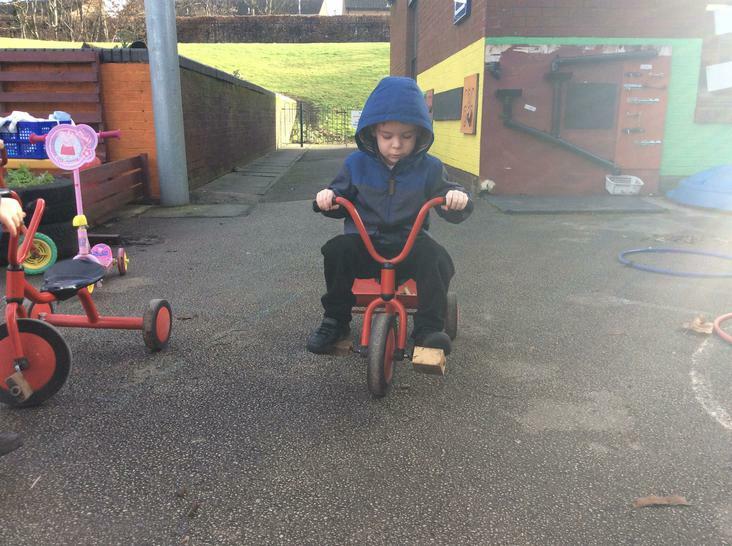 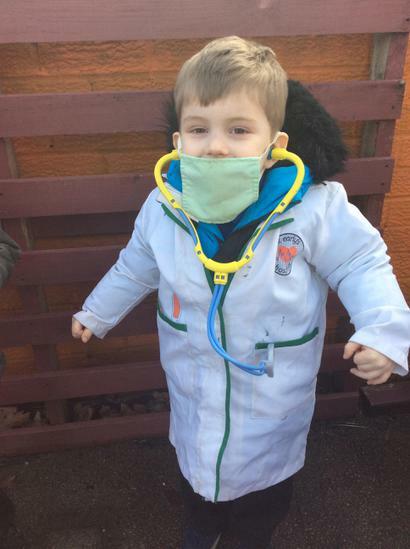 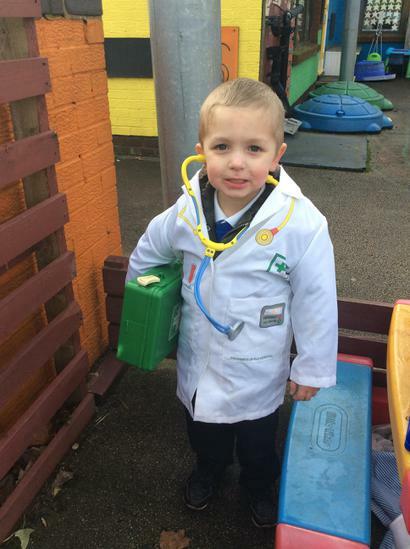 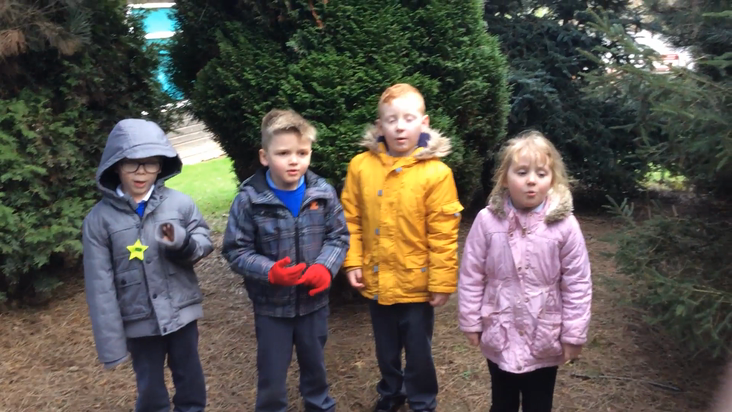 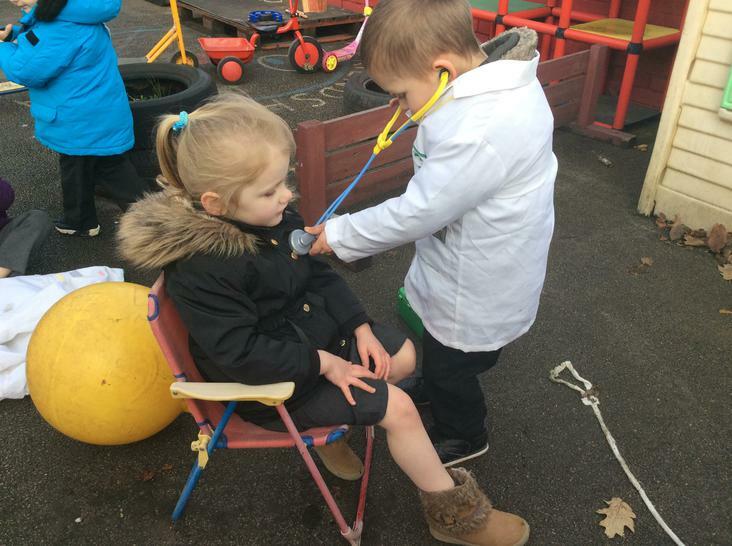 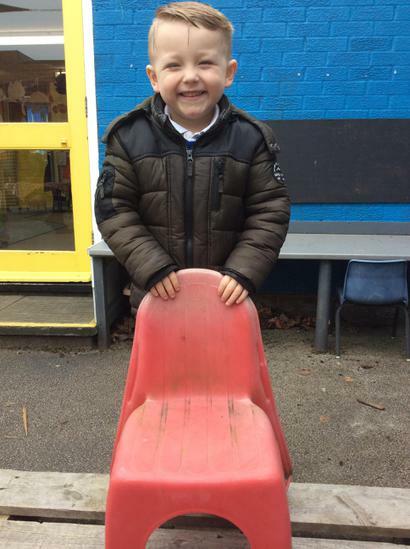 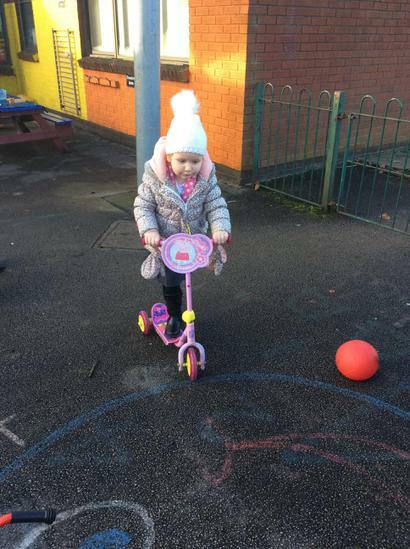 We have been practising outside on bikes and scooters and role playing doctors. 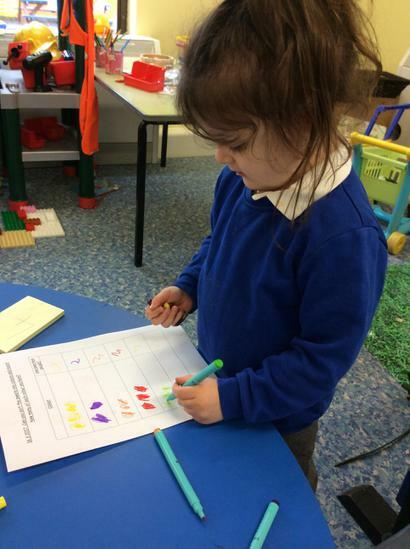 W/B 30/1/17 The children in Reception have also been learning about The Jolly Postman. 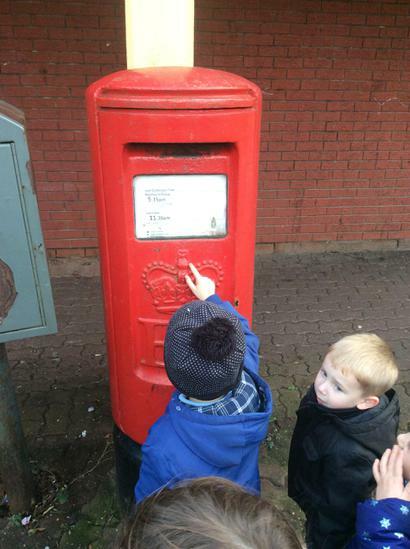 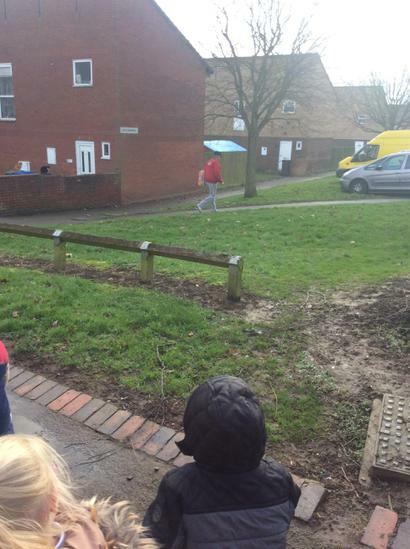 The children wrote letters to fairy tale characters, went for a walk to the post box and posted their letters. 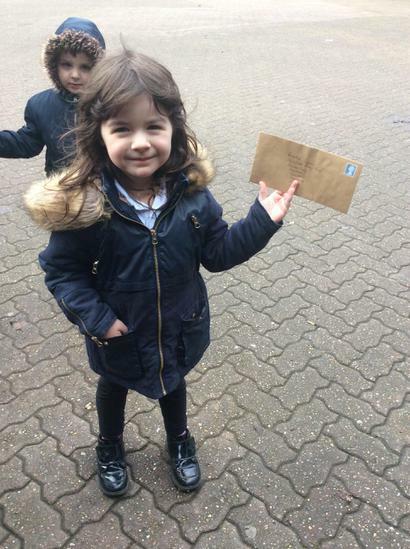 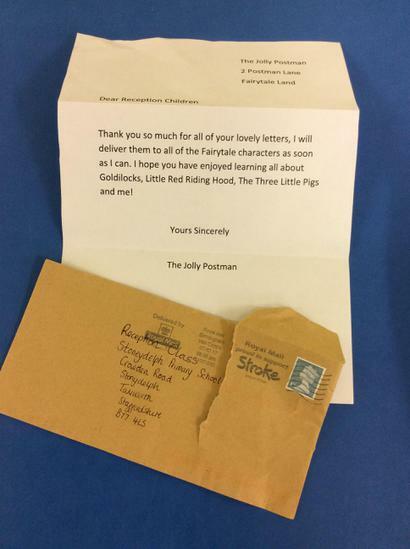 On Friday the children received a letter back from The Jolly Postman. 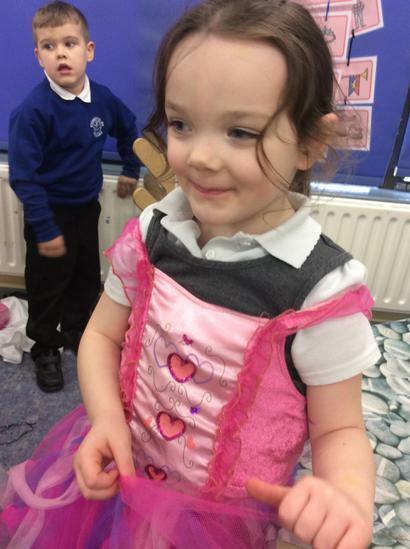 W/B- 23/01/17 - This week in Nursery we have been learning about Little Red Riding Hood. 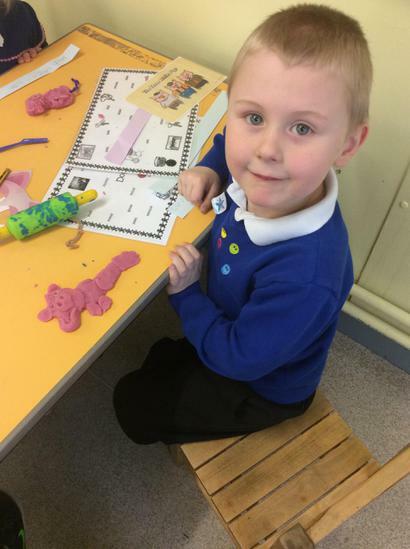 The children have been making wolves out of play dough, painted pictures from the story, played a dice game in groups and many more planned activities. 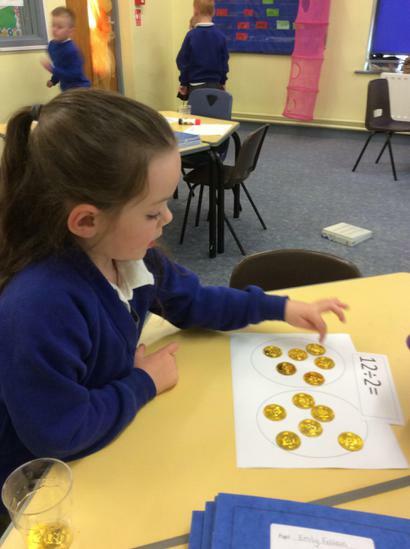 W/B 23/01/17 - The children in Reception have been learning about Goldilocks and the Three Bears. 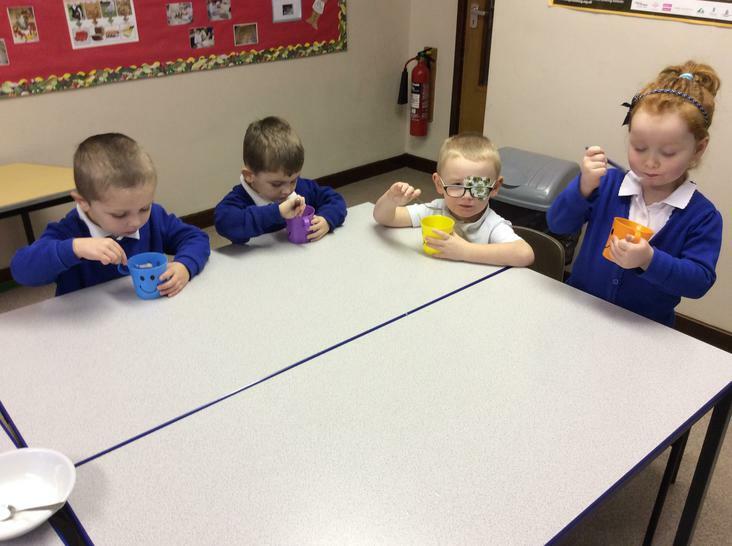 They have been retelling the story, tasting porridge, writing instructions on how to make porridge and many more planned activities. 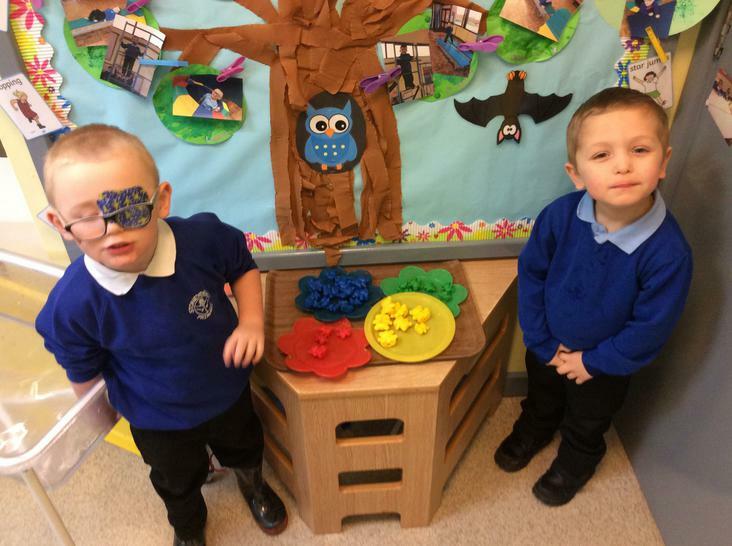 The Three Bears are not happy! 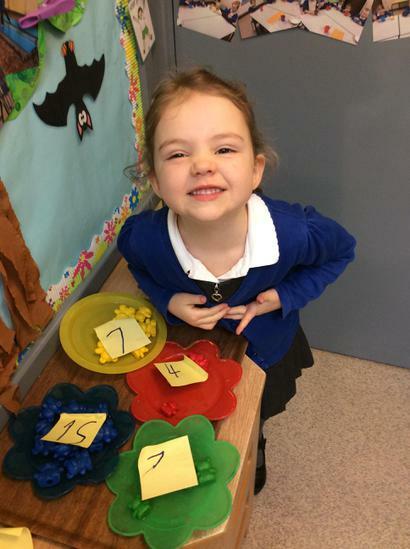 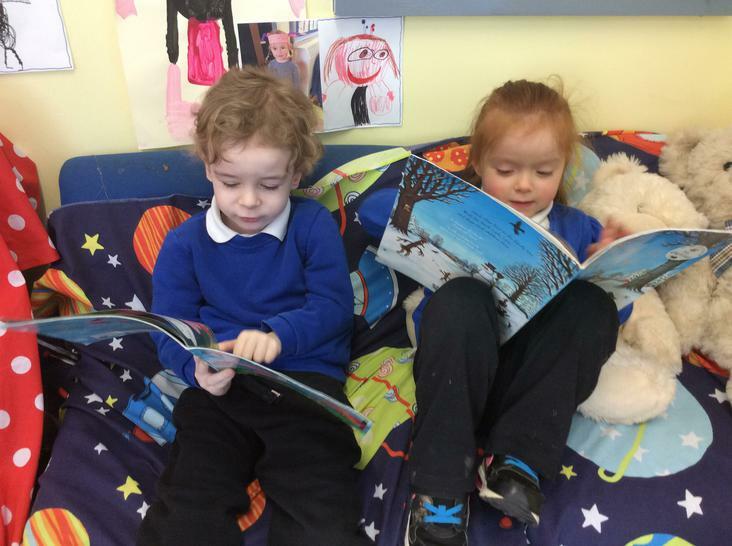 W/B 16/01/17 - In Nursery this week we have been learning about Goldilocks and Three Bears. 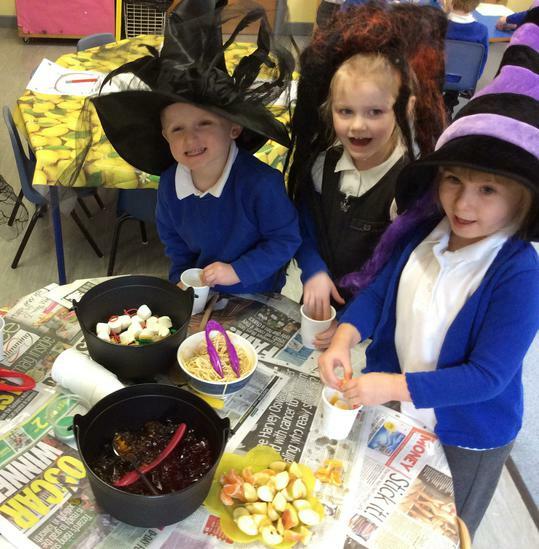 The children have helped to make and tasted porridge, wrote shopping lists, made hats and many more planned activities. 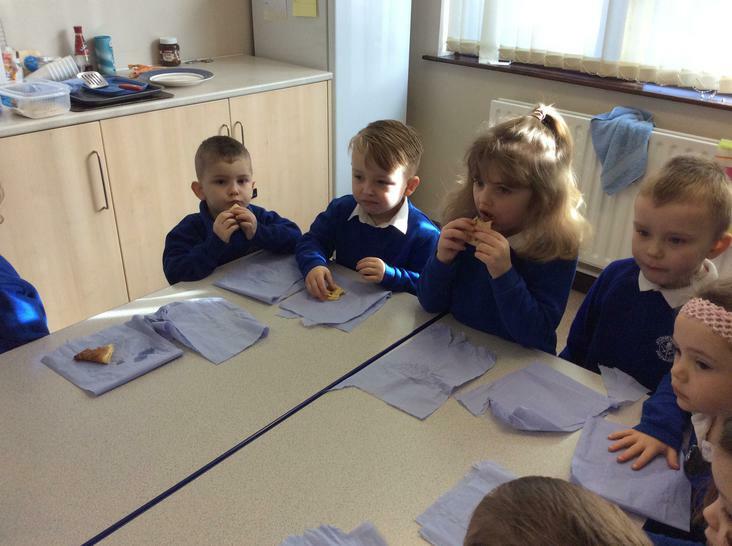 W/B 16/01/17 - In Reception this week the children have been learning about The Three Little Pigs. 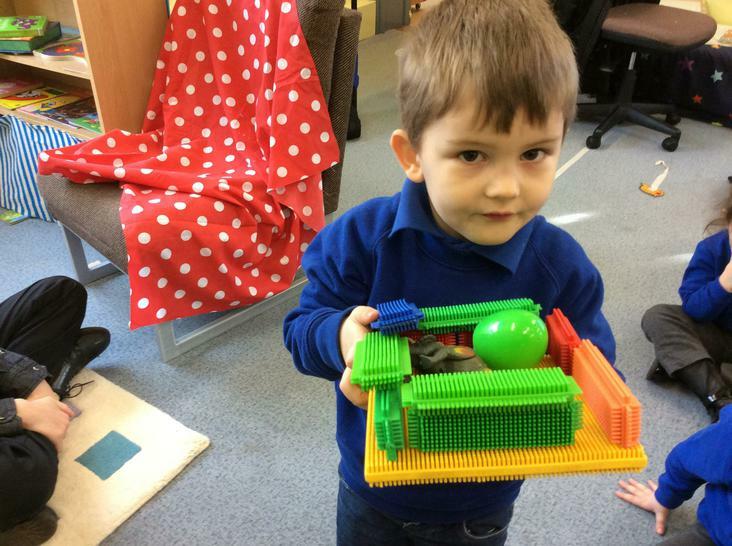 Building The Three Pigs houses, playdough pigs, matching objects to numbered magic wands and many more planned activities.